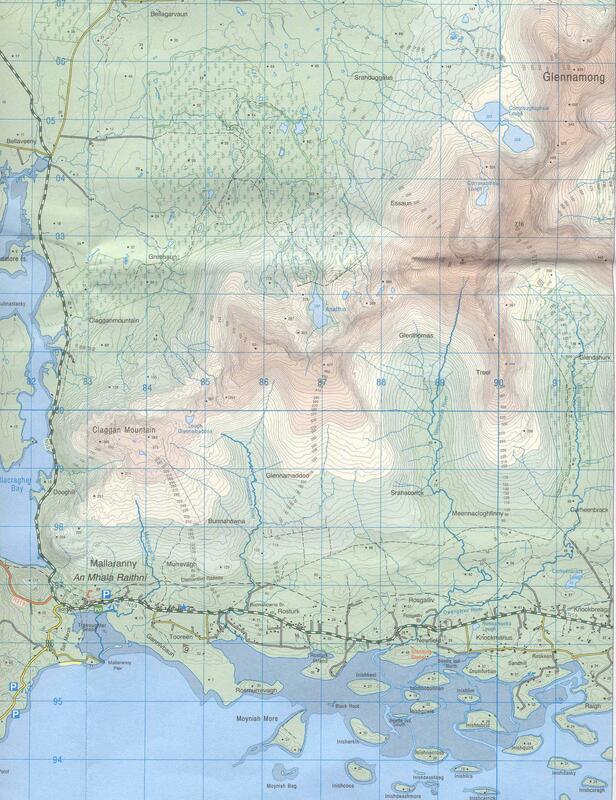 Killeen Cemetery is located along the north shore of Clew Bay west of Newport between Rockfleet and Roskeen just north of Raigh (see map). 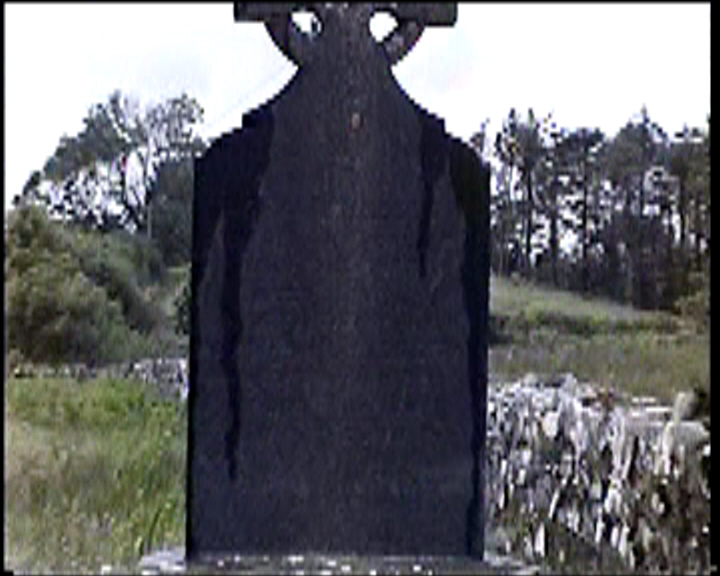 There is a monument there honoring St. Brendan's well. 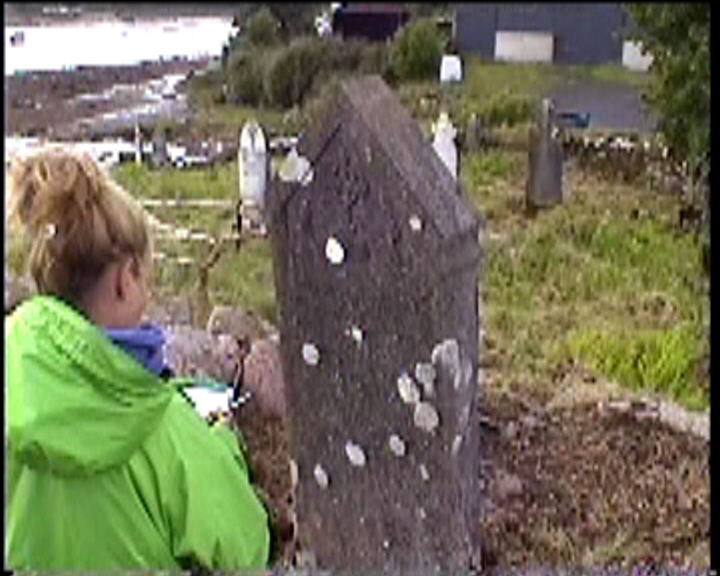 I visited the cemetery in July of 2004 and videotaped headstones as I walked among the graves (in between rain showers), then transcribed these after returning home. 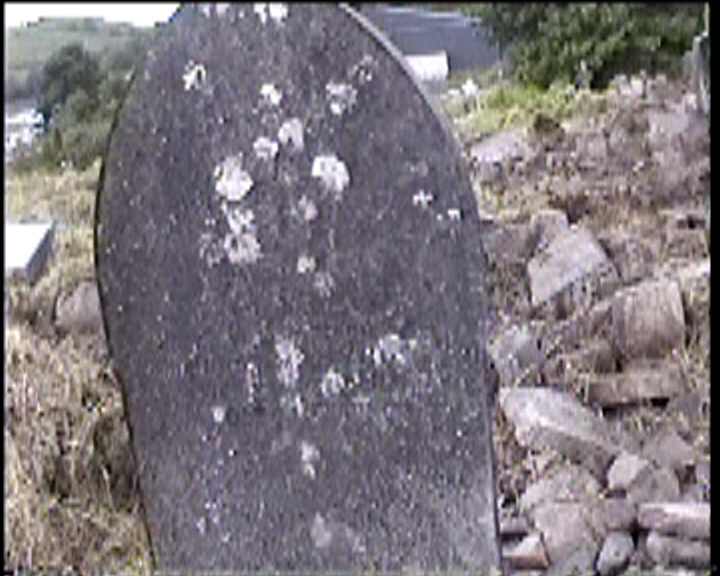 I have video captures (sorry, they are not the greatest quality) of all the graves with numbers; click on the number to see a picture of the headstone. 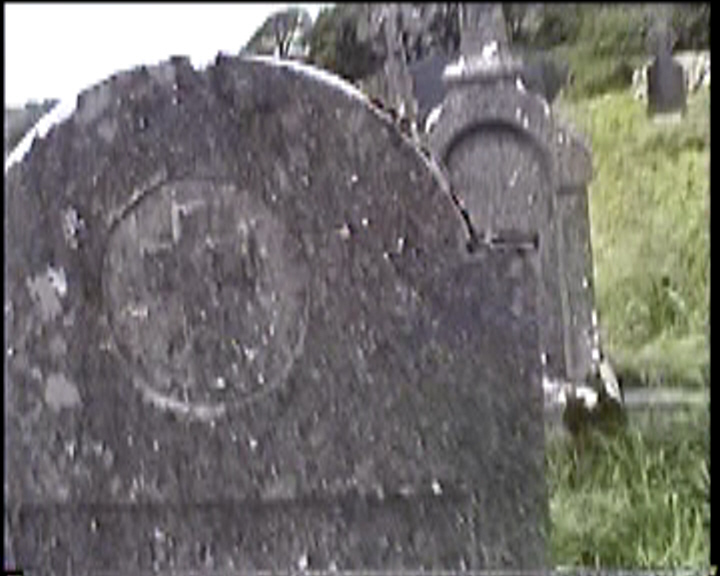 Those marked with a MOTD were taken from a CD called "Memorials of the Dead" and are included with my transcriptions. 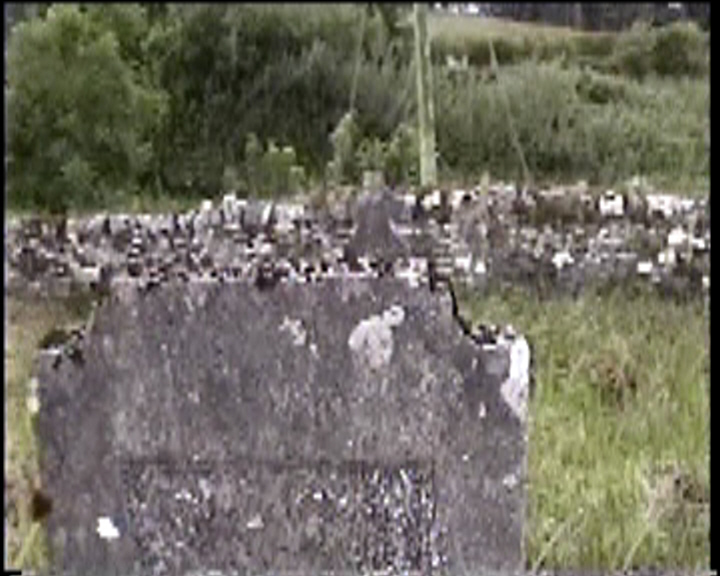 Killeen Cemetery is divided into two sections. Between rain showers and sunshine, sometimes both at the same time, I recorded most of the headstones in the "newer" section of the cemetery. 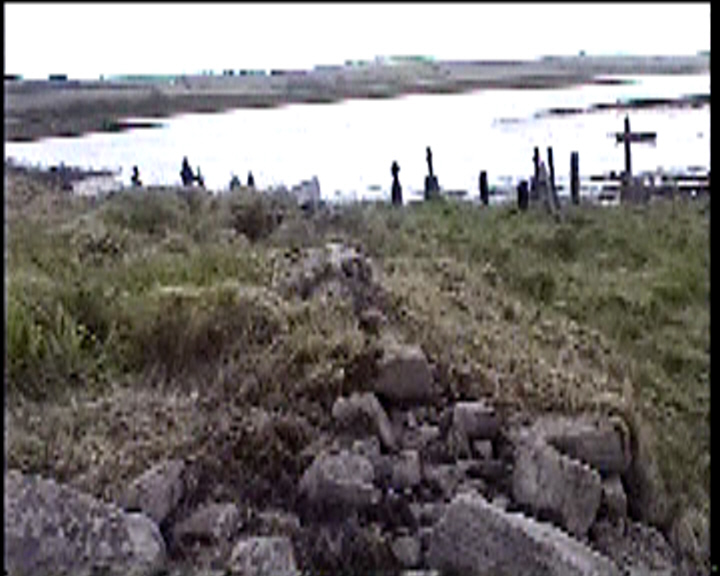 The old section used to be badly overgrown but has been cleaned up recently and is now accessible. 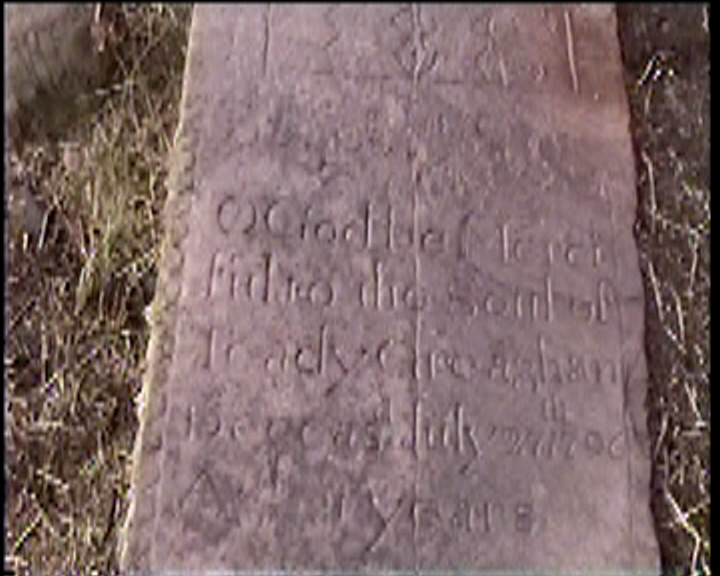 I tried to video and transcribe most of the monuments and headstones although I know I missed some and others were weather beaten and nearly impossible to read. 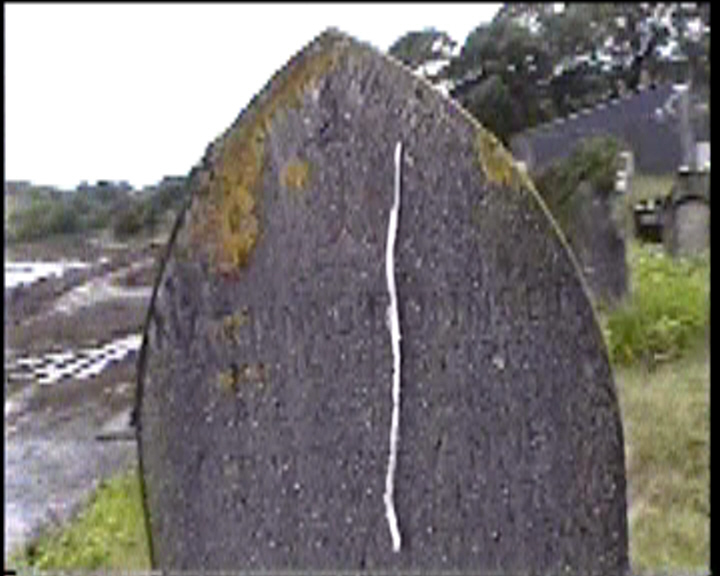 There are several flat stones measuring 3ft by 5ft that date back to the 1700's (#'s 44,45, 49-53) that were exciting. 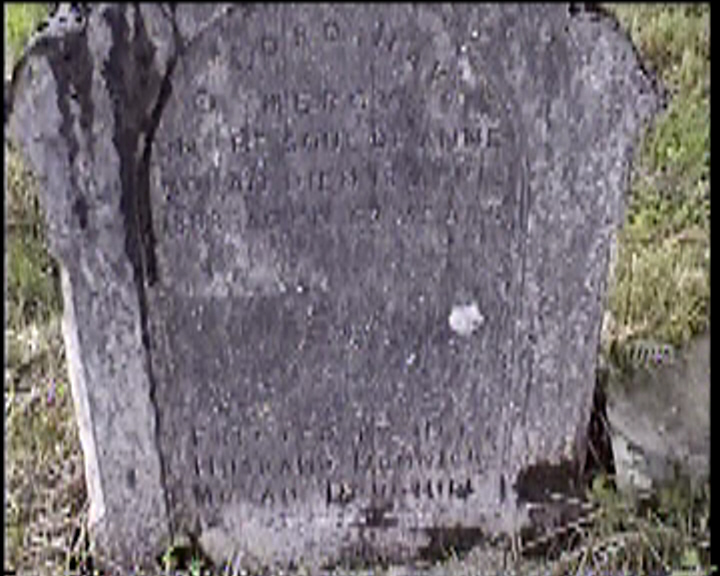 Per Brendan McLoughlin, the headstone of my gg-grandparents, Patrick McLoughlin and Mary Moran, was the first monument erected in this cemetery.
? Rosturk died 14 Dec. 19 1925 aged 74 years. Also his daughter MAGGIE died ? Lord have mercy on the soul of ? 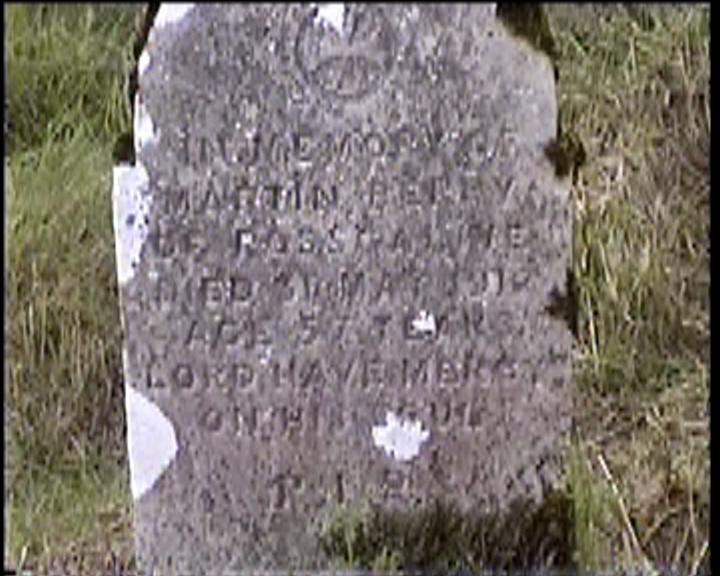 In memory of MARTIN BERRY of Rosscalive died 31st May 1912 age 57 years. Lord have mercy on his soul. 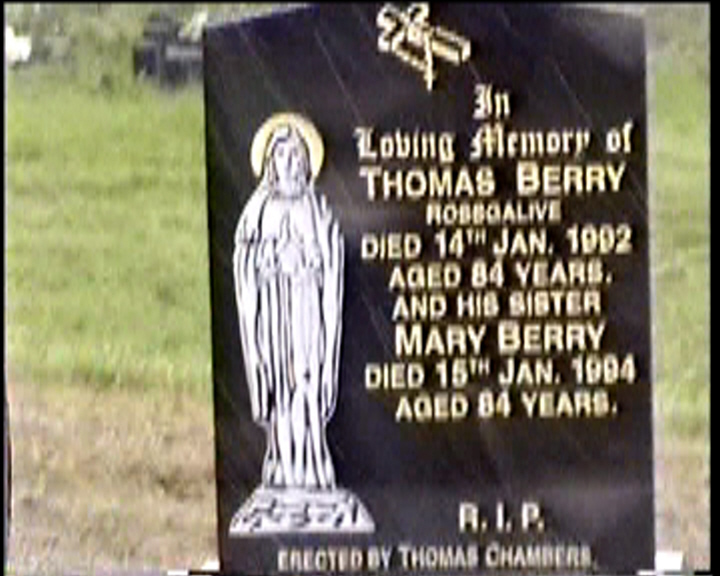 O Lord have mercy on the soul of TOM BERRY who departed this life April 17 1880 aged 60 years. 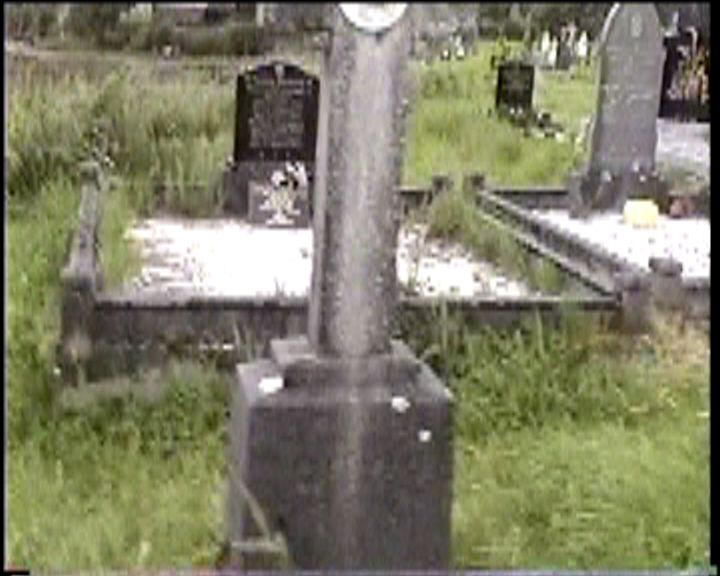 Also his beloved wife MARY who died 23rd Sep. ‘96 aged 70 years. 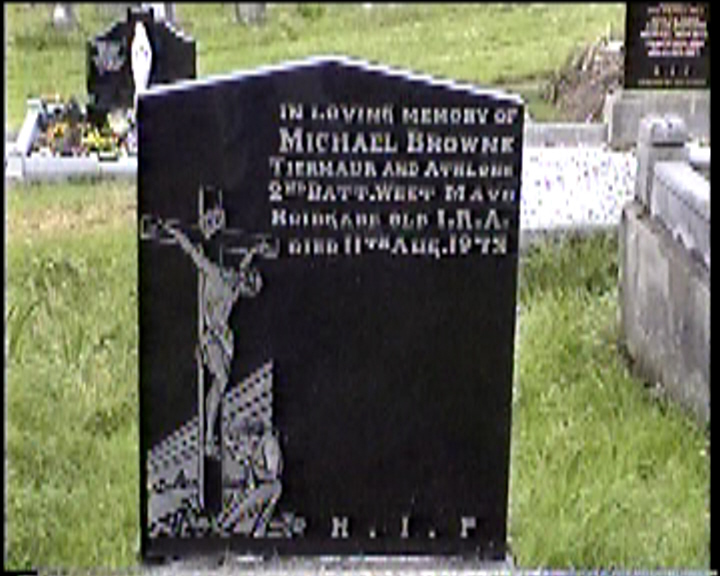 In loving memory of MICHAEL BROWNE Tiernaur and Athlone. 2nd Batt. 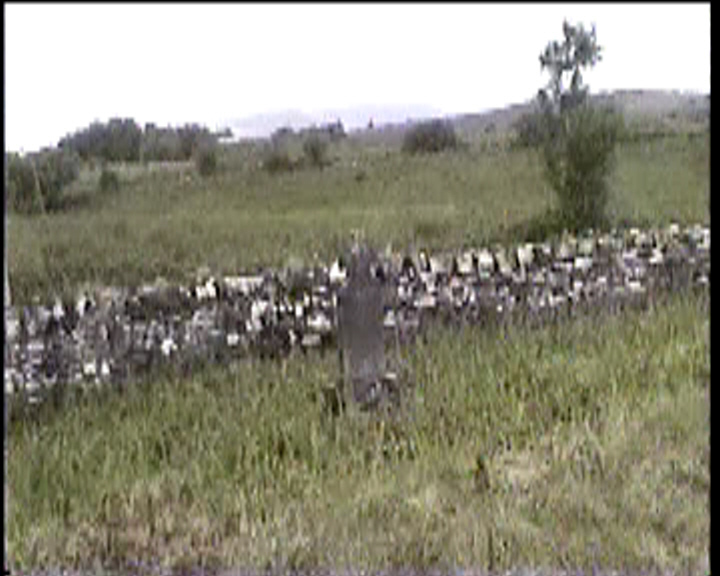 West Mayo Brigade old I.R.A. Died 11th August. 1973. 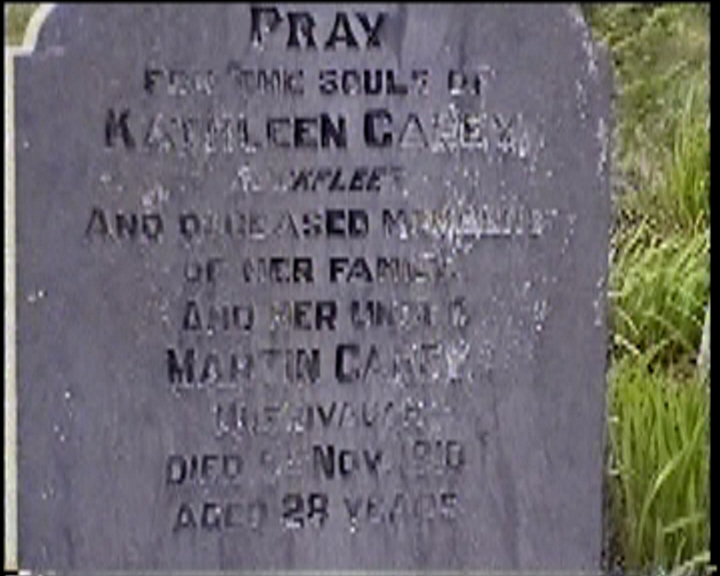 In loving memory of MARTIN CAINE Knockbreada died May 4, 1958 aged 80 years, and his wife MARGARET died Aug. 15, 1933, aged 52 years, also their son MARTIN died April 5, 1940 aged 29 years. 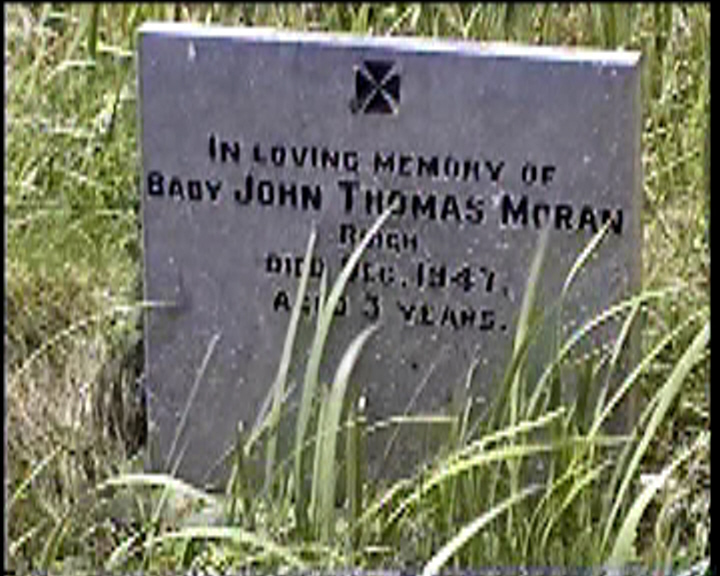 Also their son JOHN died 26th June 1978 aged ? years. 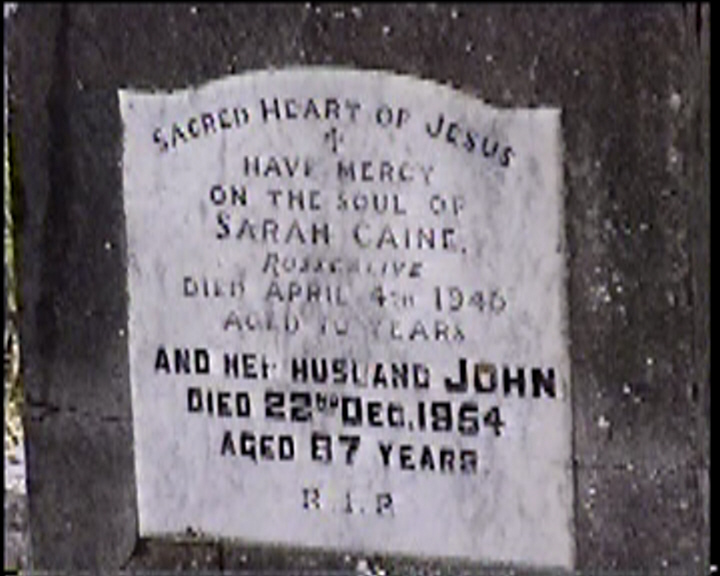 Sacred Heart of Jesus have mercy on the soul of SARAH CAINE Rosscalive died April 4th 1946 aged 70 years and her husband JOHN died 22nd Dec. 1954 aged 87 years. In loving memory of JOHN PATRICK CAINE Shraloggy 1885-1959. And his wife ELLEN 1889-1959. 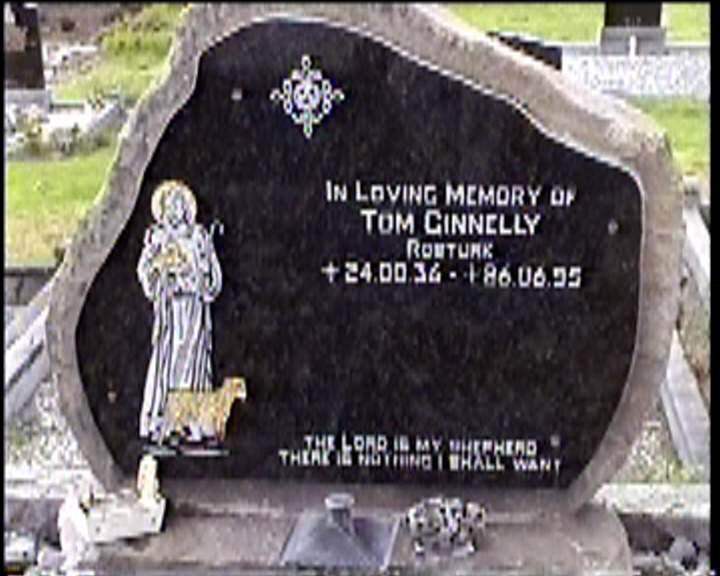 Their son TONY died 30th Sep. 1996. 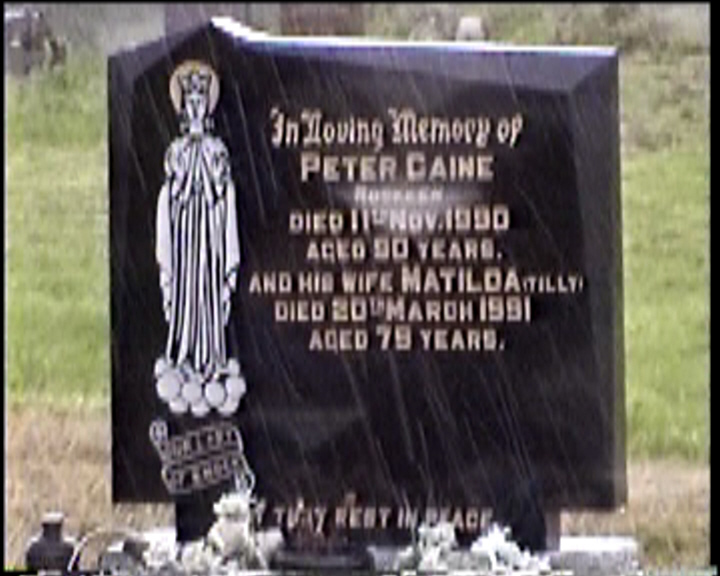 In loving memory of PETER CAINE Roskeen died 11th Nov. 1990 aged 90 years and his wife MATILDA (TILLY) died 20th March 1991 aged 79 years. In loving memory of MARY CALVEY Roskeen died 23rd May 1969 aged 86 years. Wife of MICHAEL CALVEY. In loving memory of JOHN CANNON Roskeen died 8th Feb. 1973 aged 80 years. 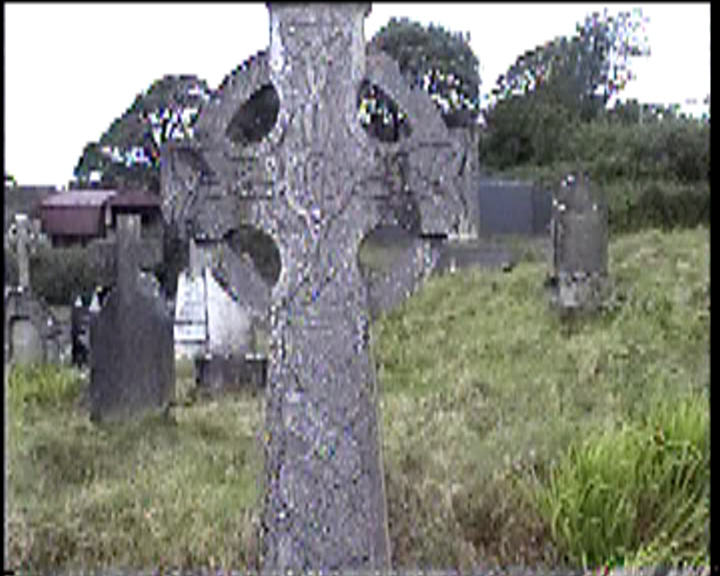 And his wife MARY ANN died 24th Jan. 2002 aged 92 years. In loving memory of HUGH CANNON Roskeen died 23rd Mar. 1965 aged 83 years. And his wife BRIDGET died 3rd August 1979 aged 93 years. 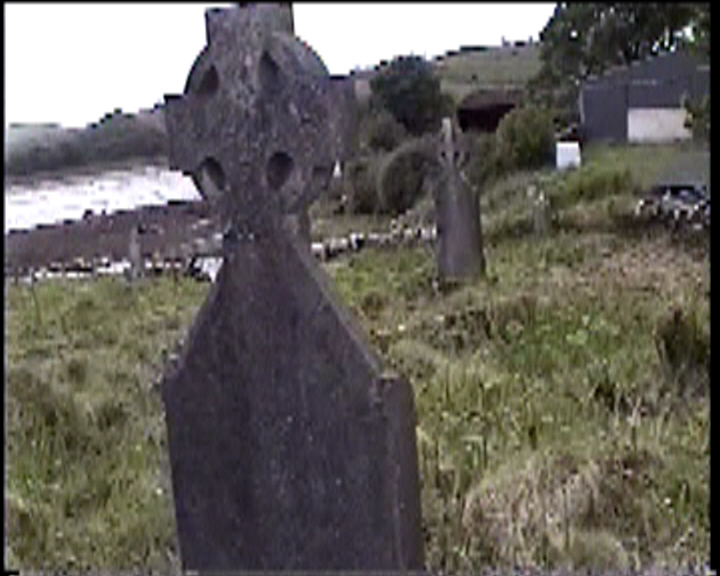 Pray for the souls of KATHLEEN CAREY Rockfleet and deceased members of her family and her uncle MARTIN CAREY Murrivaugh died 9th Nov. 1910 aged 28 years. 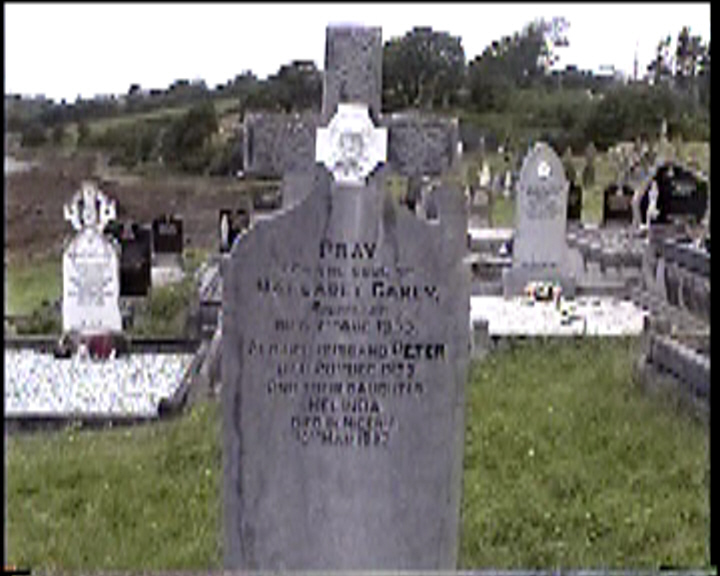 Pray for the soul of MARGARET CAREY Rockfleet, died 7th Aug. 1955, and her husband PETER died 20th Dec. 1975 and their daughter BELINDA died in Nigeria 16th Mar. 1953. In loving memory of PAT CAROLAN who died Oct. 17th 1933 his wife BRIDGET died Nov. 19th, 1918 and children MARIA, SARAH, and PATRICK. 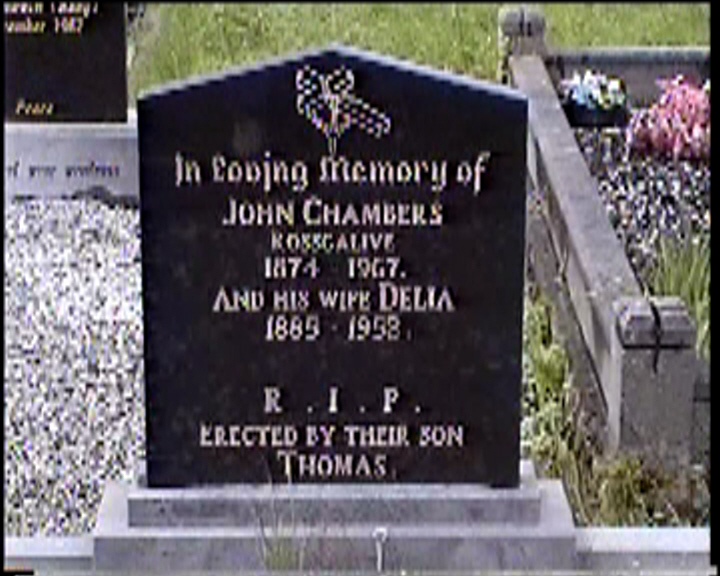 In loving memory of JOHN CHAMBERS Rossgalive 1874-1967. And his wife DELIA 1885-1952. Erected by their son THOMAS. 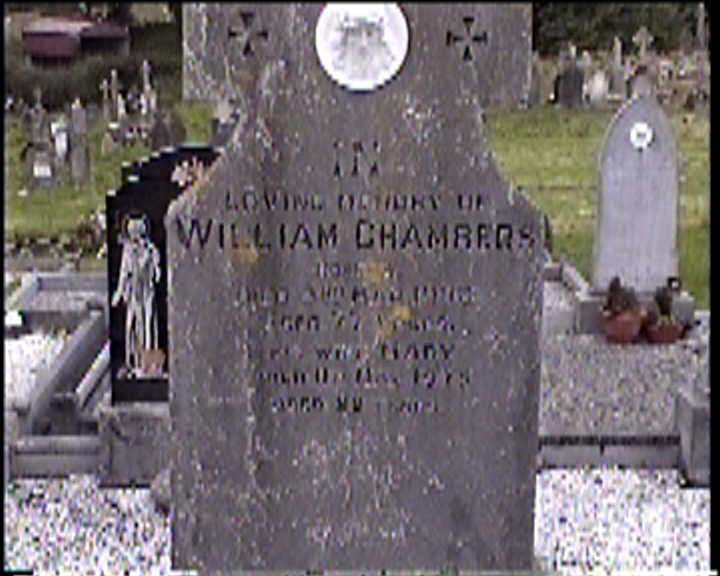 In loving memory of WILLIAM CHAMBERS Knockloughra died 7th Oct. 1966 aged 76 years, and his wife CATHERINE died 25th June 1968 aged 82 years. 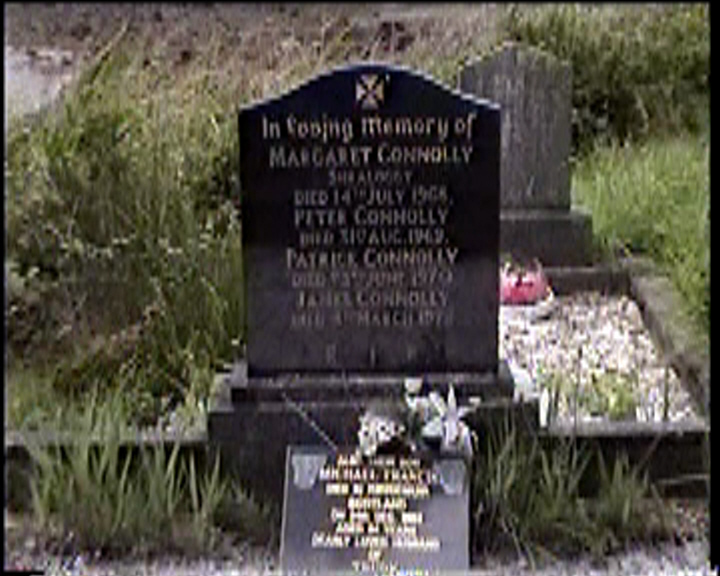 Also their daughter MARY died 11th Dec. 1987 aged 66 years. 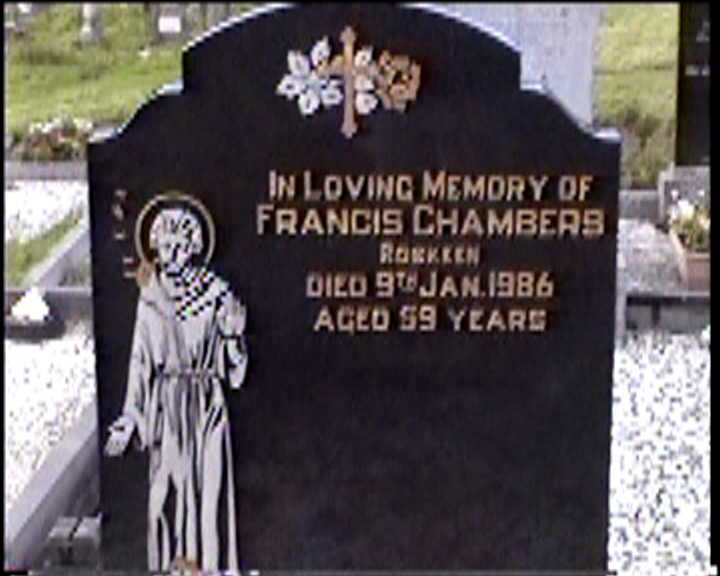 In loving memory of FRANCIS CHAMBERS Roskeen died 9th Jan. 1986 aged 59 years. 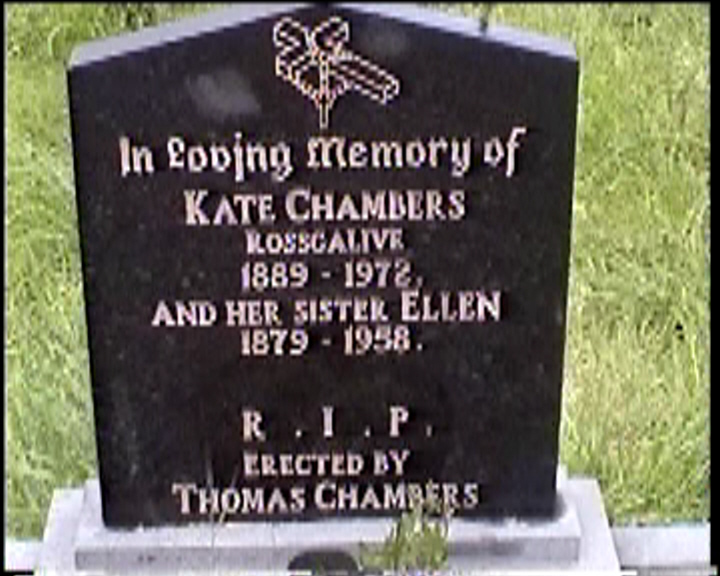 In loving memory of KATE CHAMBERS Rossgalive 1889-1972. And her sister ELLEN 1879-1958. Erected by THOMAS CHAMBERS. 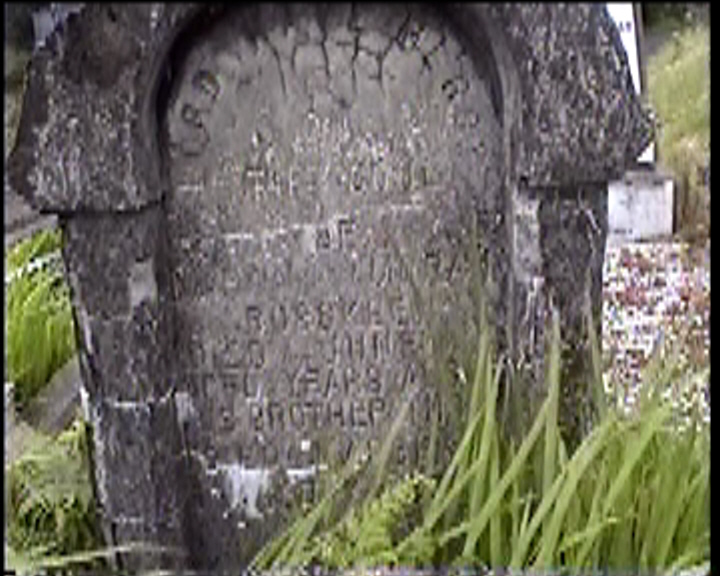 In loving memory of WILLIAM CHAMBERS Roskeen died 3rd Mar. 1953 aged 77 years. And his wife MARY died 11th May 1975 aged 88 years. 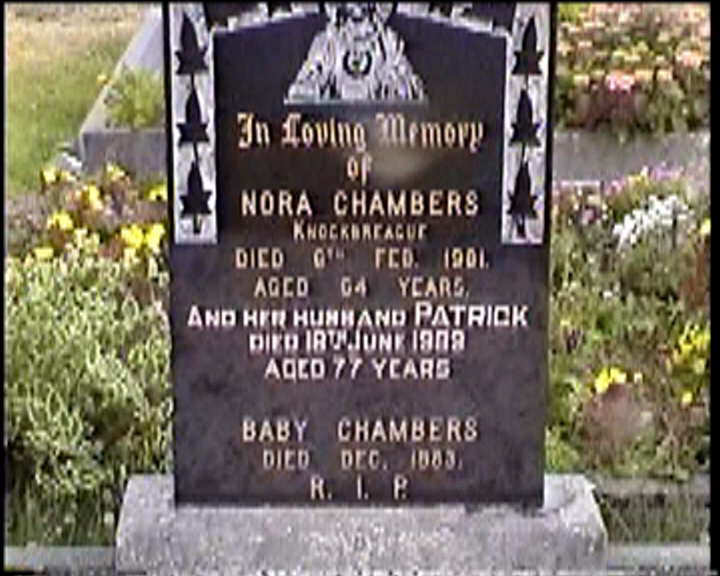 In loving memory of NORA CHAMBERS Knockbreague died 6th Feb. 1981 aged 64 years. 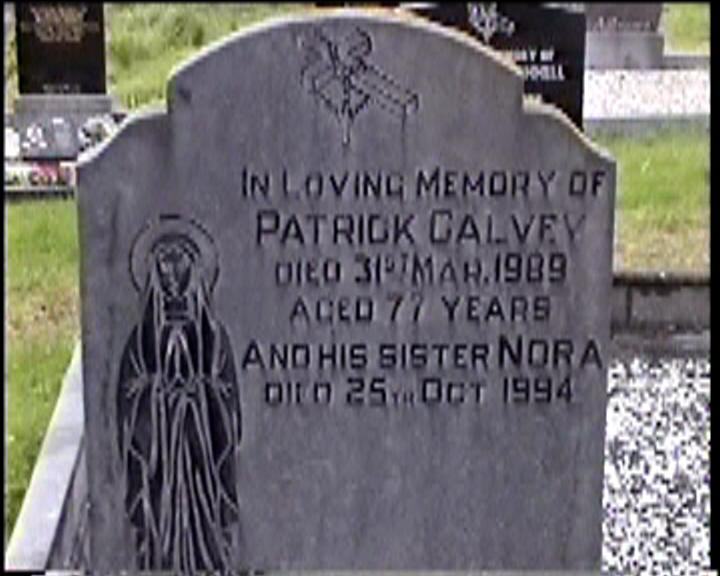 And her husband PATRICK died 18th June 1989 aged 77 years. Baby CHAMBERS died Dec. 1983. 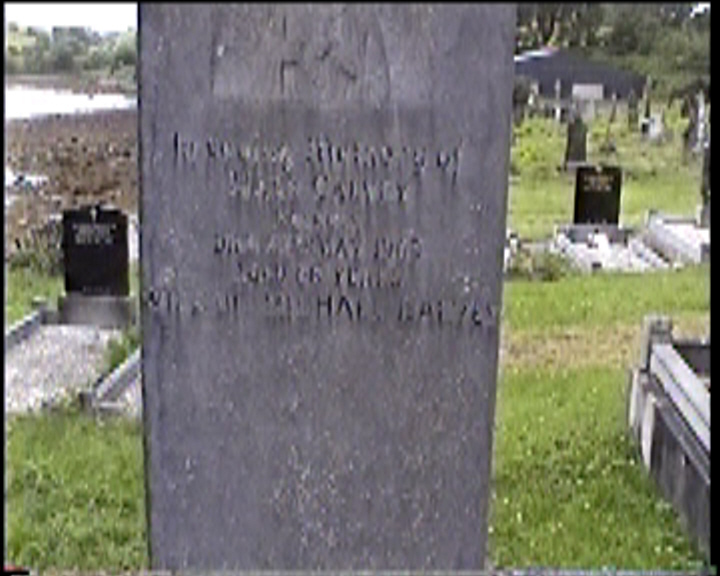 In loving memory of PATRICK CLEARY Mulranny died 30th July 1935. And his wife ANNIE died 23rd Nov. 1972. 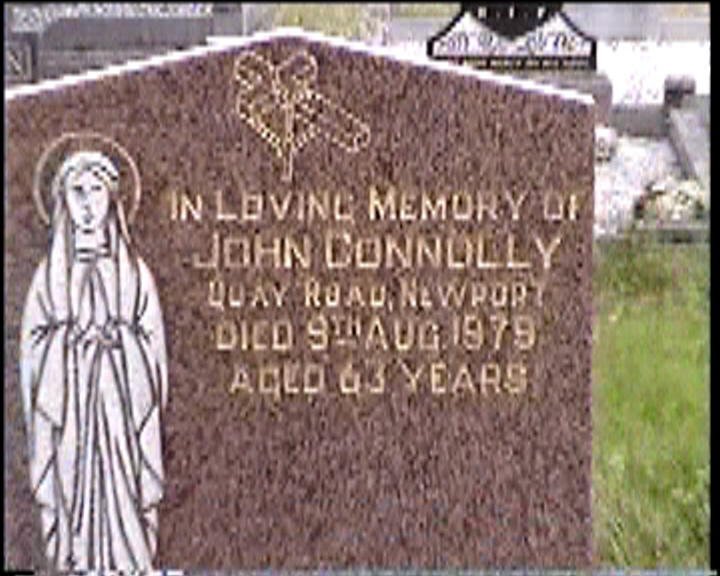 In loving memory of JOHN CONNOLLY Quay Road Newport died 9th Aug. 1979 aged 63 years. 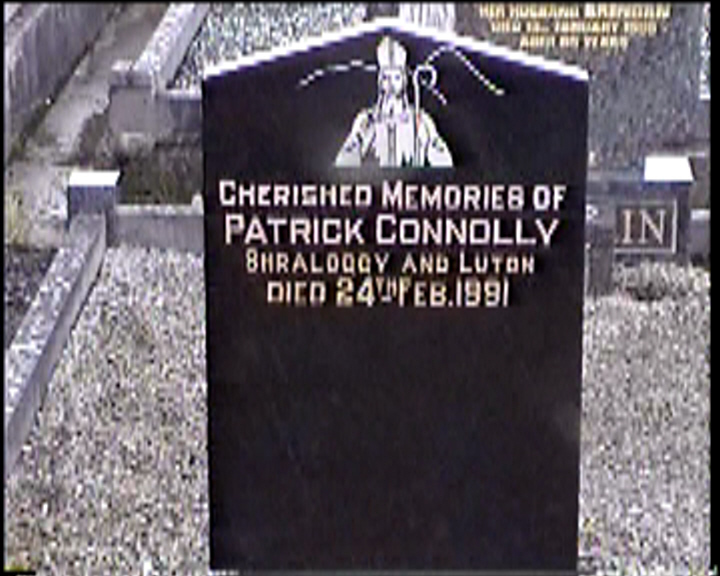 Cherished memories of PATRICK CONNOLLY Shraloggy and Luton died 24th Feb. 1991. 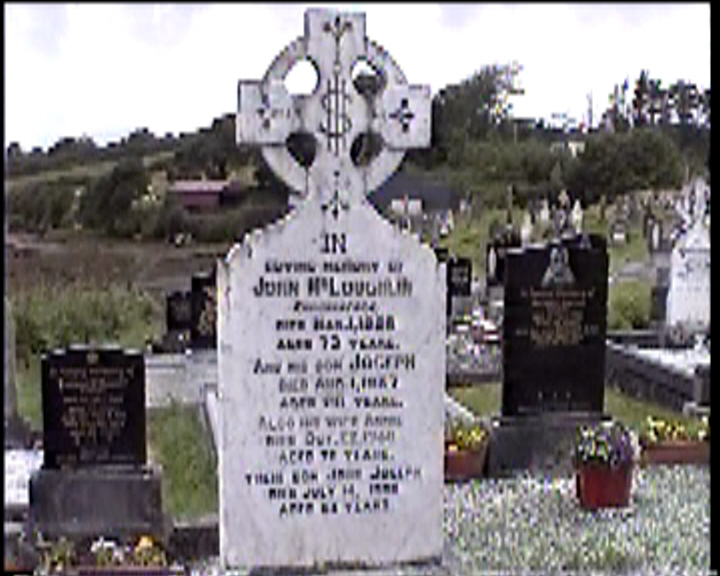 Lord have mercy on the soul of JOHN CONWAY who departed this life on the 7th of June 1877 aged 70 years. 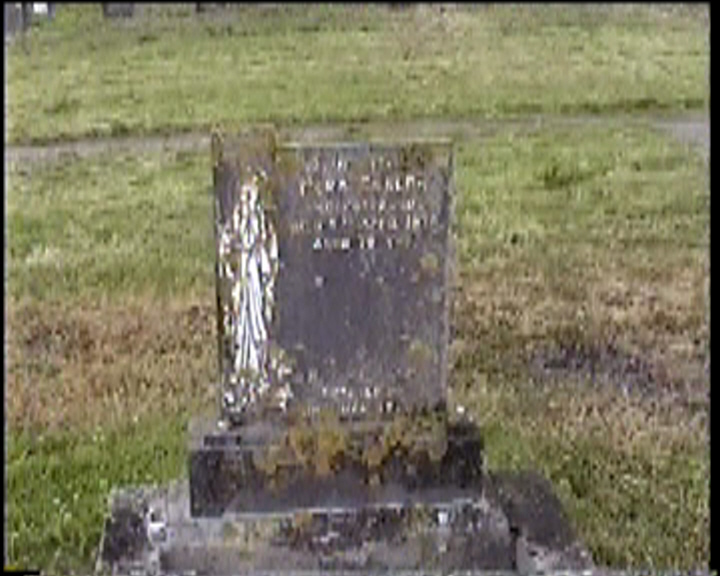 Pray for the souls of MARGARET CURRAN died 26th May 1902 aged 36 years, her husband JOHN died 6th June 1923, infant son THOMAS and daughter BRIDGET JOSEPHINE. 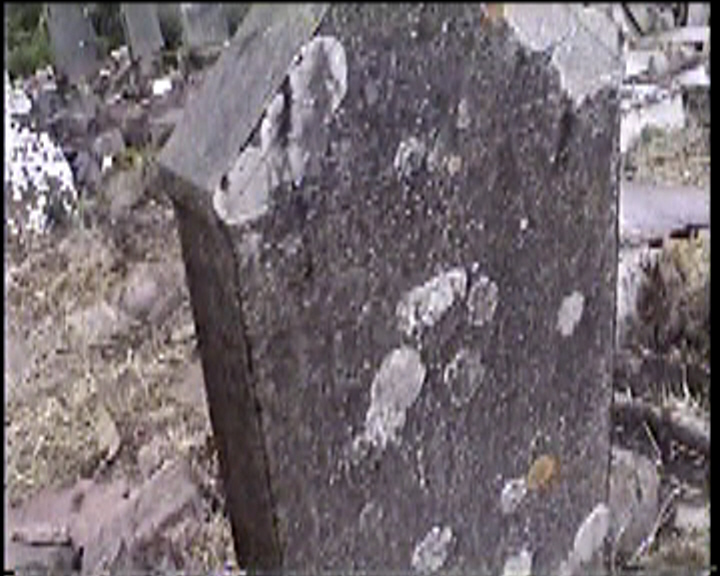 Erected by their loving daughter MARGARET CURRAN KAVANAGH. 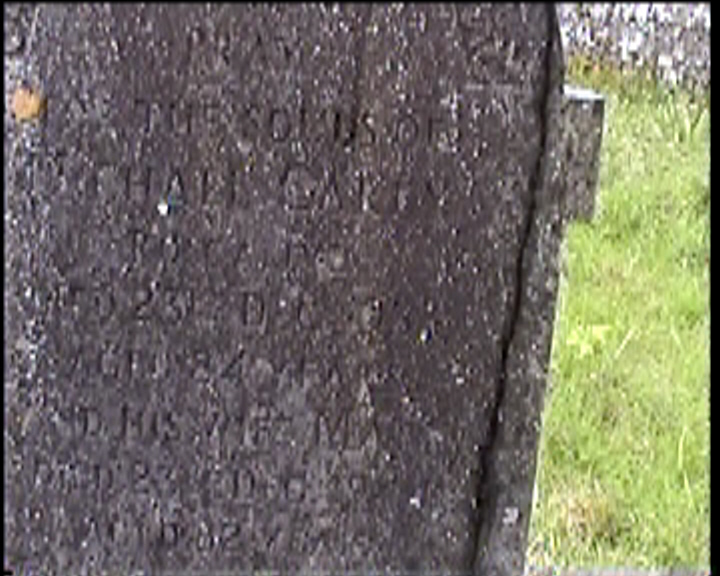 In loving memory of THOMAS CUSACK Roskeen died 27th Mar. 1921 and his wife WINNIFRED died 21st Dec. 1960. 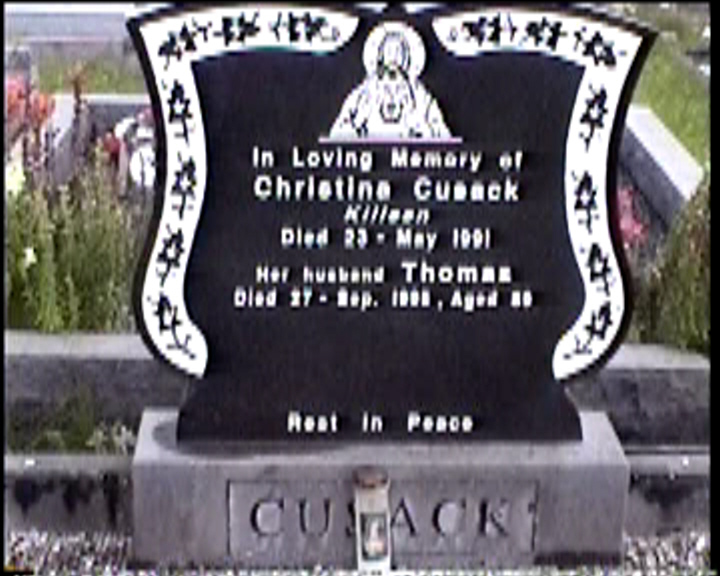 In loving memory of CHRISTINA CUSACK Killeen died 23 May 1991. 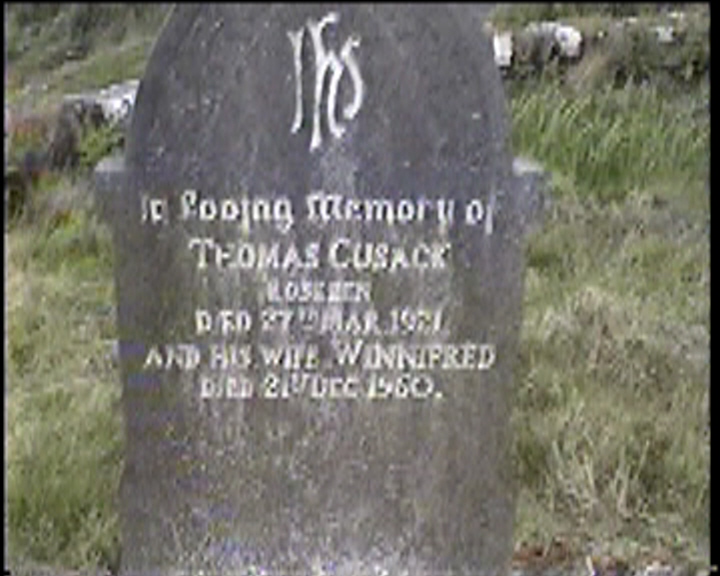 Her husband THOMAS died 27 sep. 1995 aged 89. 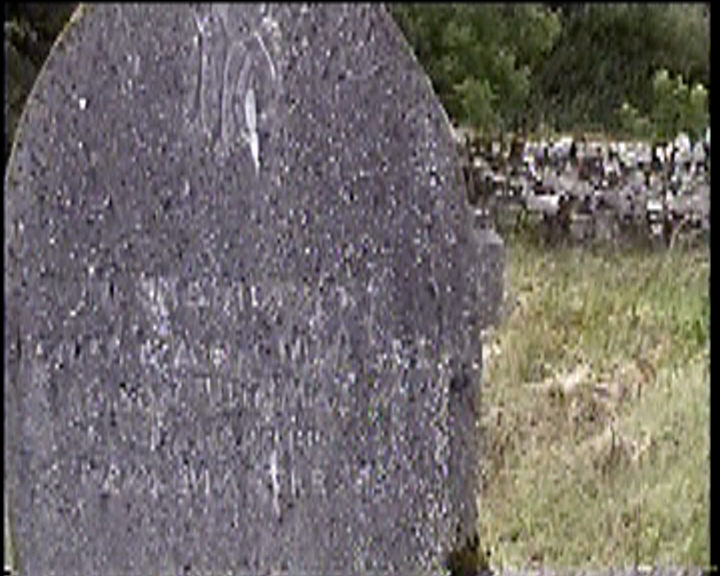 In loving memory of PADDY CUSACK Castlebar and late of Roskeen, Carrowbeg died 16th Oct. 1989 aged 85 years. 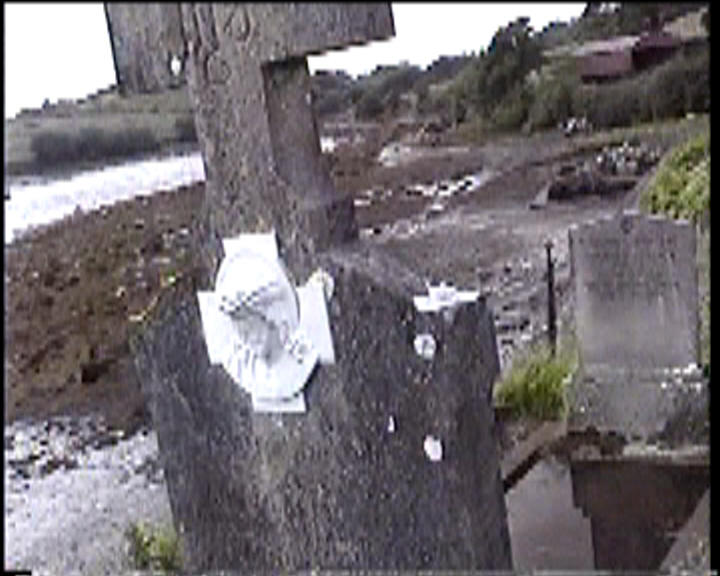 In loving memory of my dear husband RICAHRD ENSKO Rose Cottage, Carrowbeg Fergus died 13th June 1997 aged 69 years. Erected by his loving wife KATHLEEN. 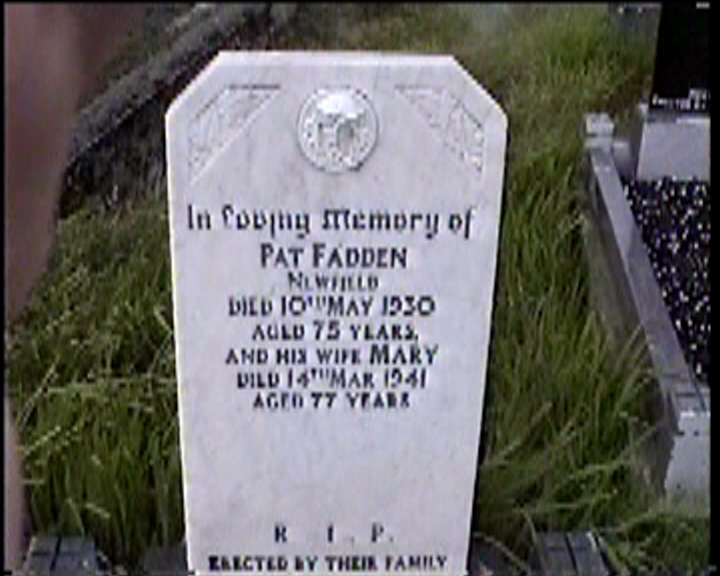 In loving memory of PAT FADDEN Newfield died 10th May 1930 aged 75 years, and his wife MARY died 14th Mar. 1941 aged 77 years. 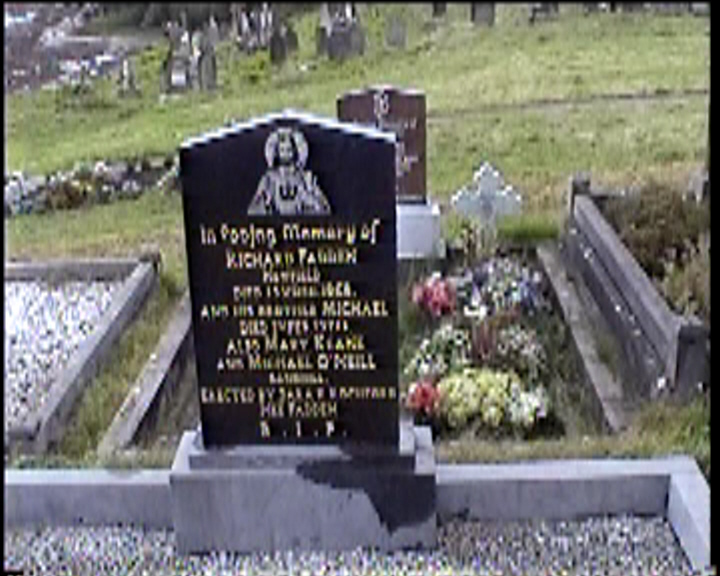 In loving memory of RICHARD FADDEN Newfield died 13th Dec. 1968 and his brother MICHAEL died 19 Feb. 1970. Also MARY KEANE and MICHAEL O’NEILL Sandhill. 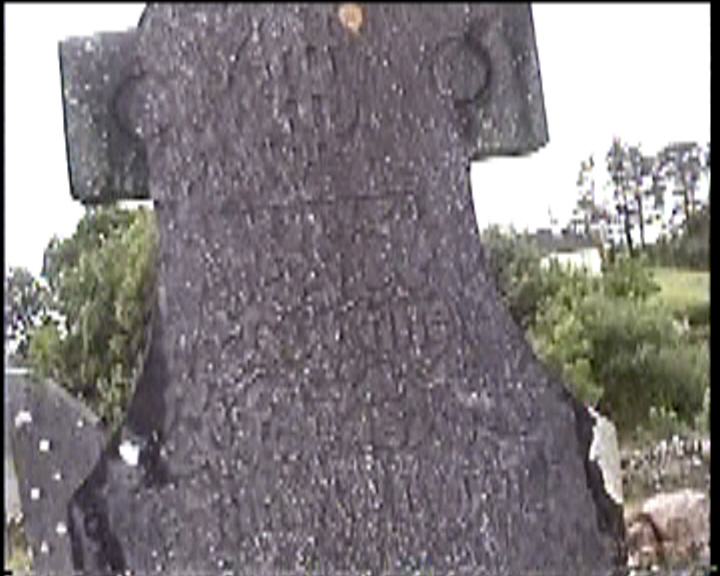 Erected by SARA K. ROCHFORD nee FADDEN. 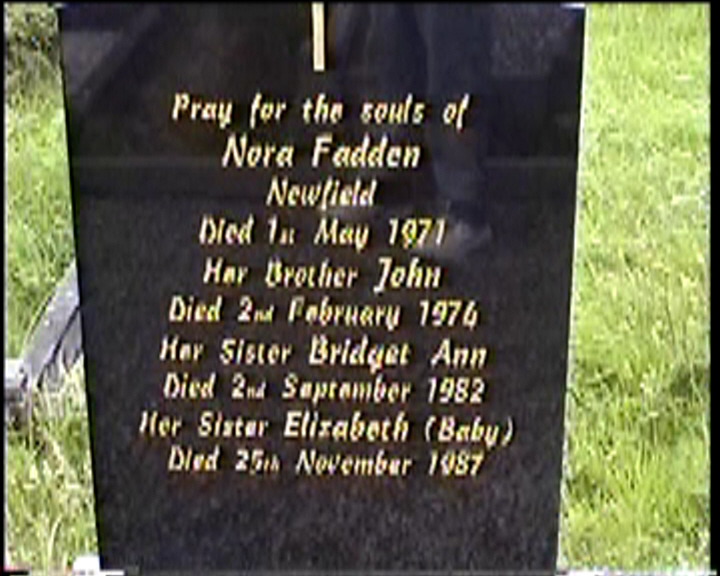 Pray for the souls of NORA FADDEN Newfield died 1st May 1971. 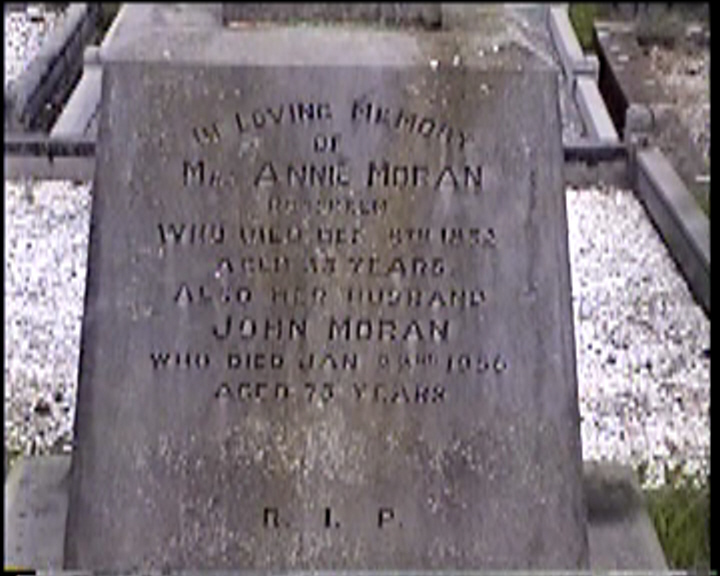 Her brother JOHN died 2nd February 1974. 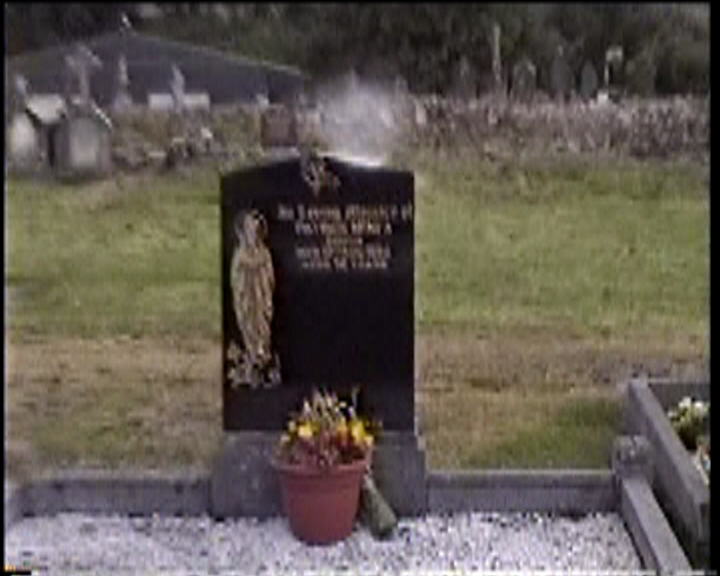 Her sister BRIDGET ANN died 2nd September 1982. 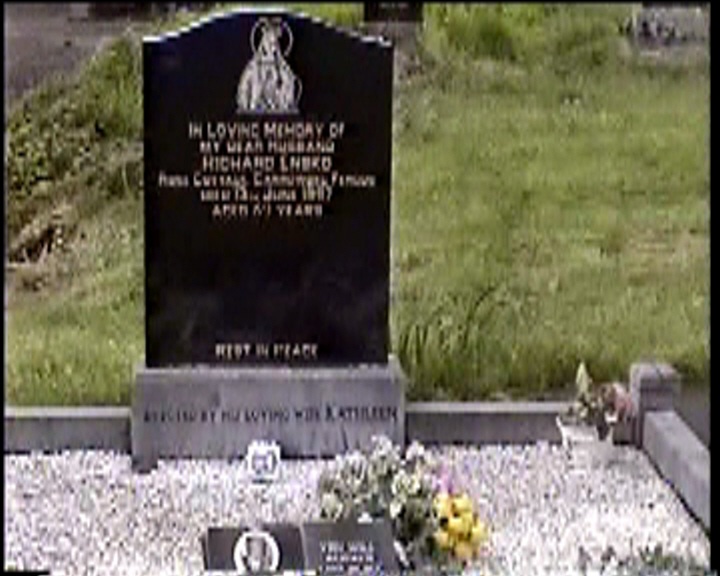 Her sister ELIZABETH (BABY) died 25th November 1987. 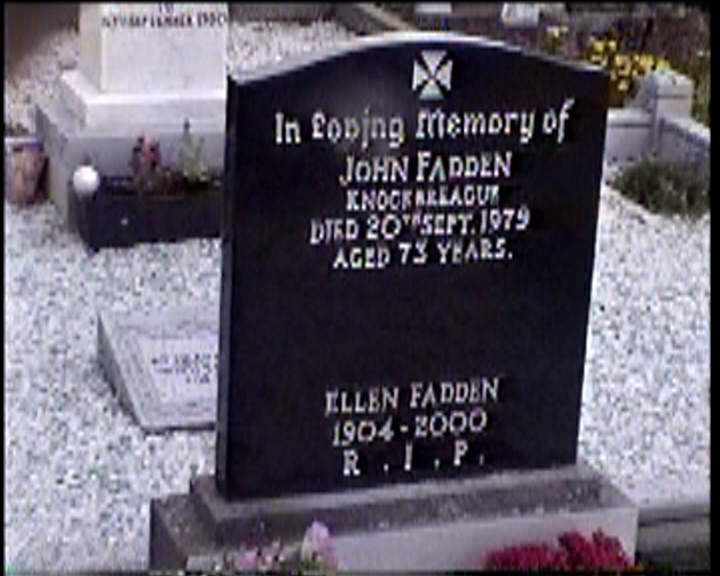 In loving memory of JOHN FADDEN Knockbreague died 20th Sept. 1979 aged 73 years. Ellen Fadden 1904-2000. In loving memory of BRIDIE GIBBONS Newfield died 4th April 1969 aged 51 years. 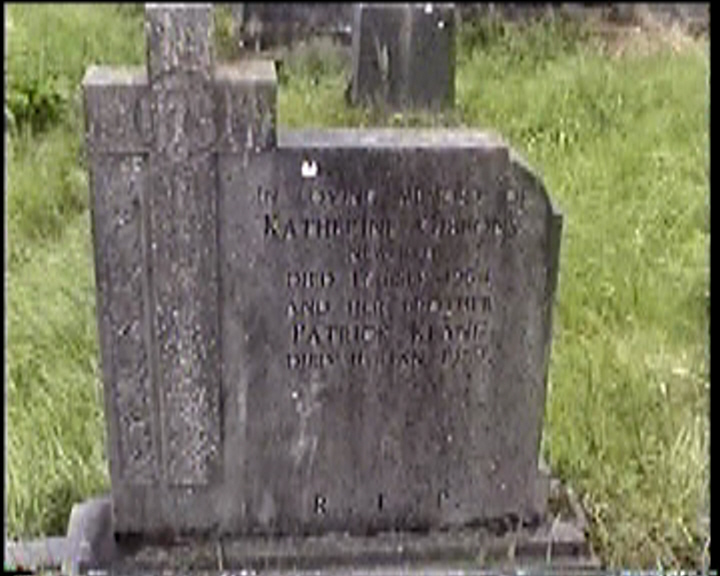 In loving memory of KATHERINE GIBBONS Newfield died 17th Sep. 1964 and her brother PATRICK KEANE died 11th Jan. 1959. 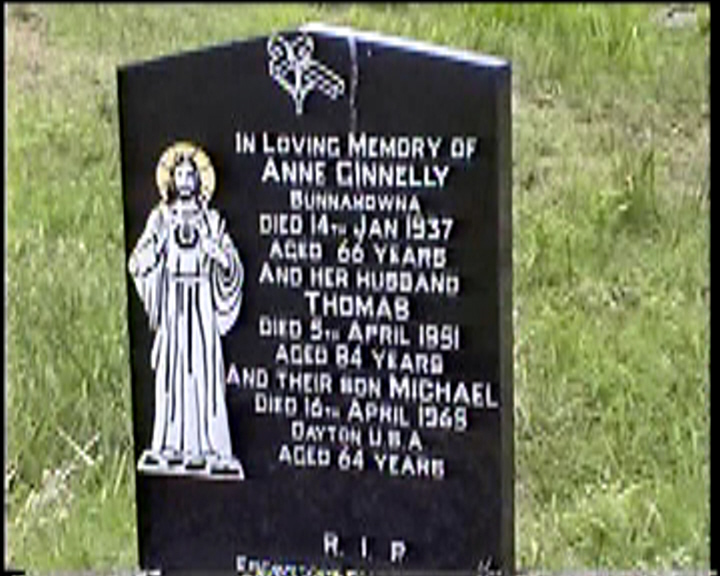 In loving memory of ANNE GINNELLY Bunnahowna died 14th Jan 1937 aged 66 years and her husband THOMAS died 5th April 1951 aged 84 years and their son MICHAEL died 16th April 1965 Dayton, U.S.A. aged 64 years. 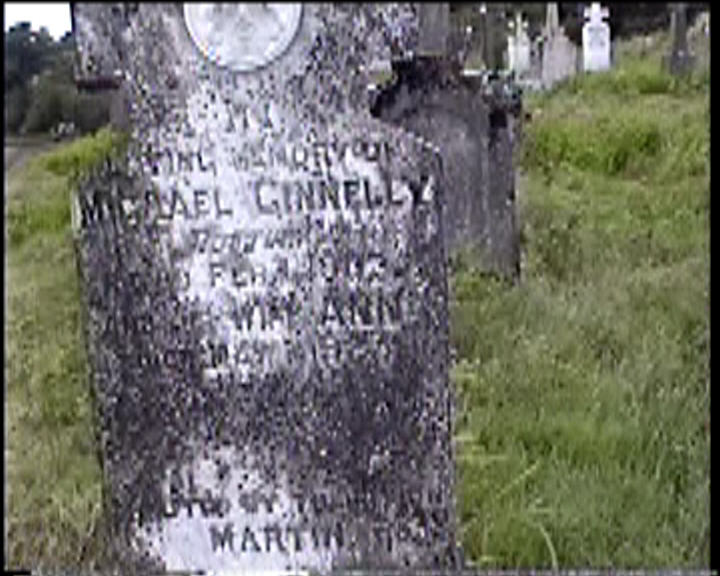 In loving memory of MICHAEL GINNELLY Rosturk died Feb. 1 1903 and his wife ANN died May ? 1925. 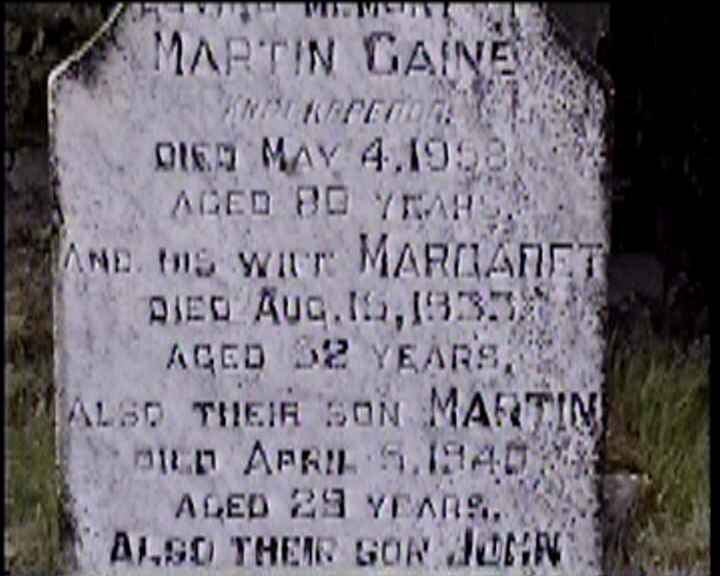 Erected by their son MARTIN. 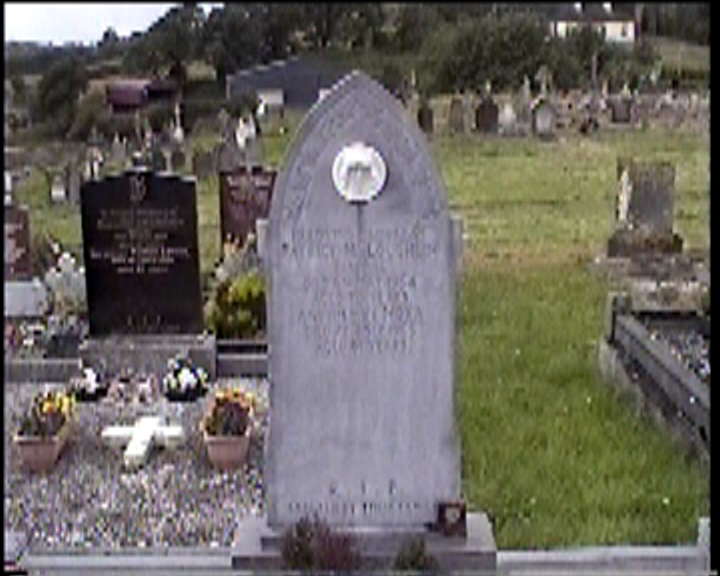 In loving memory of NORA GINNELLY Rosturk died 24th April 1965 aged 21 years and her parents THOMAS died 7th July 1978 also his wife MARY died 23rd Nov. 1982. 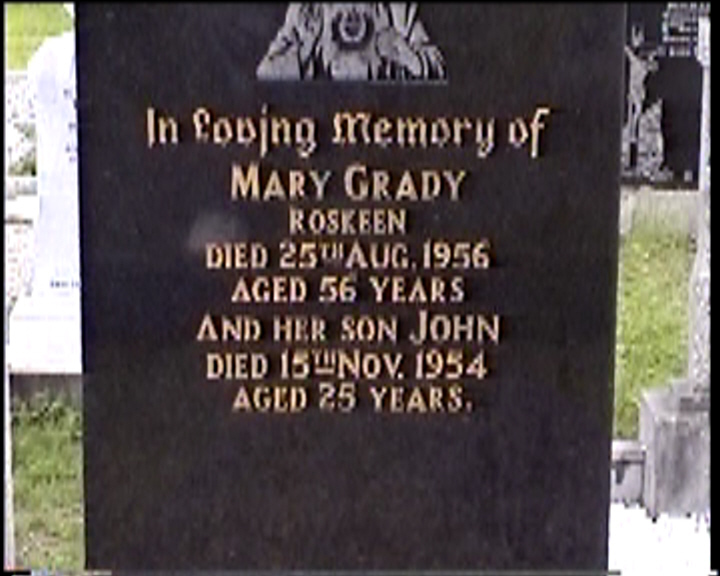 In loving memory of MARY GRADY Roskeen died 25th Aug. 1956 aged 56 years and her son JOHN died 15th Nov. 1954 aged 25 years. 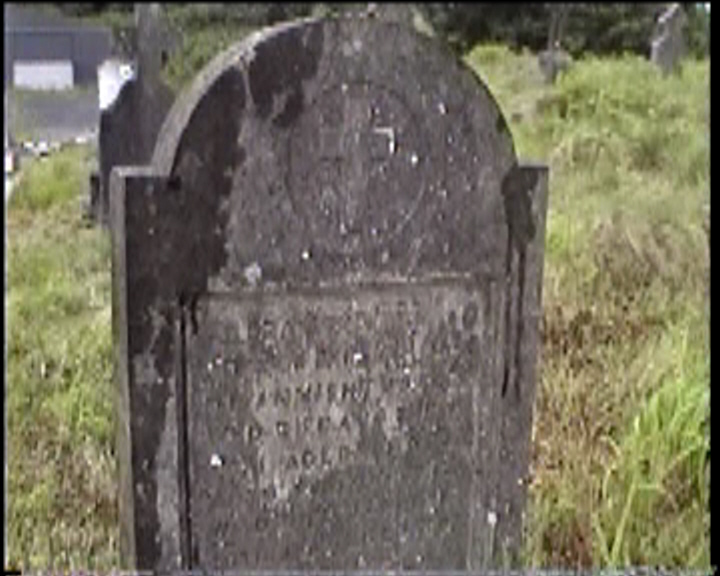 In loving memory of John Grehan Murrivaugh who died August 3rd 1901 aged 26 years also his sister Margaret and his brother Michael Erected by their sister Norah U.S.A.
Oh Lord have mercy on the soul of BRIDGET GREHAN alias BARRETT who depd this life September 8th 1840 aged 50 years. Erected by her husband TEADY GREAHAN. 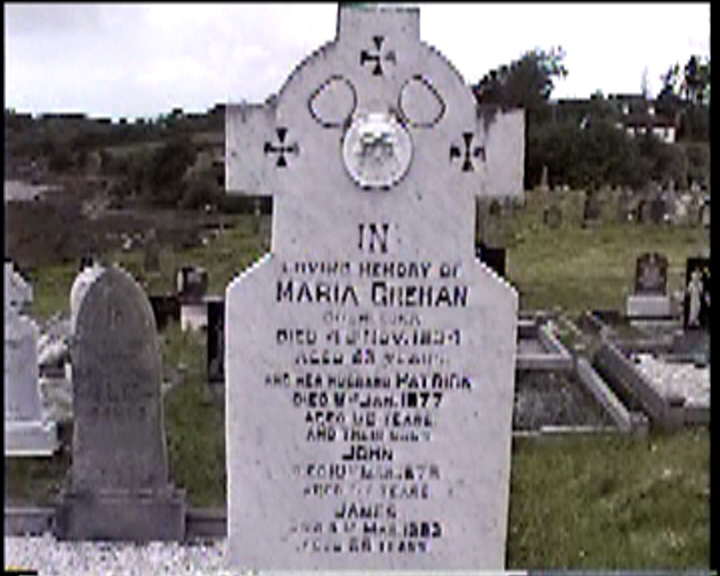 In loving memory of MARIA GREHAN Cushlecka, died 4th Nov. 1954 aged 62 years. 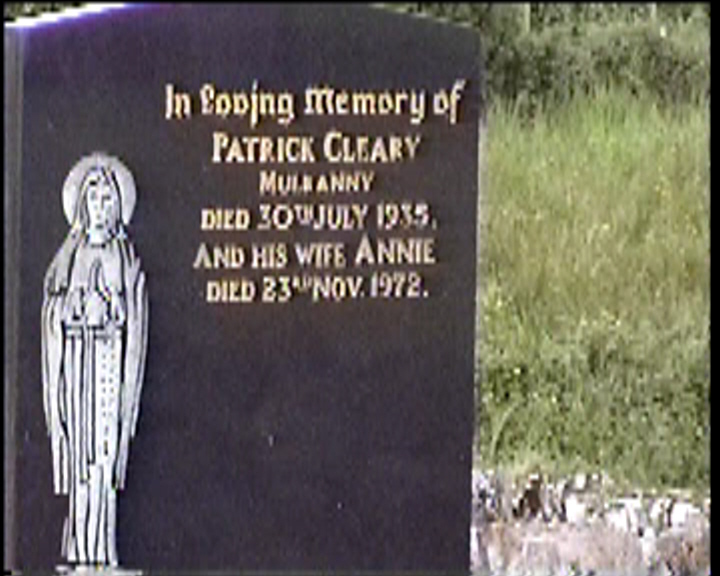 And her husband PATRICK died 6th Jan. 1977 aged 86 years. 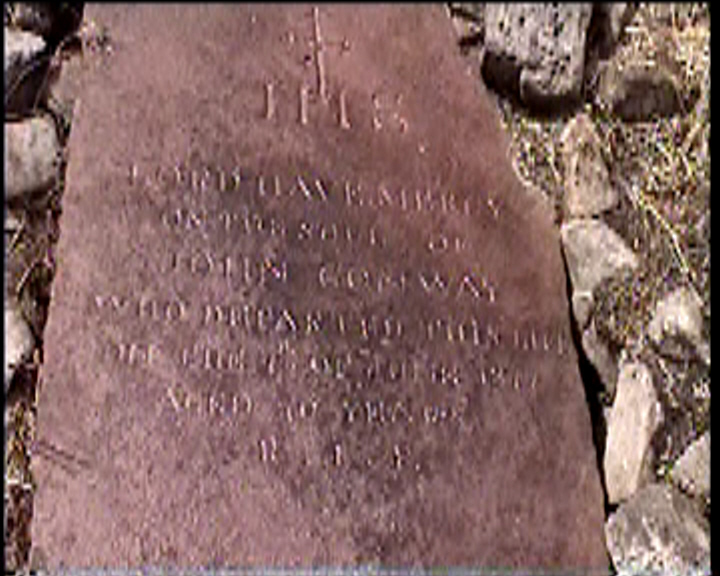 And their sons JOHN died 10th Mar. 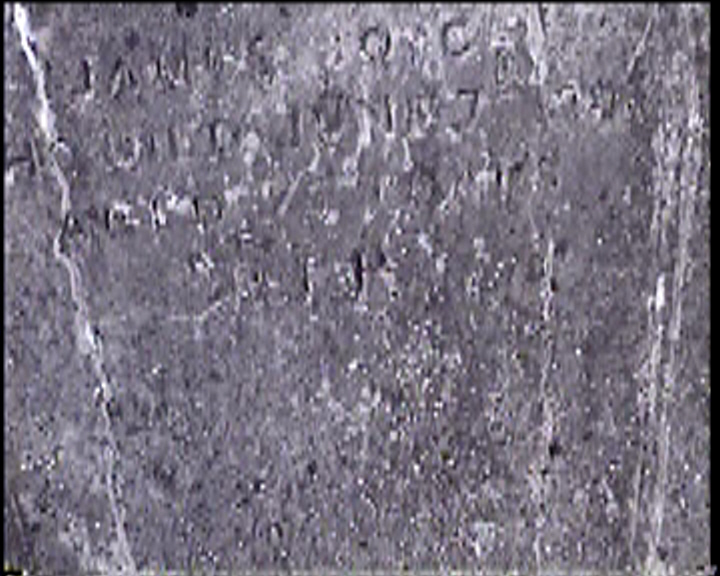 1975 aged 57 years, JAMES died 4th Mar. 1993 aged 69 years. 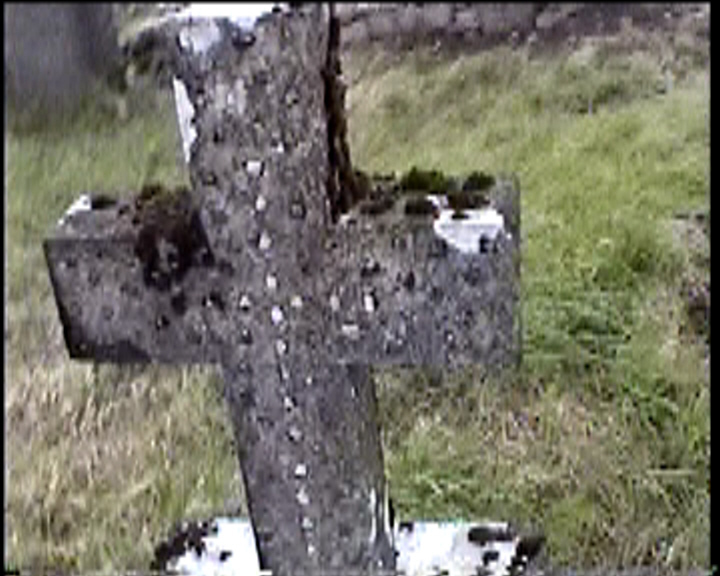 Pray for the soul of NORA HENNESSEY died Roskeen 20th Sept. 1933 aged 49 also the soul of JAMES HENNESSEY died Dec. 1935 aged 88 also their niece ANN CORRIGAN died Ballycroy 2nd Mar 1945 aged 34 years. 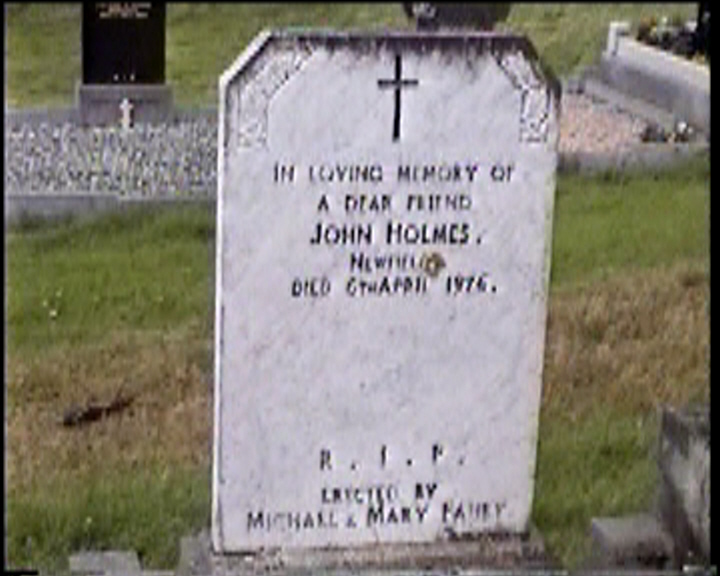 In loving memory of a dear friend JOHN HOLMES, Newfield died 6th April 1976. 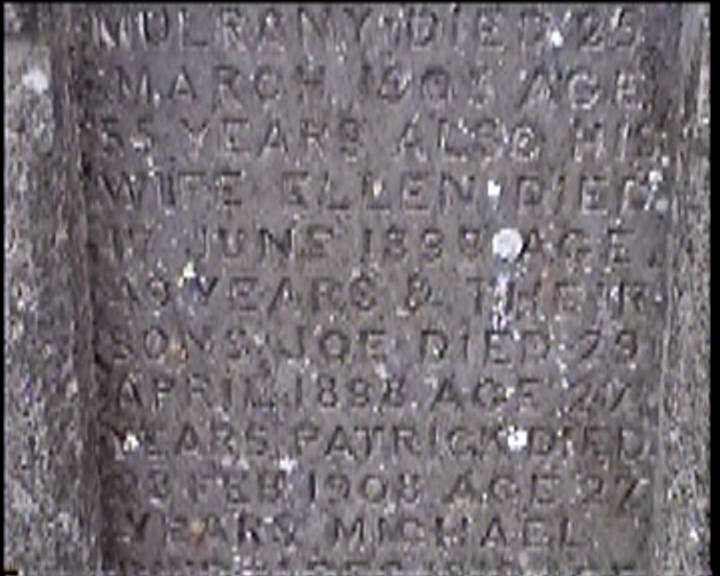 Erected by MICHAEL and MARY FAHEY. 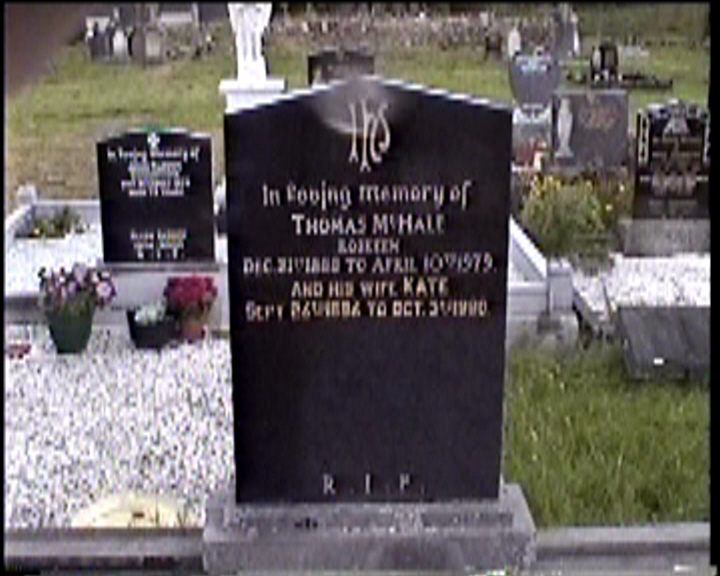 In loving memory of THOMAS HOLMES Newfield died 29th Oct. 1982 aged 81 years. 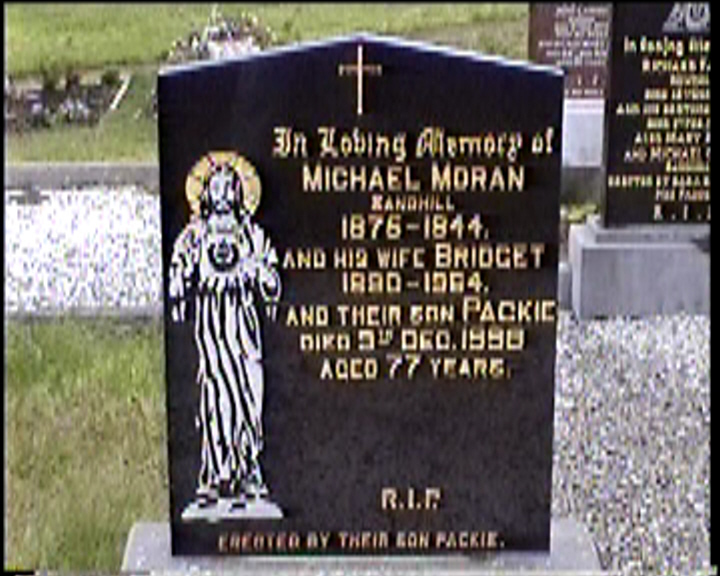 And his wife BRIDGET died 16th Sept. 1996 aged 89 years. 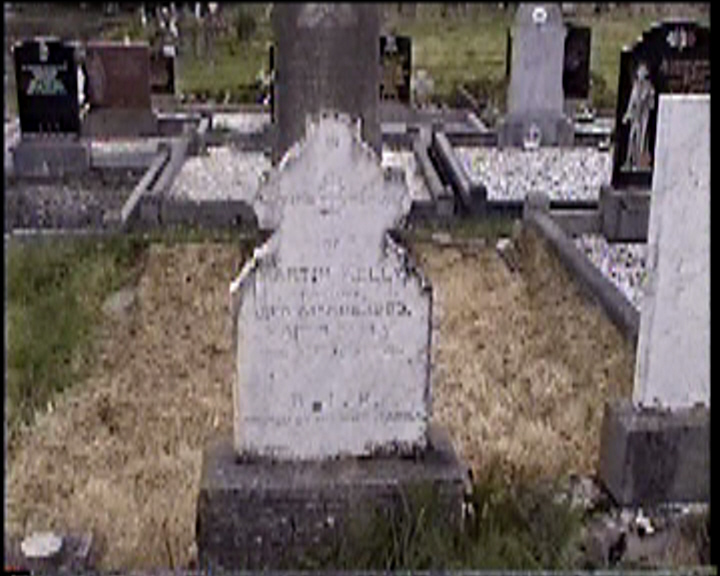 Ronayne BRAY JENNINGS, M. C. Rockfleet, born 21st January 1890, died 12th February 1962. And his wife ROSINA died 8th March 1992. Pray for the soul of JAMES JOYCE who died June 7th 1907 aged 75 years. 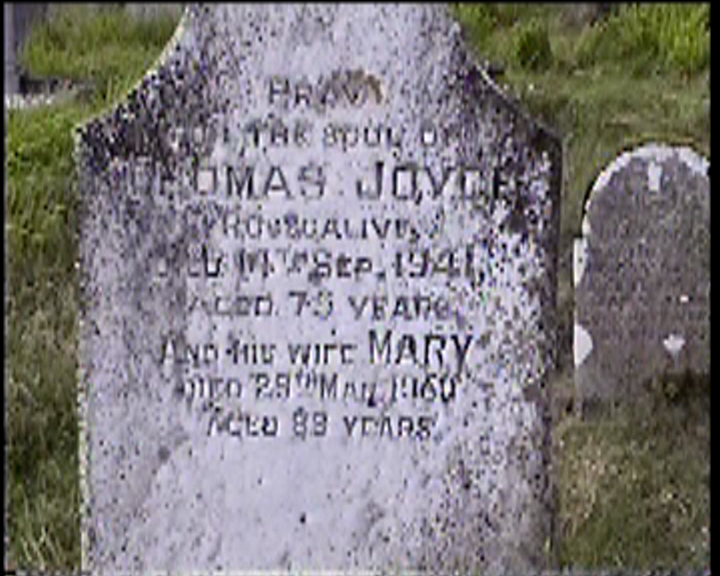 Pray for the soul of THOMAS JOYCE Rosscalive died 14th Sep. 1941 aged 75 years and his wife MARY died 29th Mar. 1960 aged 89 years. In loving memory of PATRICK JOYCE Rossgalive died 24th Oct. 1973 aged 74 years. And his brothers MICHAEL 1904-1977 JAMES 1900-1986, JOHN 1913-1987. 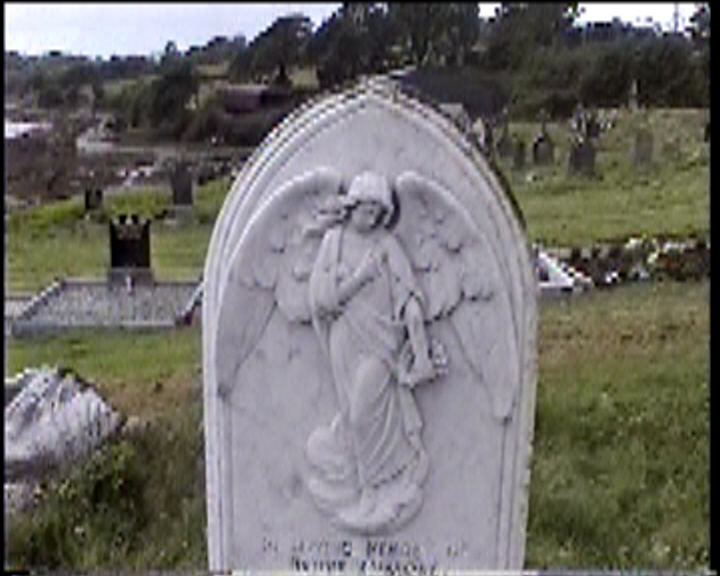 In loving memory of MARGARET JOYCE Griffith Ave. Dublin died 27th Aug. 1962 aged 38 years. 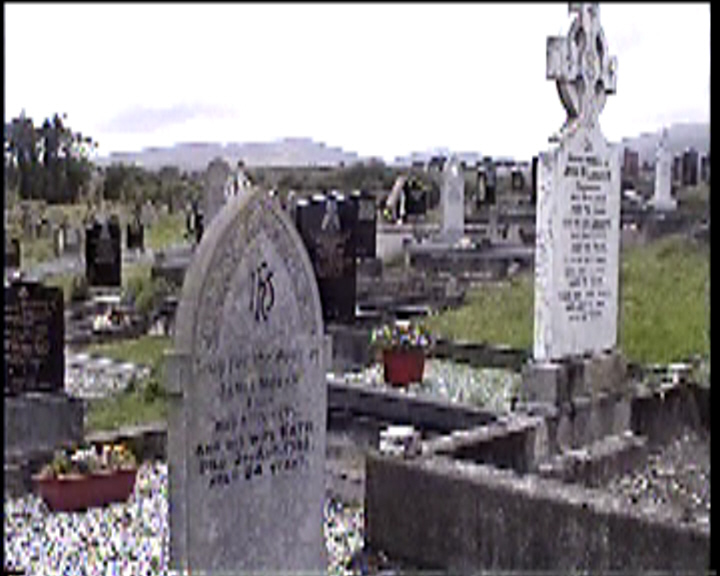 And her sister BRIDGIE O’REILLY (nee MORAN) Roskeen South died 4th Nov. 1991 aged 73 years. 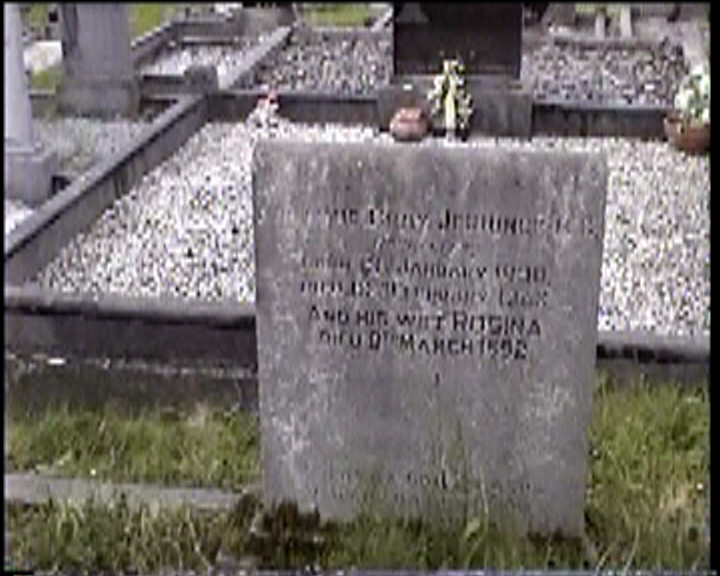 In loving memory of JAMES JOYCE Roigh died 6 Sep. 1960 aged 86 years. 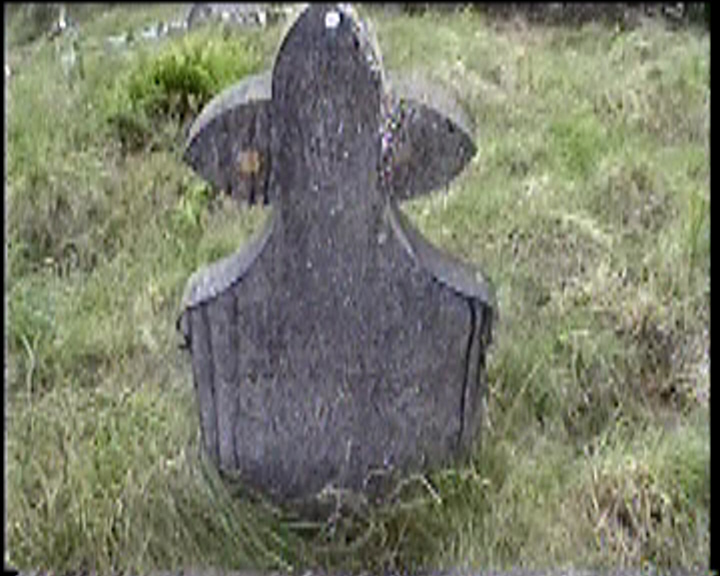 And his wife ANN, died 16 Sep. 1963 aged ?4 years. 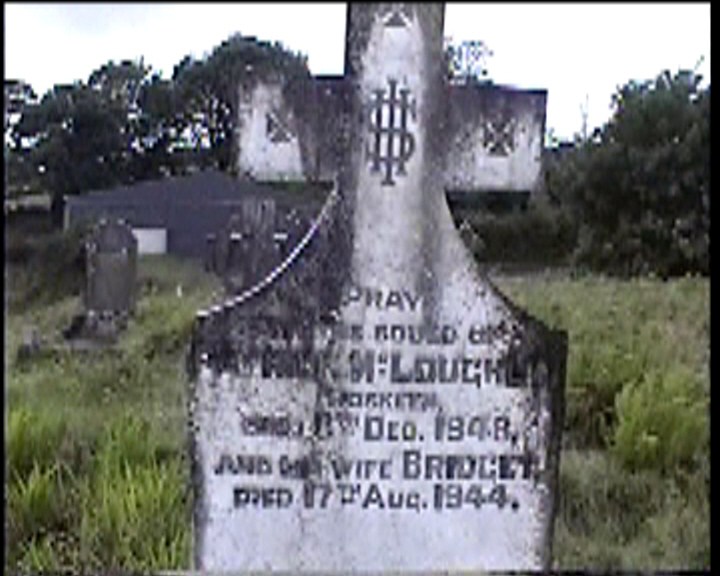 In loving memory of LOUISA JOYCE Rosturk died 21st Sept. 1979 aged 80 years. And her husband JAMES died 16th Feb. 1986 aged 88 years. 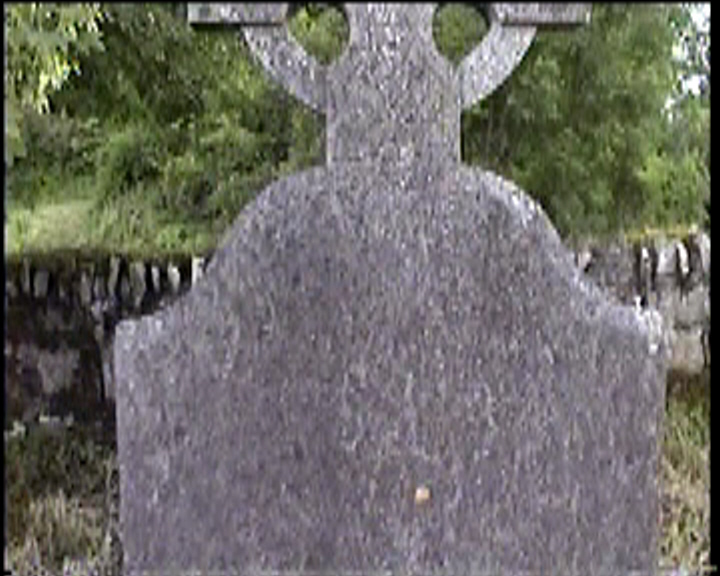 In loving memory of MARTIN KEANE Murrivaugh, who died Nov. 9th 1926. Also his wife MARGARET died June 6th 1934. 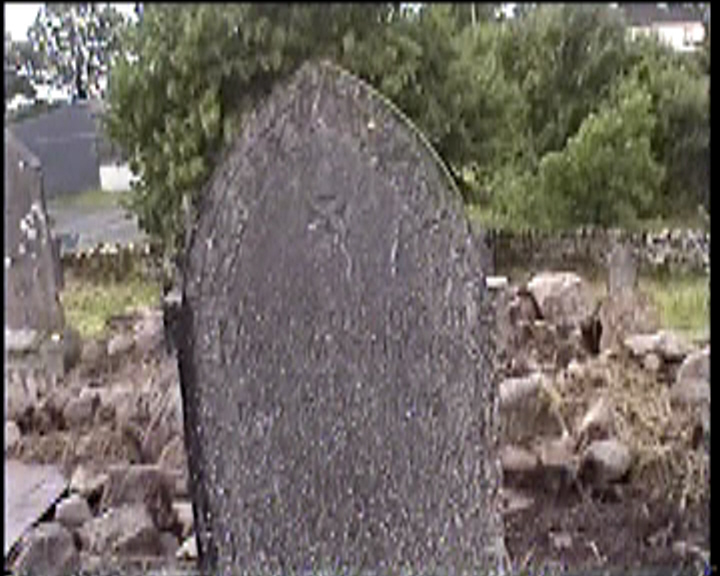 In memory of PAT KEANE Bunnahowna died 5th June 1923. 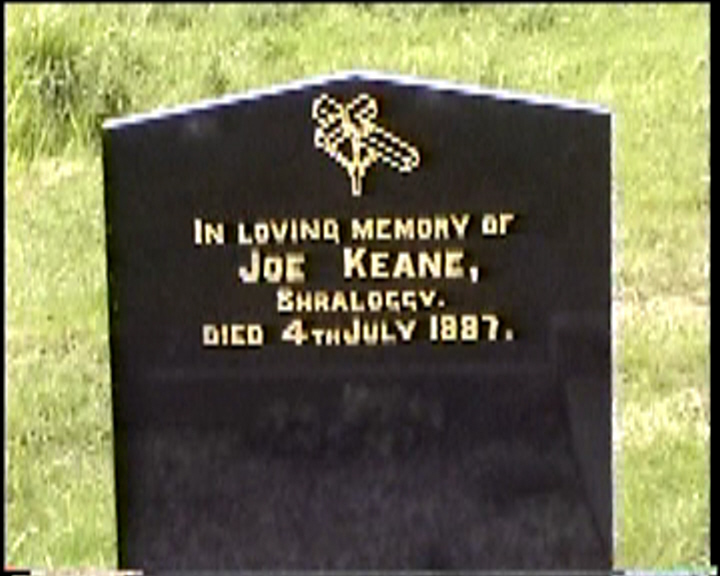 In loving memory of JOE KEANE,Shraloggy. 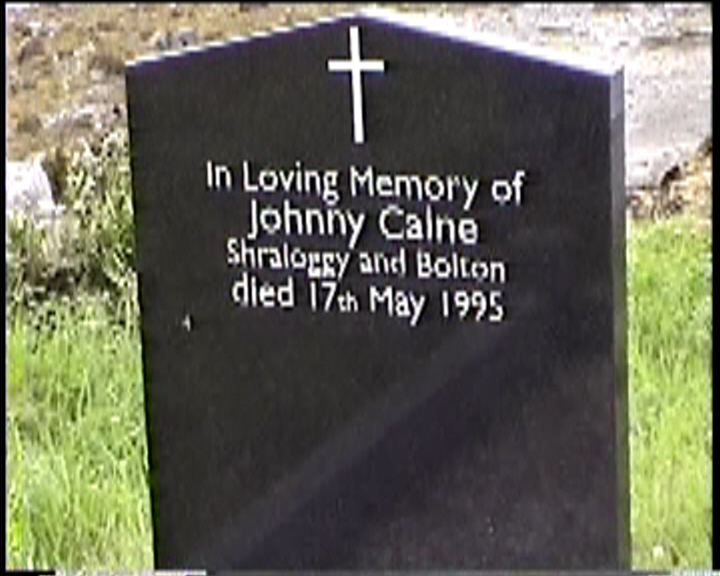 Died 4th July 1997. In loving memory of PATRICKJ. 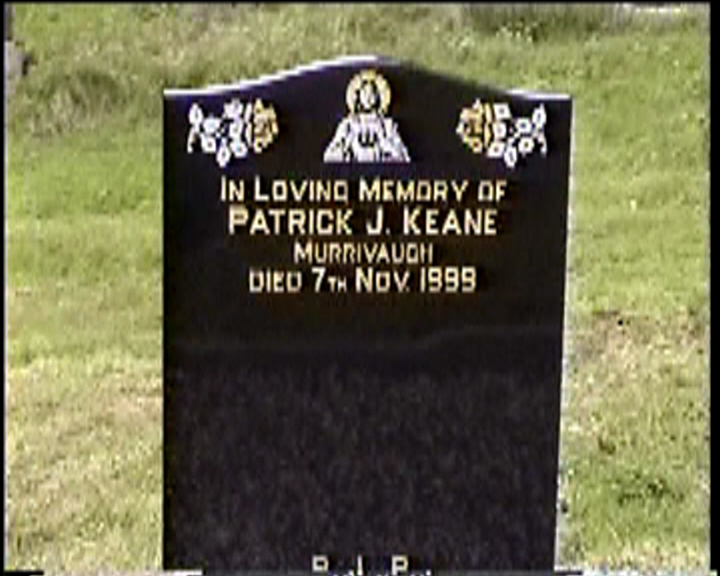 KEANE Murrivaugh died 7th Nov. 1999. 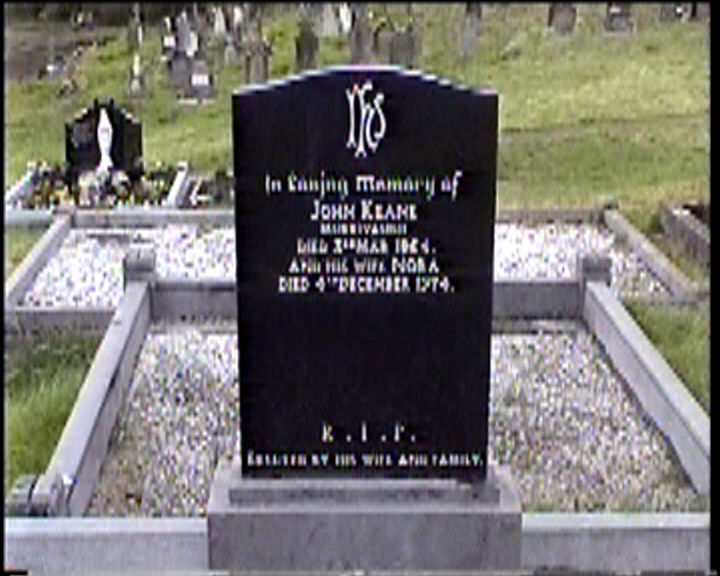 In loving memory of JOHN KEANE Murrivaugh died 3rd Mar. 1964. 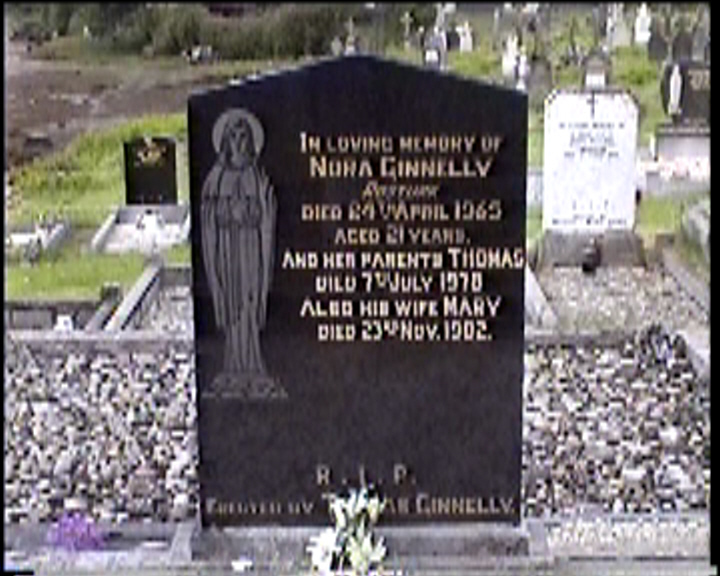 And his wife NORA died 4th December 1974. In loving memory of JOSEPH KEANE Rosturk. Died 24th May 1977, aged 53 years. And his wife ELIZABETH (LIZZIE) died 8 April 1993 aged 72 years. 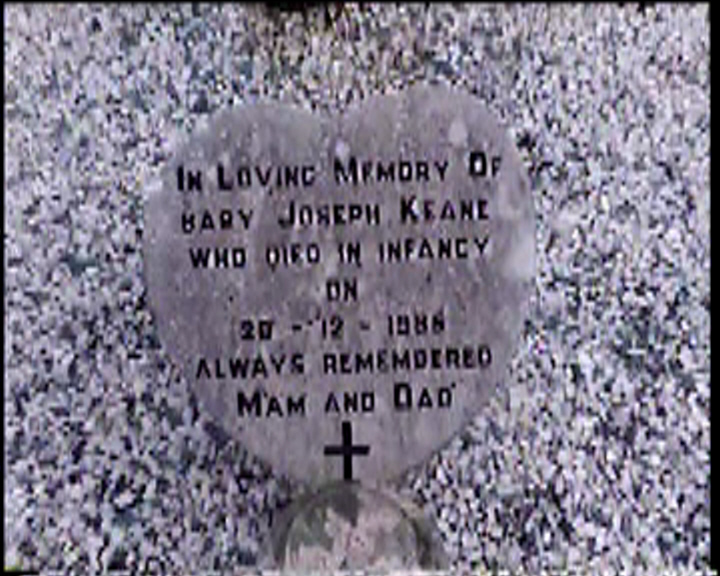 In loving memory of baby JOSEPH KEANE who died in infancy on 28.12.1985 Always remembered, Mom & Dad. 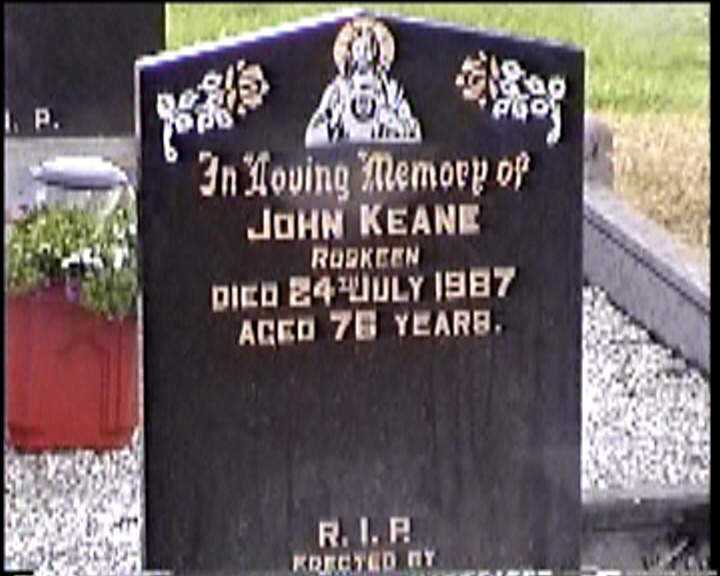 In loving memory of JOHN KEANE Roskeen died 24th July 1987 aged 76 years. Pray for the soul of SARAH A. KEENAN died 11th Mar. 1919 and her son JAMES JOSEPH died 8th Oct. 1920. Pray for the soul of MARTIN KELLY Rosturk died 10th Mar. 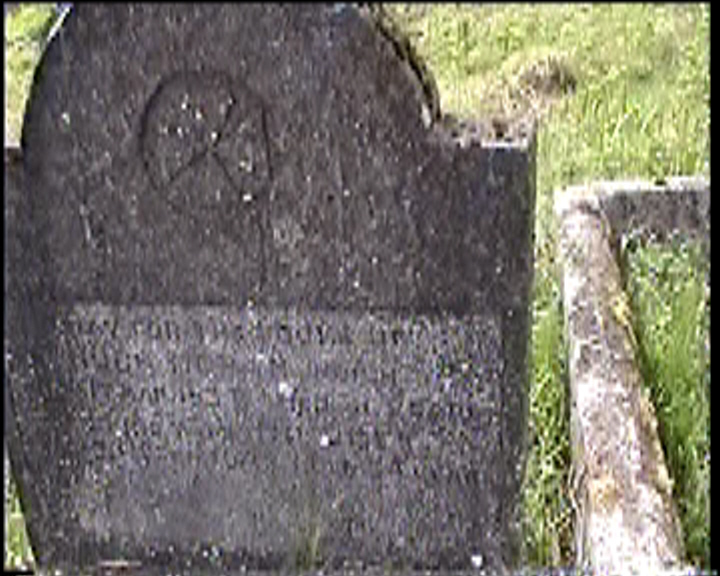 1924 aged 72 and of his son JOSEPH died 10th Nov. 1919 aged 26. 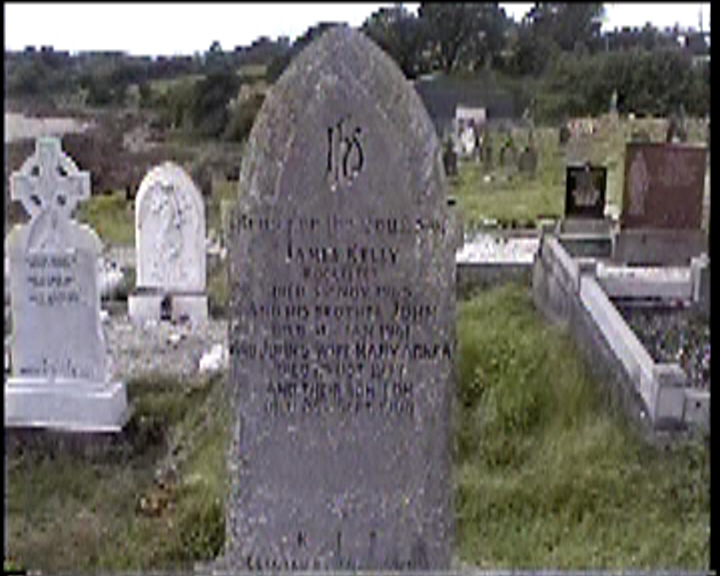 In loving memory of PATRICK KELLY Rosturk died 14th Dec. 1925 aged 75 and his daughter MARGARET died 28th Feb. 1919 aged 23. In loving memory of ANNIE KELLY Rosturk who died March 24th 1918 aged 64 years and her husband THOMAS died 23rd Feb. 1953 aged 99 years. 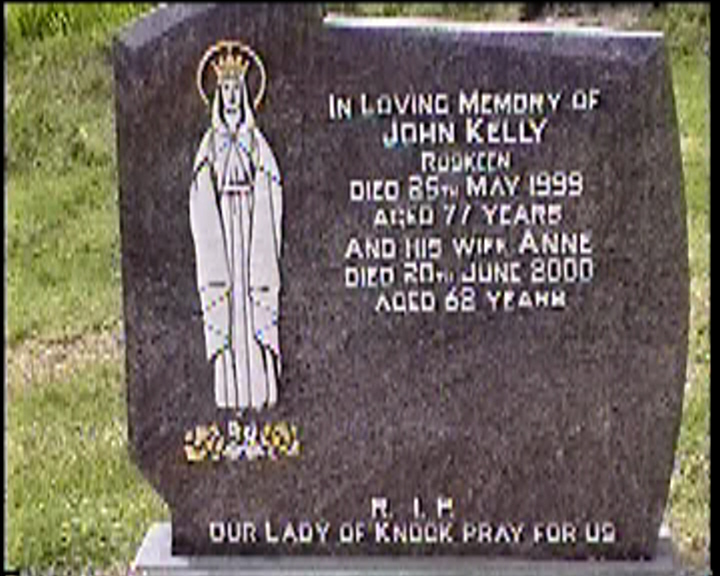 In loving memory of JOHN KELLY Roskeen died 25th May 1999 aged 77 years and his wife ANNE died 20th June 2000 aged 62 years. 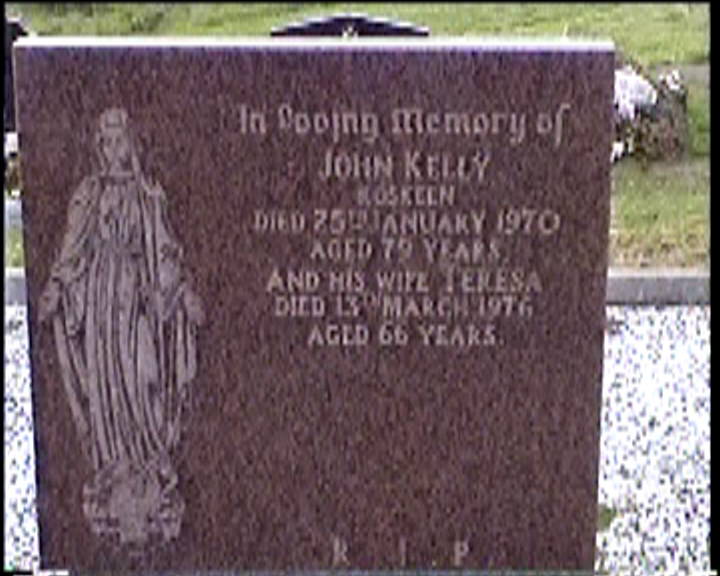 In loving memory of JOHN KELLY Roskeen died 25th January 1970 aged 79 years. And his wife TERESA died 13th March 1976 aged 66 years. 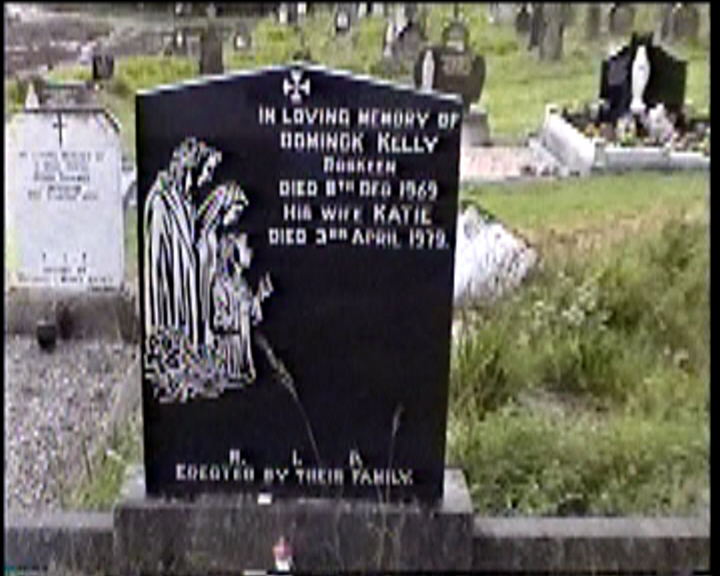 In loving memory of DOMINCK KELLY Roskeen died 8th Dec. 1969 and his wife KATIE died 3rd April 1979. 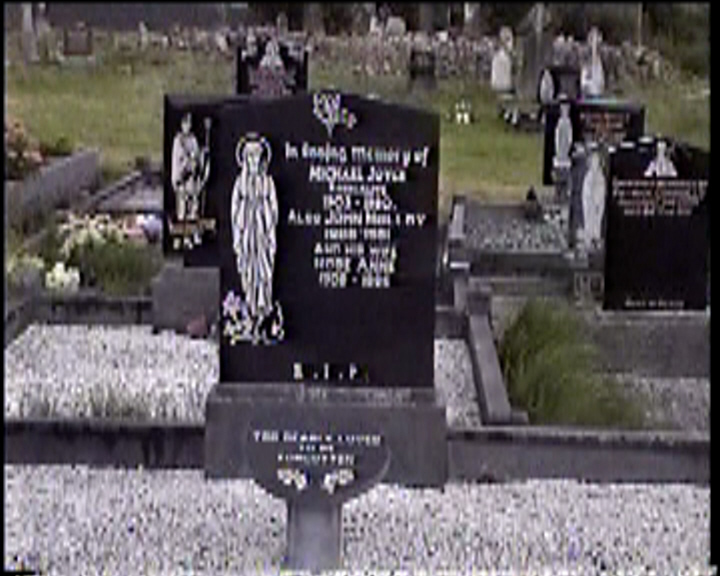 Pray for the souls of JAMES KELLY Rockfleet died 3rd Nov. 1965 and his brother JOHN died 31st Jan. 1961 and John’s wife MARY AGNES died 2nd Oct. 1977 and their son TOM died 25th Sept. 1984. In loving memory of MARTIN KELLY Rosturk died 6th Aug. 1953, MARTIN KELLY died 22nd July 1985. In loving memory of MARY ANNE KELLY Rosturk died 18th Oct. 1976. In loving memory of JOHN KILCOYNE Rosturk, died 5th Mar. 1957, aged 85 years, and his wife ANNE, died 9th Jan. 1957, aged 83 years. 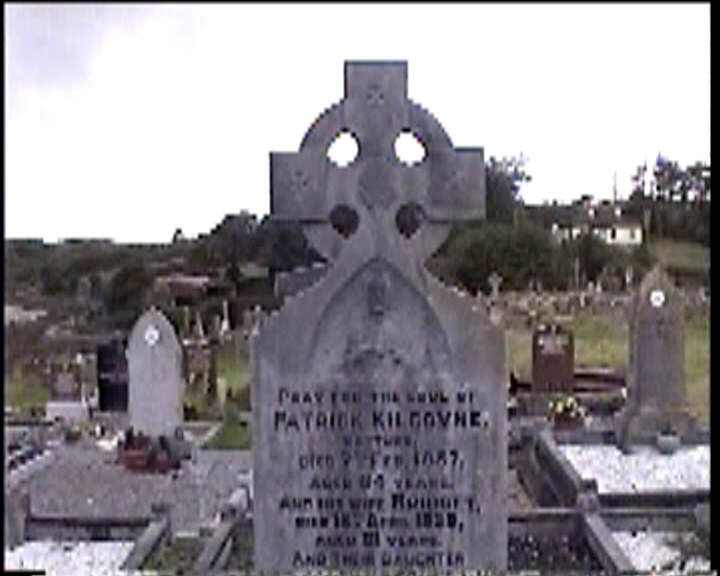 Pray for the soul of PATRICK KILCOYNE, Rosturk, died 7th Feb. 1957, aged 84 years. And his wife BRIDGET, died 18th April 1959, aged 81 years. 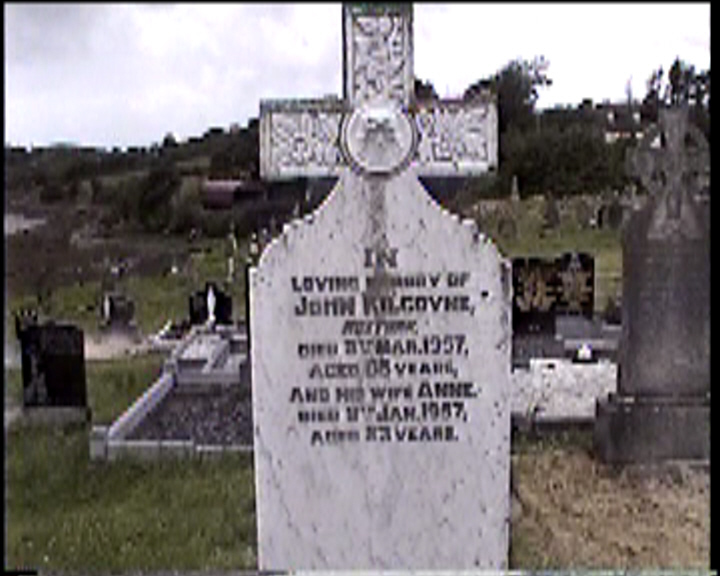 And their daughter ELLEN KILCOYNE LAVCO died 24th Mar. 1999 aged 91 years. 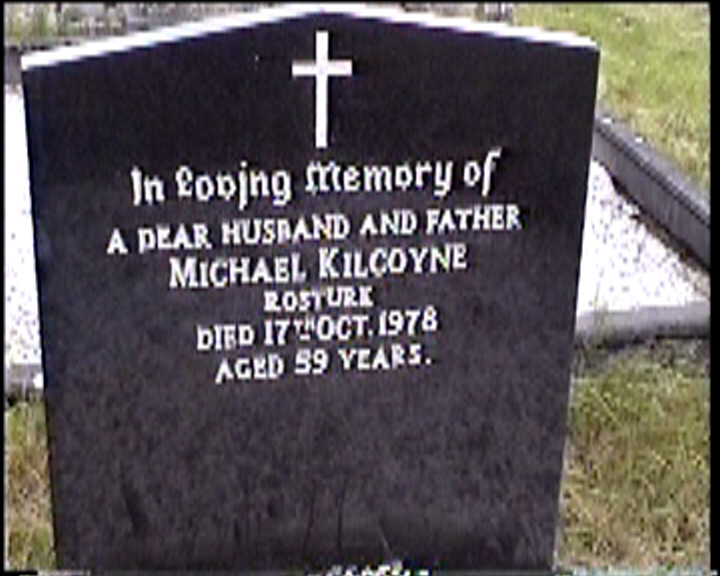 In loving memory of a dear husband and father MICAHEL KILCOYNE Rosturk died 17th Oct. 1978 aged 59 years. 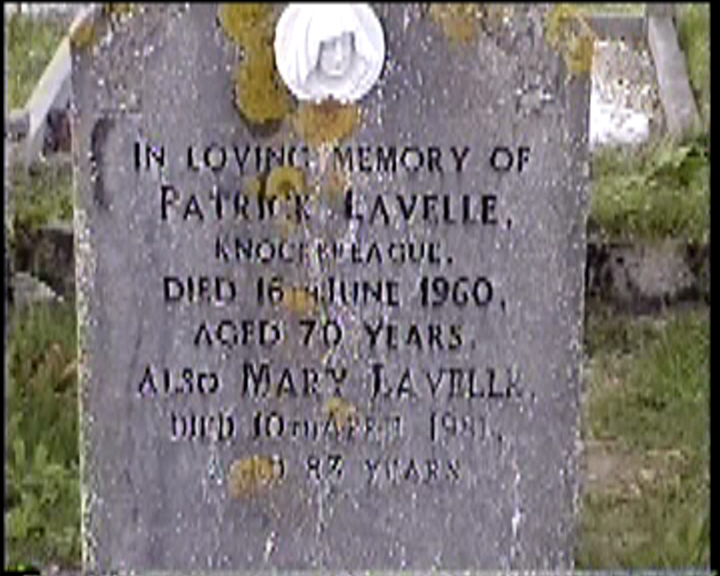 In loving memory of PATRICK LAVELLE, Knockbreague. Died 16th June 1960, aged 70 years. Also MARY LAVELLE, died 10th April 1981 aged 83 years. 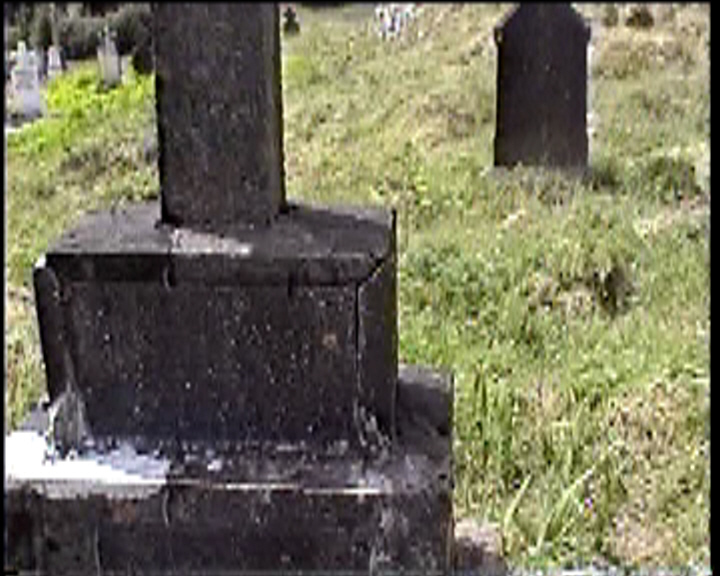 In loving memory of JOHN LOFTUS Bunnahowna, died 11th Oct. 1922 aged 56 years. 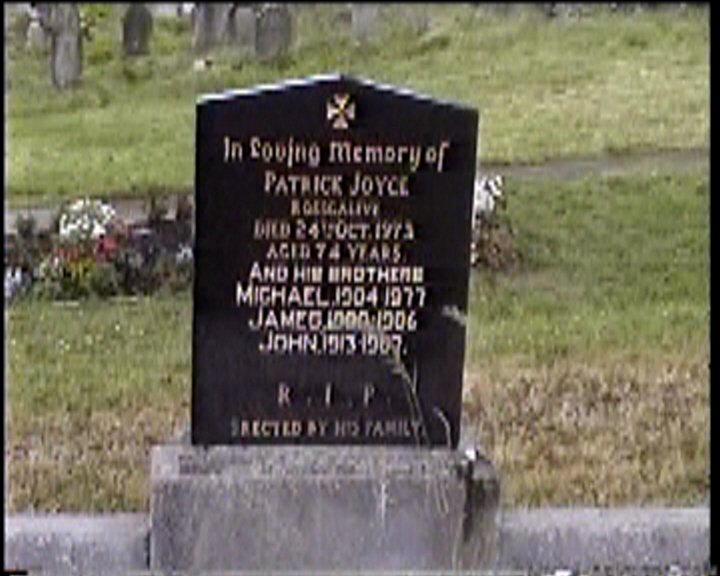 And his son PATRICK died 21st Jan. 1976 aged 66 years. 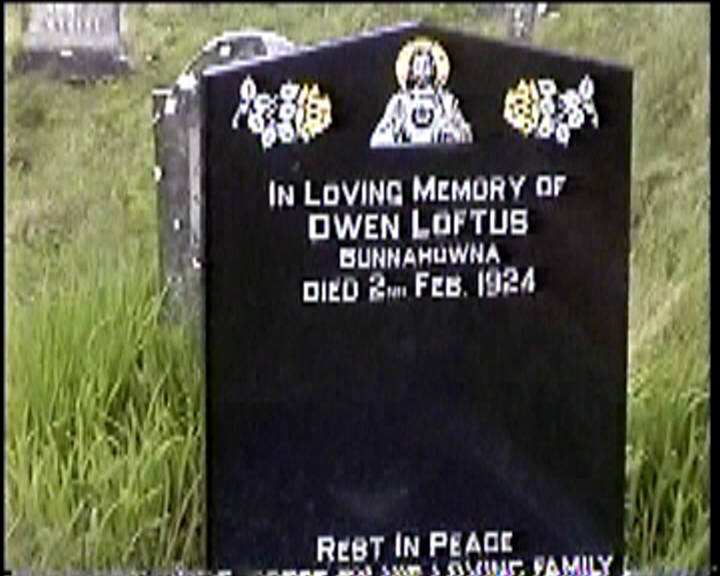 In loving memory of OWEN LOFTUS Bunnahowna died 2nd Feb. 1924. 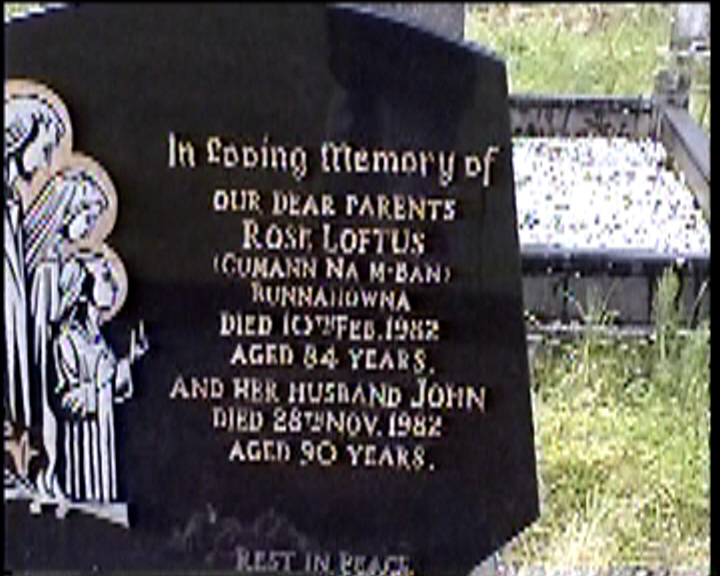 In loving memory of our dear parents ROSE LOFTUS (Cumann Na M-Ban) Bunnahowna died 10th Feb. 1982 aged 84 years. 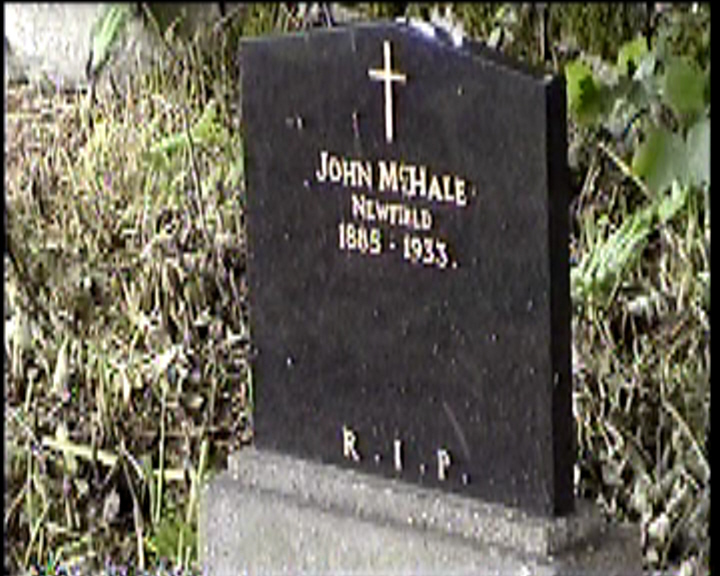 And her husband JOHN died 28th Nov. 1982 aged 90 years. 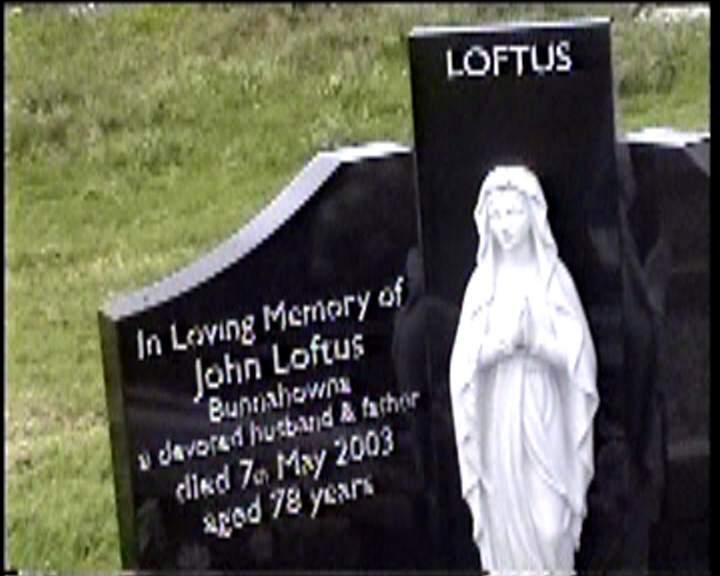 In loving memory of JOHN LOFTUS Bunnahowna, a devoted husband and father died 7th May 2003 aged 78 years. 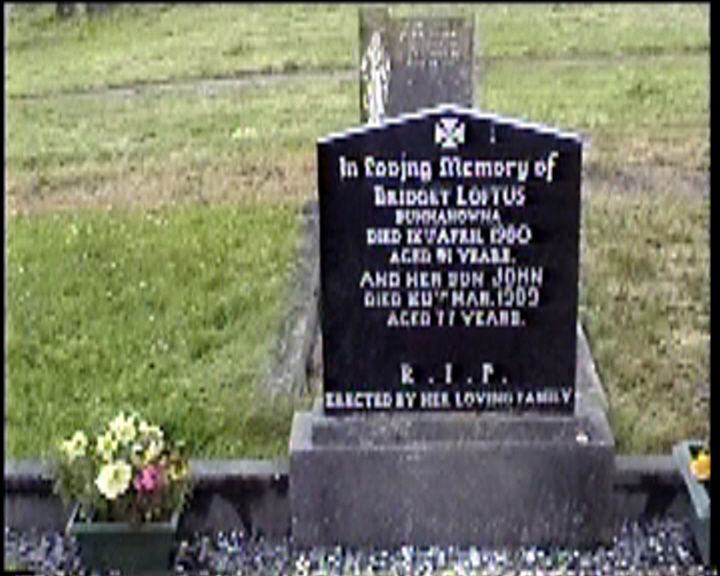 In loving memory of BRIDGET LOFTUS Bunnahowna died 12th April 1980 aged 91 years. 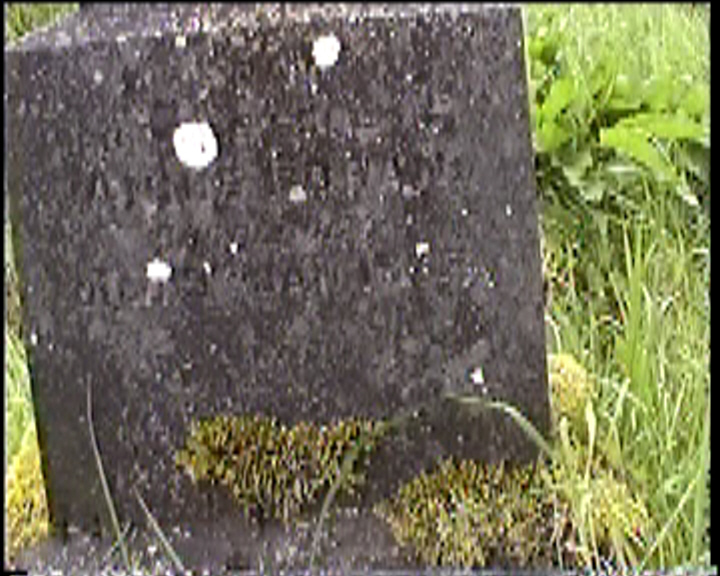 And her son JOHN died 20th Mar. 1989 aged 77 years. 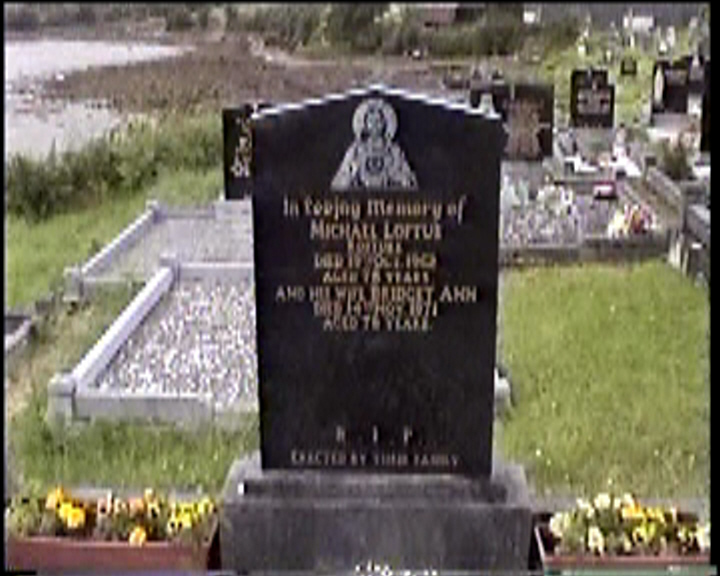 In loving memory of MICHAEL LOFTUS Rosturk died 19th Oct. 1962 aged 78 years. 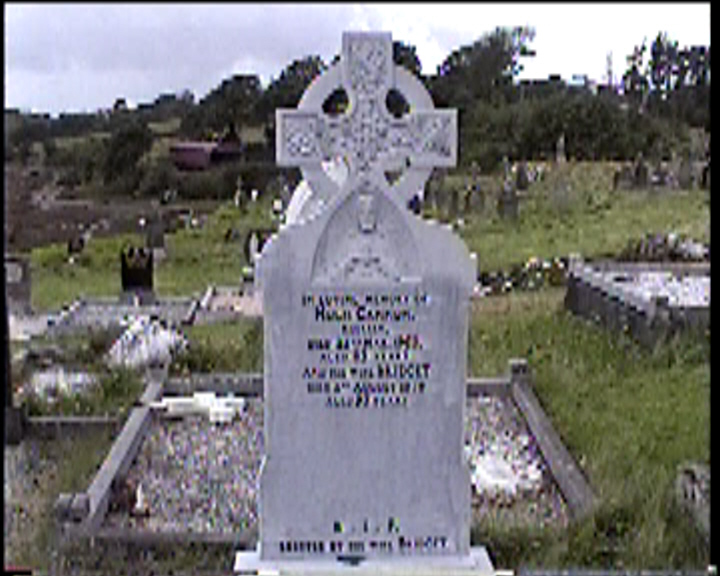 And his wife BRIDGET ANN died 14th Nov. 1971 aged 78 years. 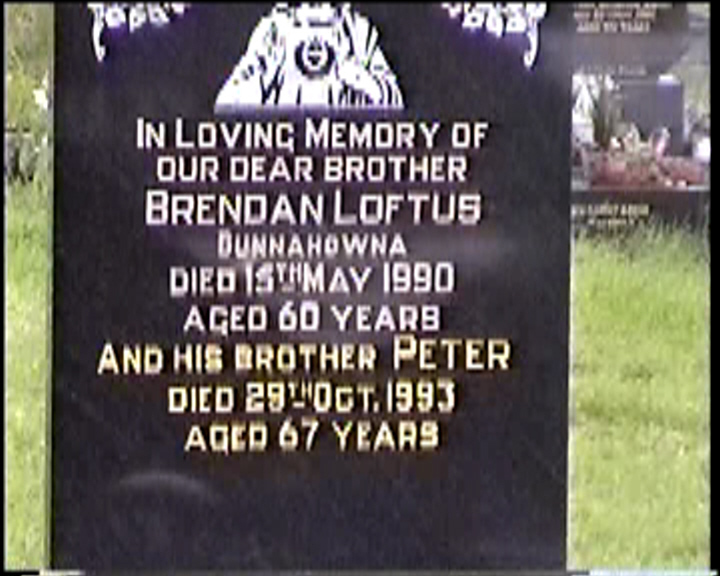 In loving memory of our dear brother BRENDAN LOFTUS Bunnahowna died 15th May 1990 aged 60 years and his brother PETER died 29th Oct. 1993 aged 67 years. 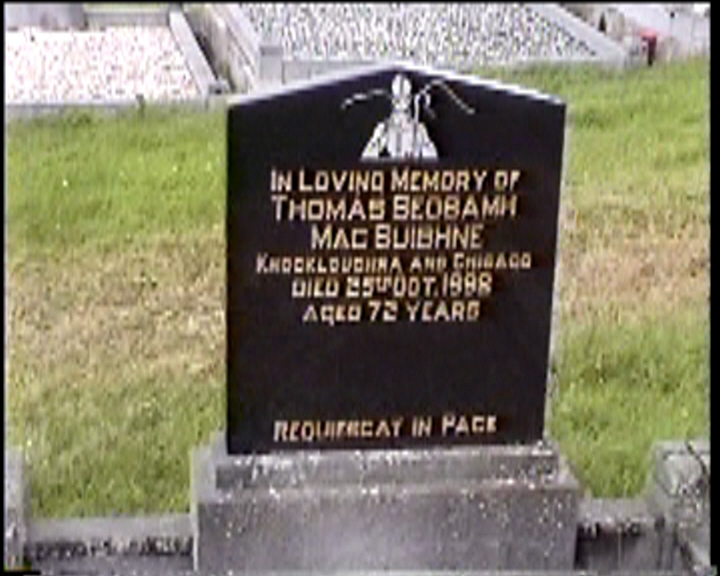 In loving memory of THOMAS SEOSAMH MACSUIBHNE Knockloughra and Chicago died 25th Oct. 1992 aged 72 years. 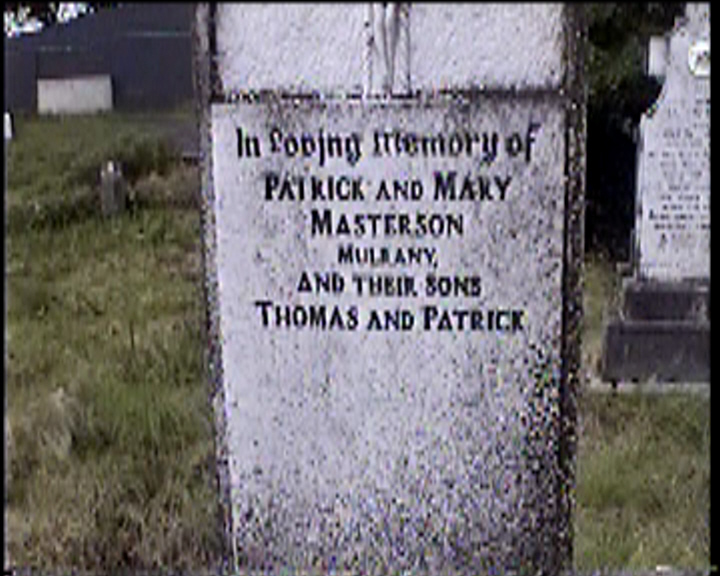 In loving memory of PATRICK and MARY MASTERSON Mulrany, and their sons THOMAS and PATRICK. 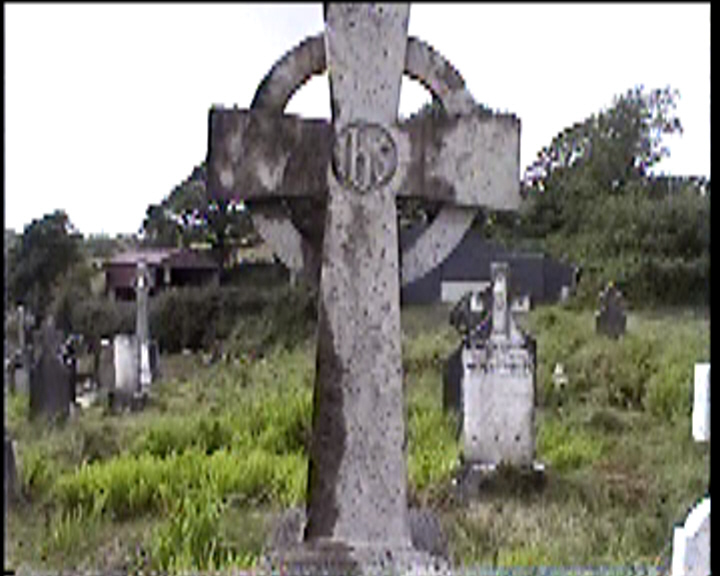 In loving memory of THOMAS MASTERSON Mulrany died 21st Oct. 1931. 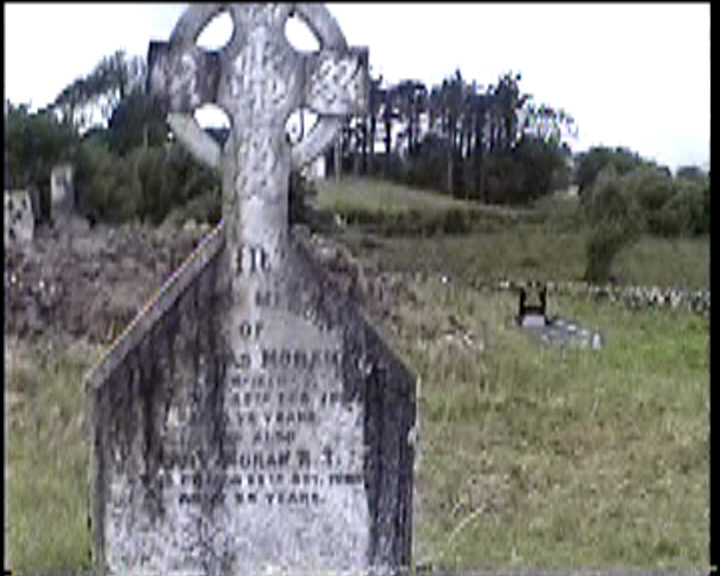 And his brother OWEN died 16th Feb. 1932. 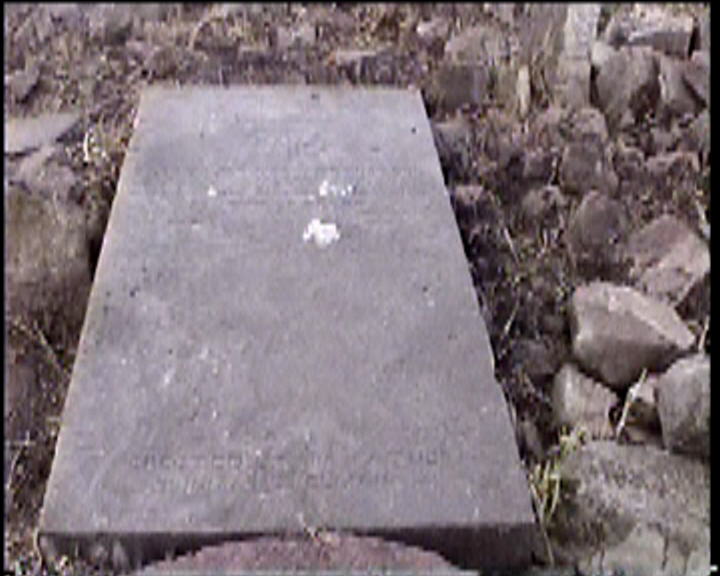 In loving memory of MICHAEL MCCORMACK Roskeen died 3rd May 1960. 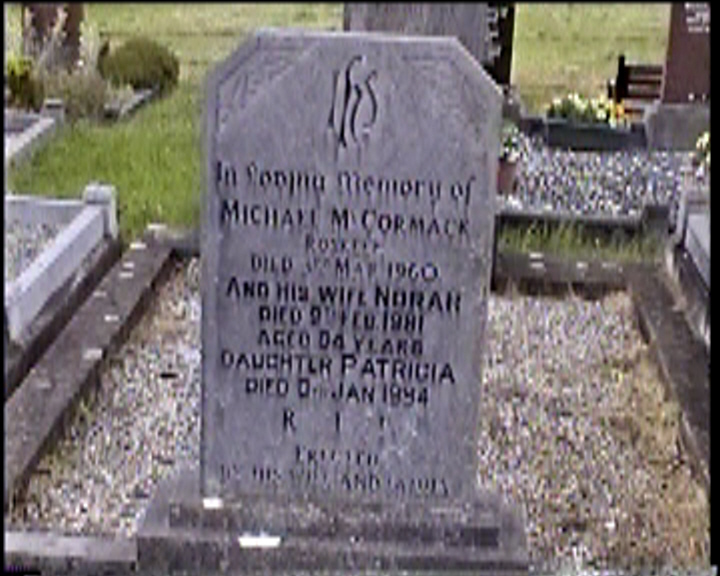 And his wife NORAH died 9th Feb. 1981 aged 84 years. Daughter PATRICIA died 8th Jan. 1994. With cherished and loving memories always. RITA MCGINTY late of Rosturk. 13th January 1937 – 8th April 1996. 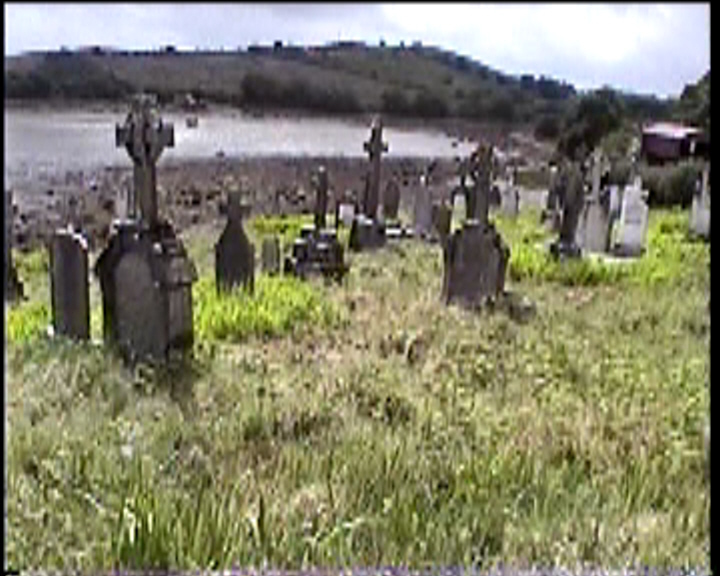 Pray for the soul of HONOR MCGLYNN died 7th Oct. 1901 aged 48 years. 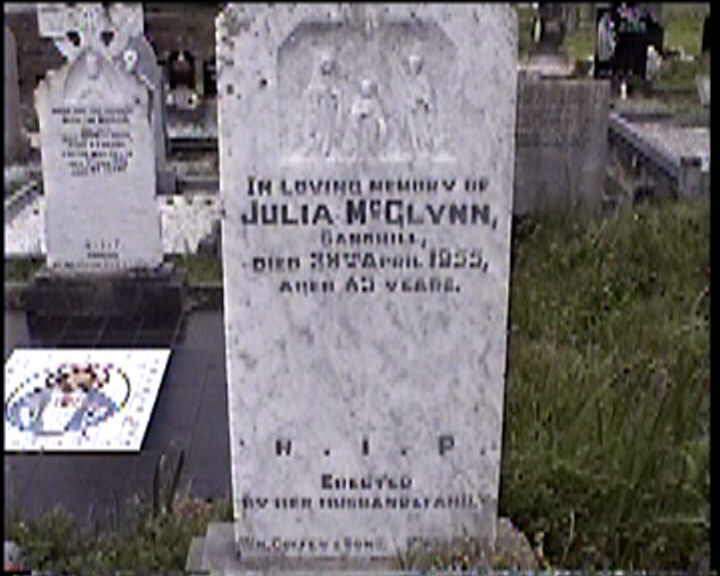 In loving memory of JULIA MCGLYNN, Sandhill, died 29th April 1955, aged 65 years. 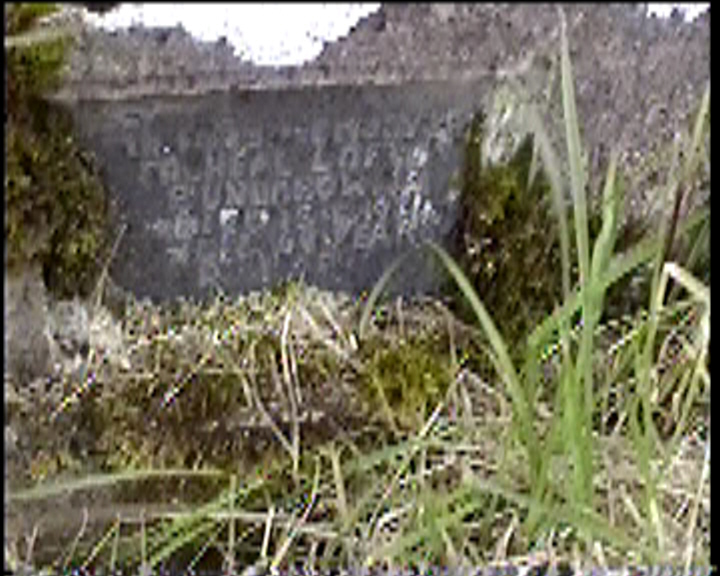 Pray for the souls of LAWRENCE MCGOVERN Newfield died 22nd Aug. 1931 aged 82 years and his wife BRIDGET died 23rd June 1944 aged 92 years. 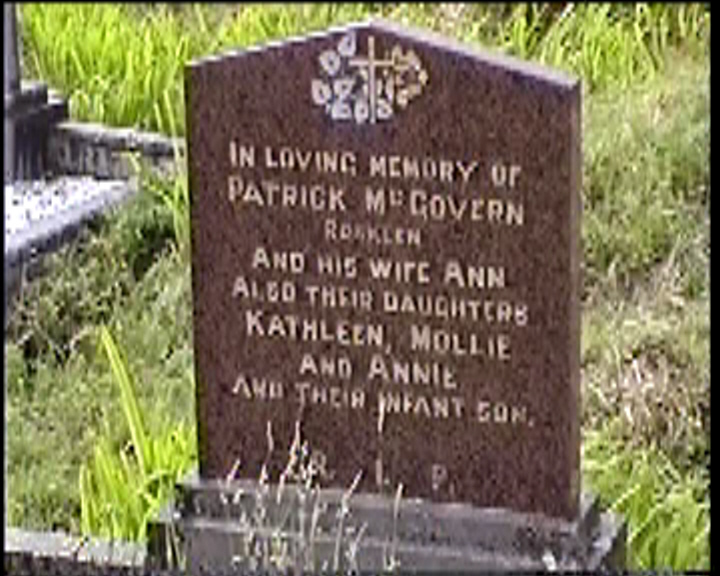 In loving memory of PATRICK MCGOVERN Roskeen and his wife ANN also their daughters KATHLEEN, MOLLIE, and ANNIE and their infant son. 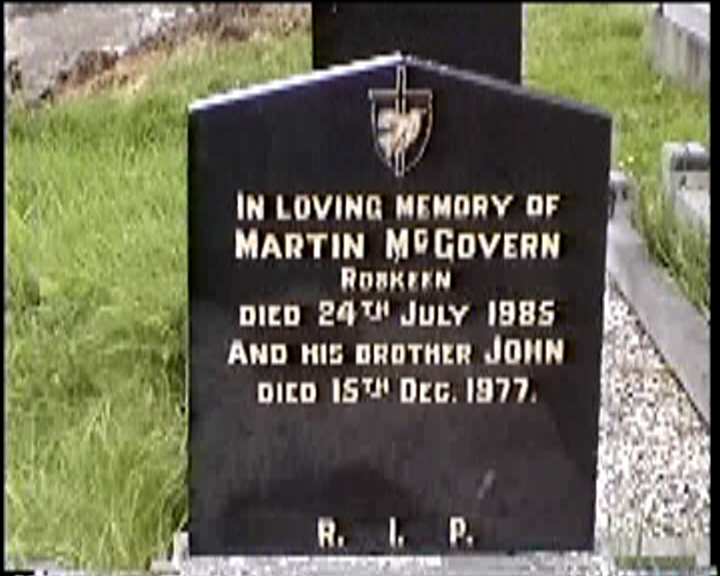 In loving memory of MARTIN MCGOVERN Roskeen died 24th July 1985 and his brother JOHN died 15th Dec. 1977. 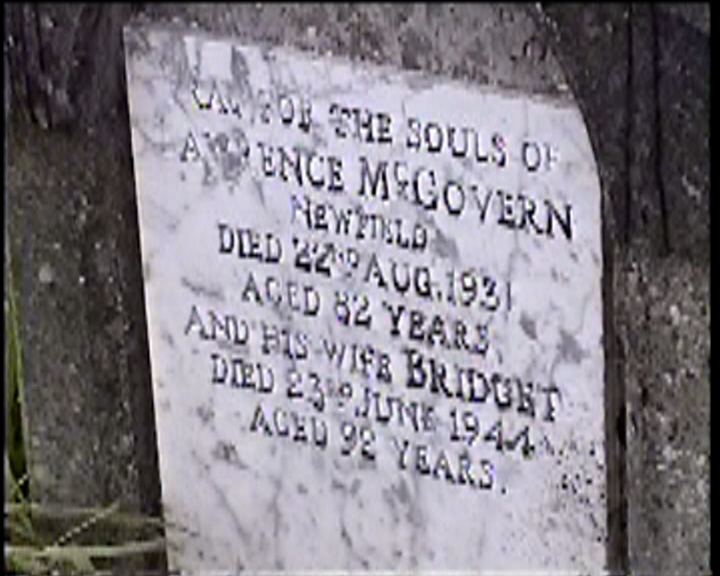 In loving memory of ANNIE MCGOVERN Newfield died 18th Oct. 1967 aged 61 years. 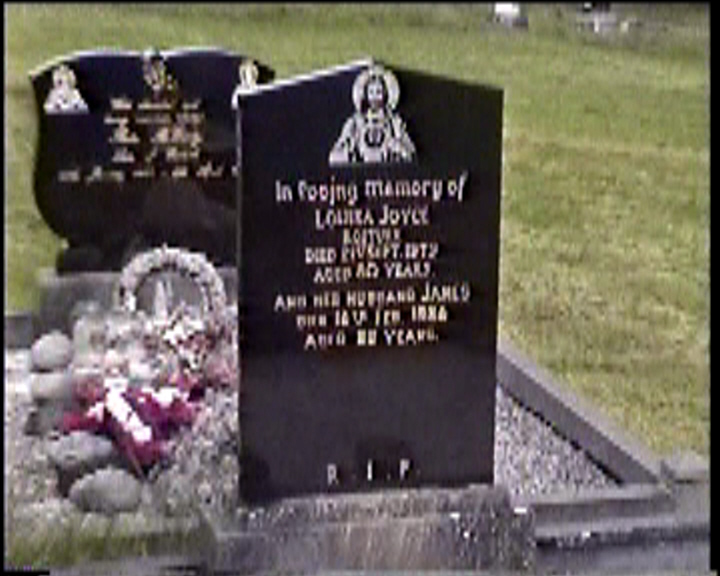 Also her husband LARRY died 13th Aug. 1985 aged 89 years. Member of the old IRA. 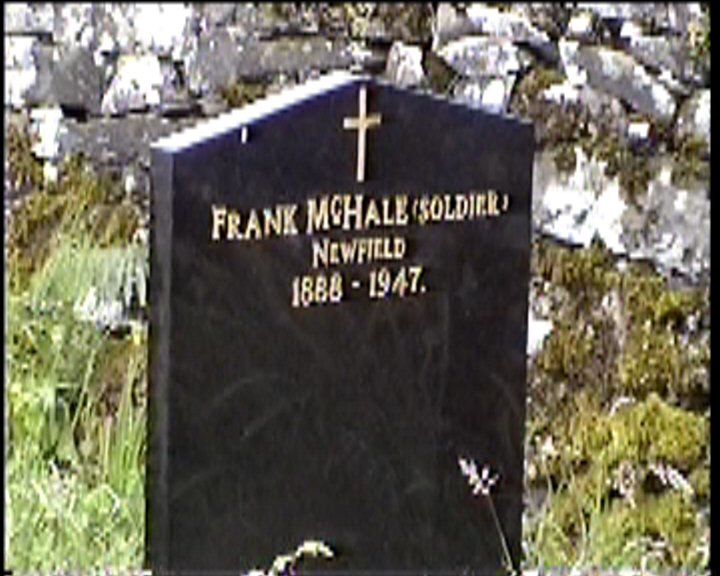 FRANK MCHALE (soldier) Newfield 1888-1947. 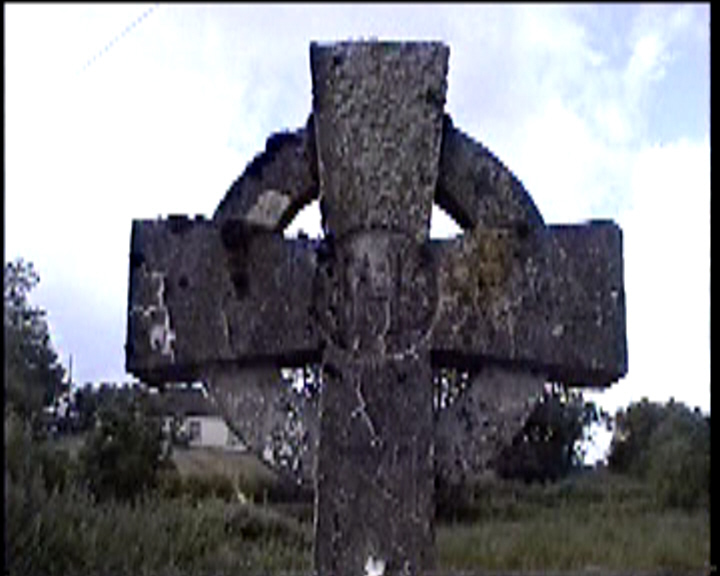 Pray for the sould of PHIL MCHALE of Innishtubrid who died Aug. the 11th 1911 aged 89 years also his son PHIL who died Jan. the 28th 1937 aged 50 years. 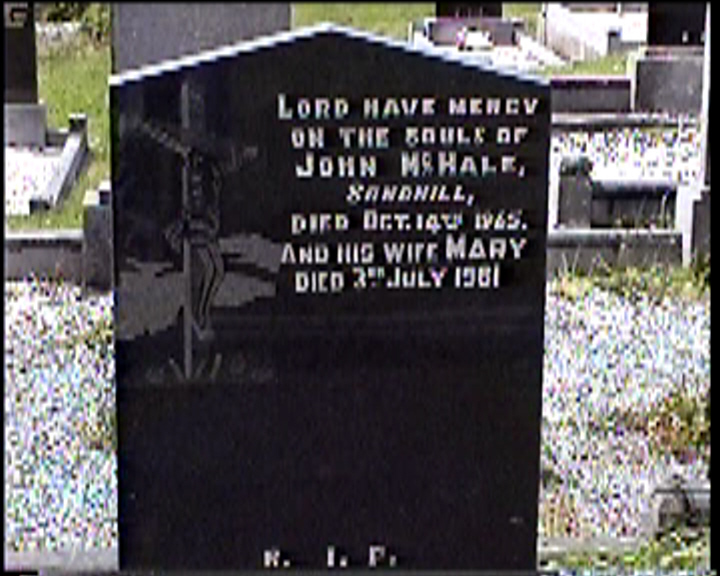 Lord have mercy on the souls of JOHN MCHALE, Sandhill, died Oct. 14th 1965. And his wife MARY died 3rd July 1981. 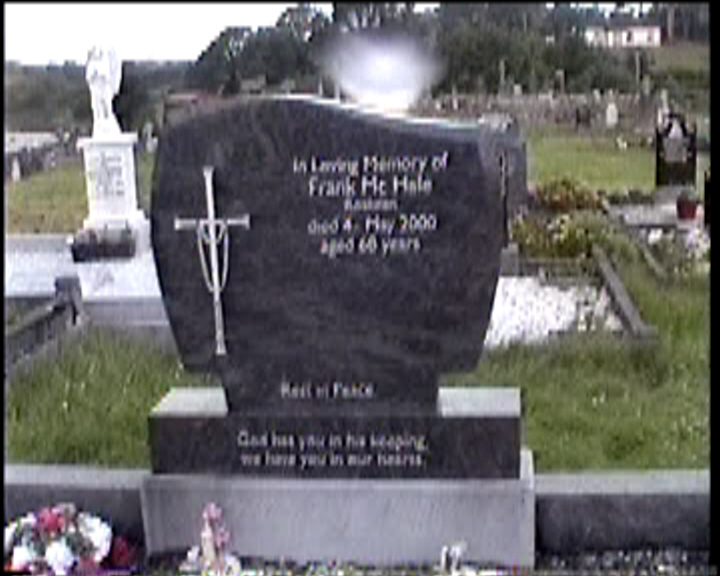 In loving memory of FRANK MCHALE Roskeen died 4th May 2000 aged 68 years. 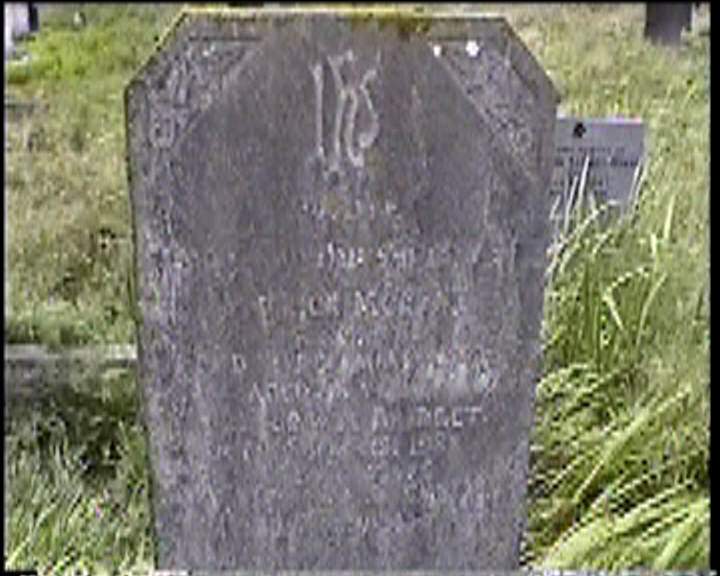 In loving memory of THOMAS MCHALE Roskeen Dec. 21st 1888 to April 10th 1979 and his wife KATE Sept. 26th 1896 to Oct. 3rd 1980. 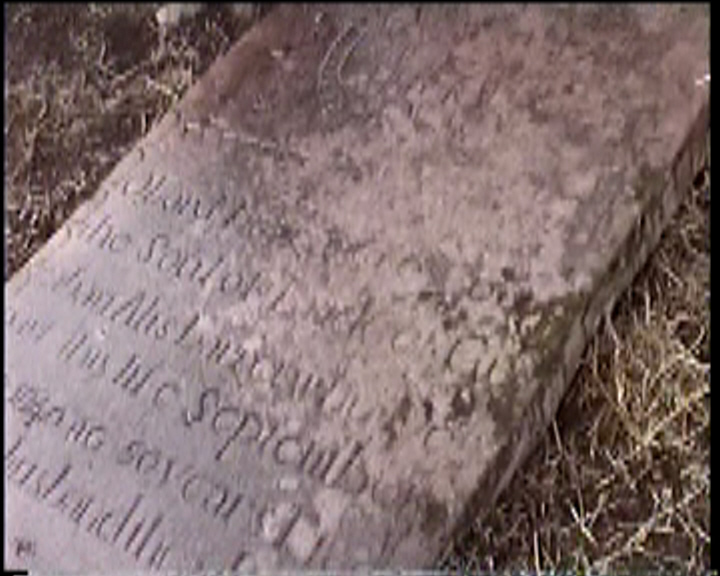 The Lord have mercy on the soul of GREAS MCLAUGHLIN alias GALAGHER death 1822 aged 69 years. Pray for the soul of MARY MORAN died Feb. 17th, 1873 aged 42 years. 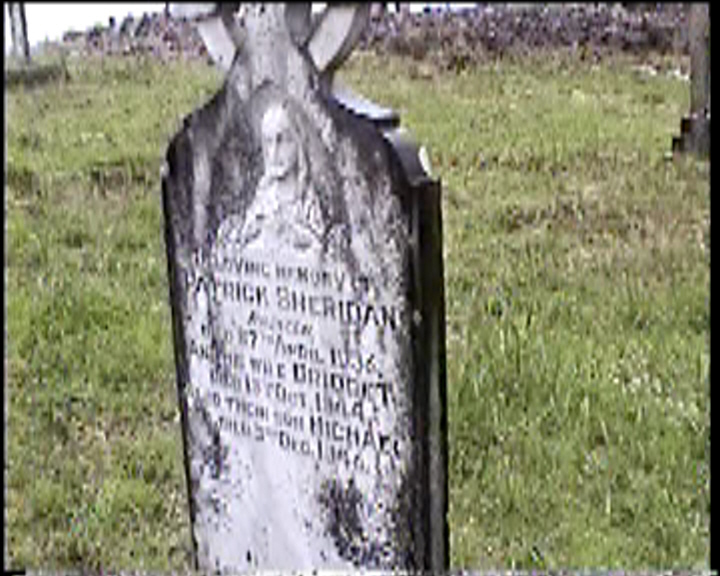 Also her husband PATRICK MCLOUGHLIN died 26th May 1887 aged 62 years. 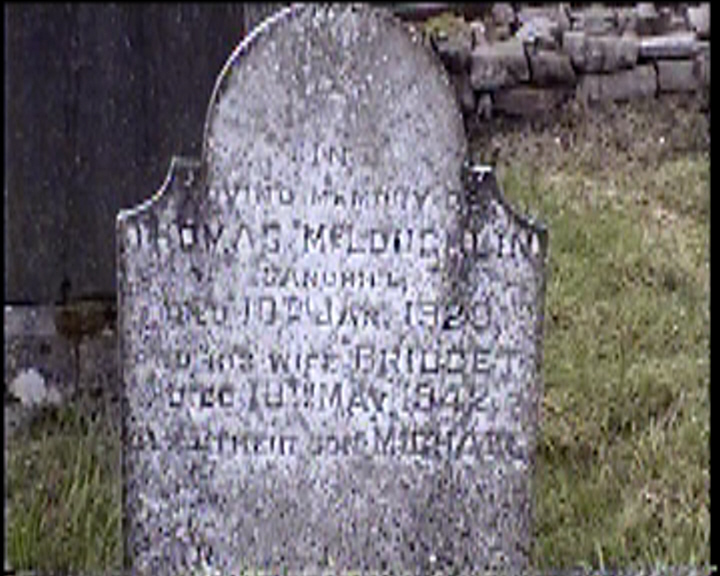 Their son PETER died Nov. 26th, 1927 aged 64 years. 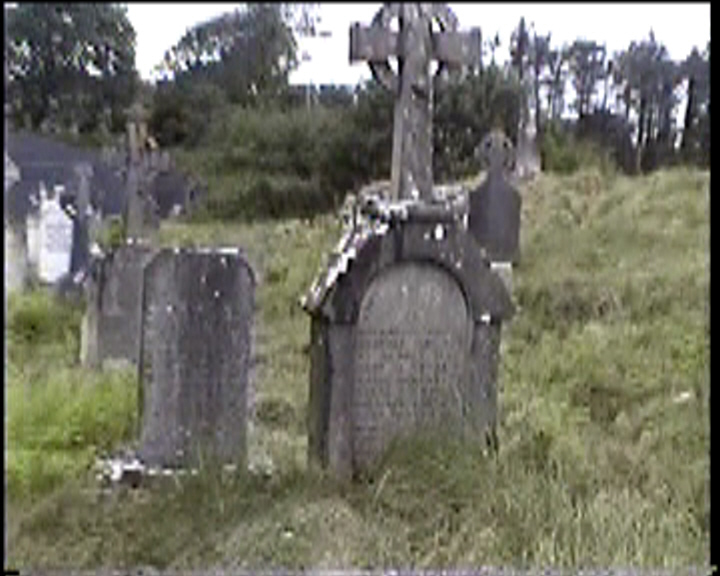 Pray for the souls of PATRICK MCLOUGHLIN Roskeen died 8th Dec. 1948 and his wife BRIDGET died 17th Aug. 1944. In loving memory of THOMAS MCLOUGHLIN Sandhill died 10th Jan. 1929 and his wife BRIDGET died 18th May 1942 and their son MICHAEL. 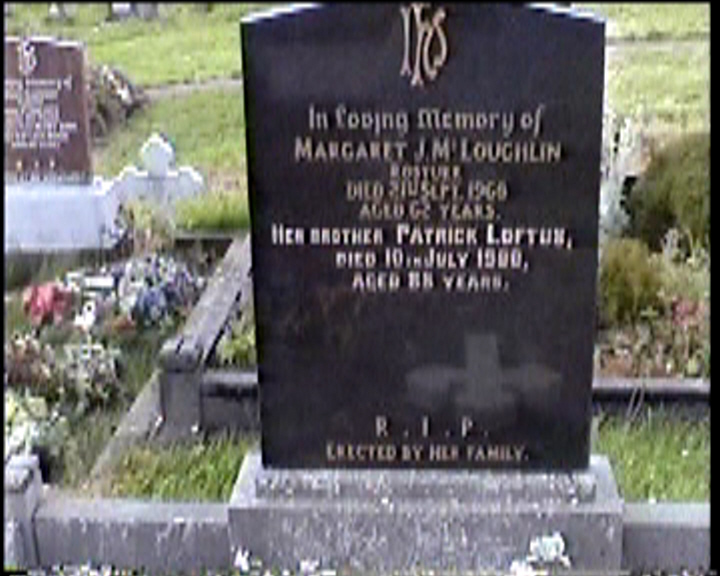 In loving memory of MARGARET J. MCLOUGHLIN Rosturk died 21st Sept. 1968 aged 62 years. 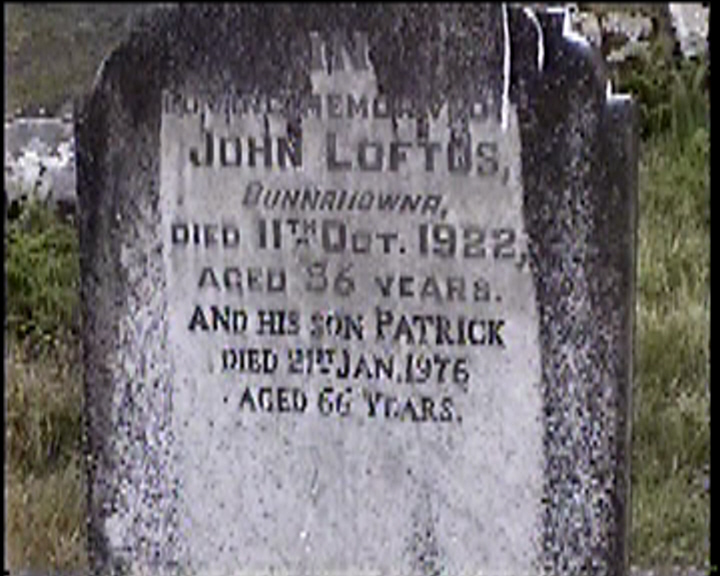 Her brother PATRICK LOFTUS, died 10th July 1988 aged 85 years. In loving memory of PATRICK MCLOUGHLIN Sandhill died 6th May 1964 aged 73 years, and his wife NORA died 27th Sep. 1963 aged 61 years. 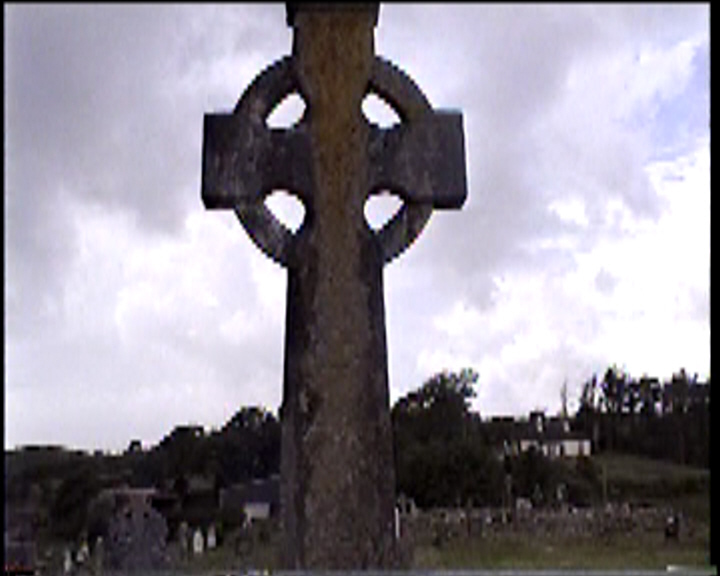 In loving memory of JOHN MCLOUGHLIN Knockbreaga, died Mar. 1, 1958 aged 73 years. 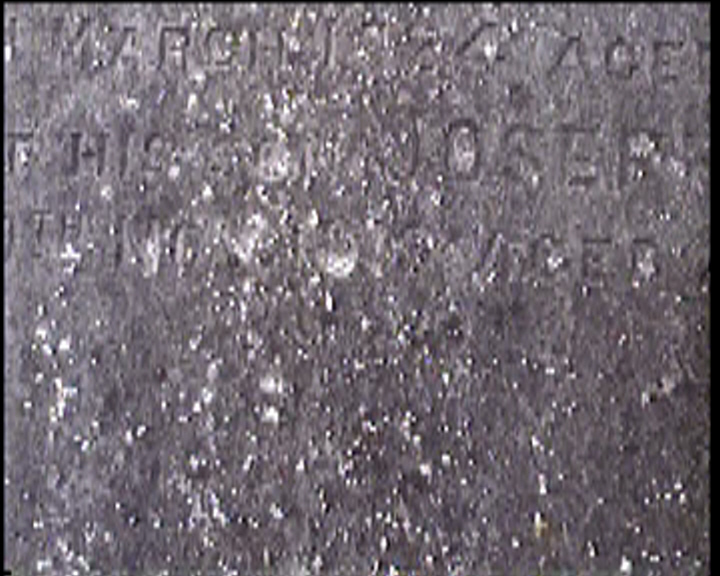 And his son JOSEPH died Aug. 1, 1957 aged 28 years. 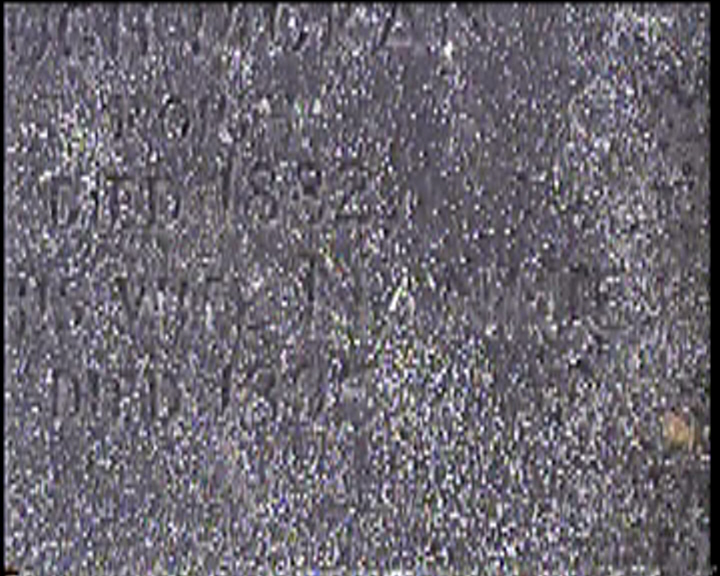 Also his wife ANNIE died Oct. 22, 1968 aged 76 years. 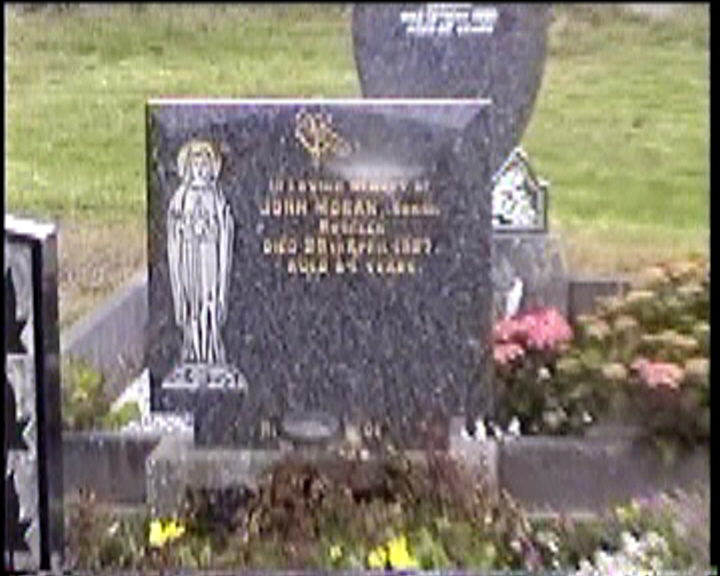 Their son JOHN JOSEPH died July 14, 1988 aged 64 years. 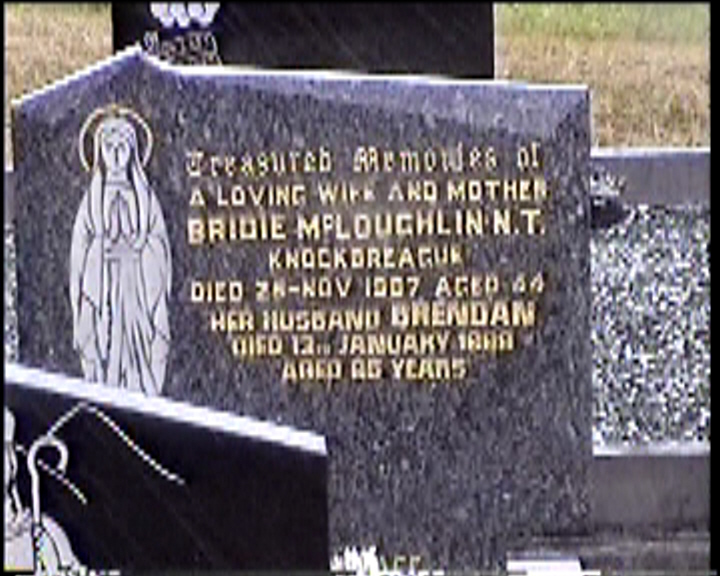 Treasured memories of a loving wife and mother BRIDIE MCLOUGHLIN N.T. 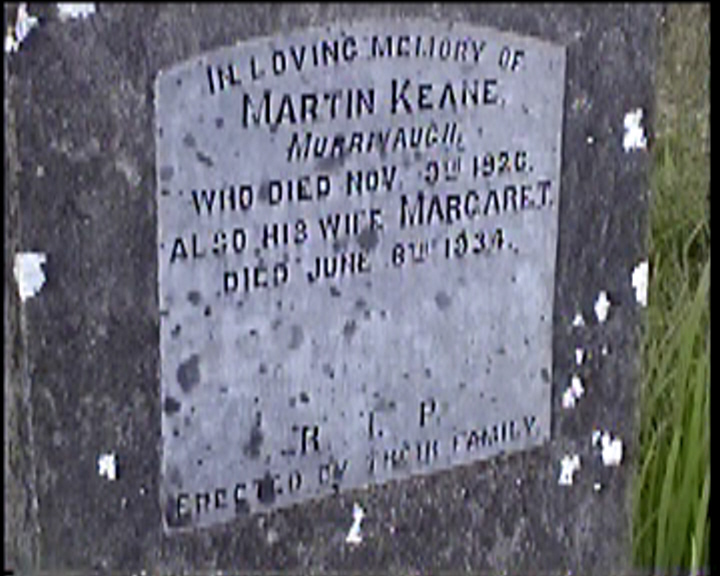 Knockbreague died 25th Nov. 1987 aged 44. 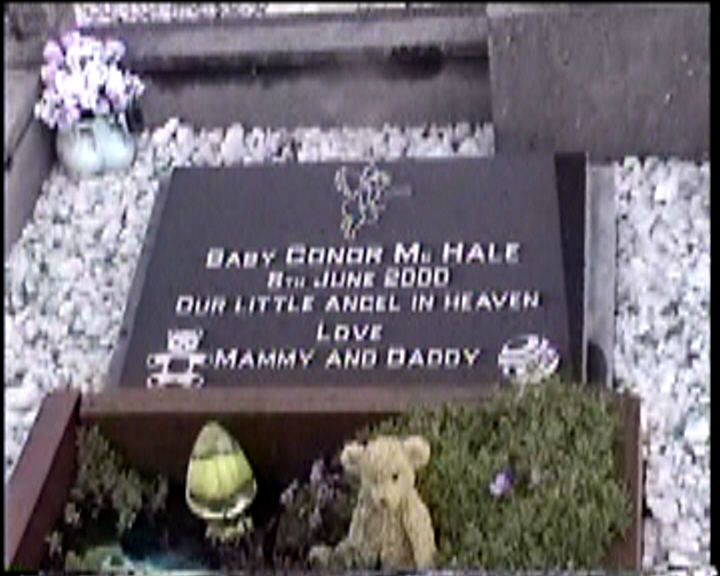 Her husband BRENDAN died 13th January 1999 aged 65 years. In loving memory of MICHAEL MCMANAMON died 17th Dec. 1921 aged 23 years. Tourtured in prison by British soldiers for being a brave soldier of the Irish Republic. 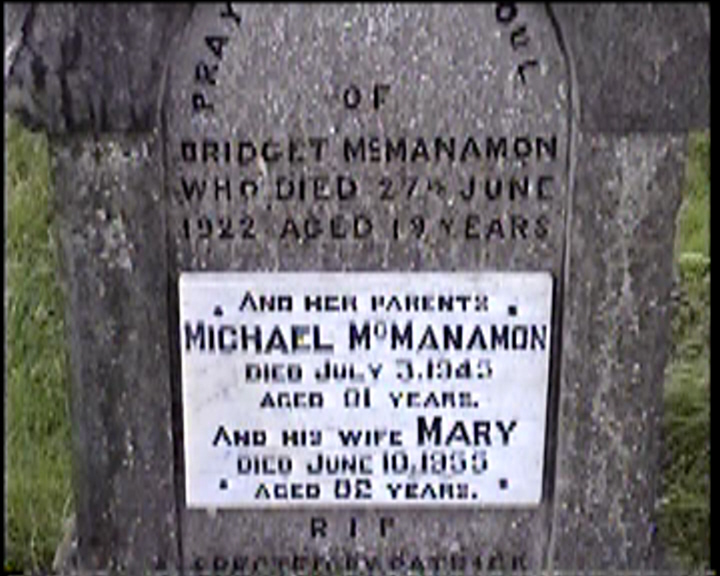 Pray for the soul of BRIDGET MCMANAMON who died 27th June 1922 aged 19 years. 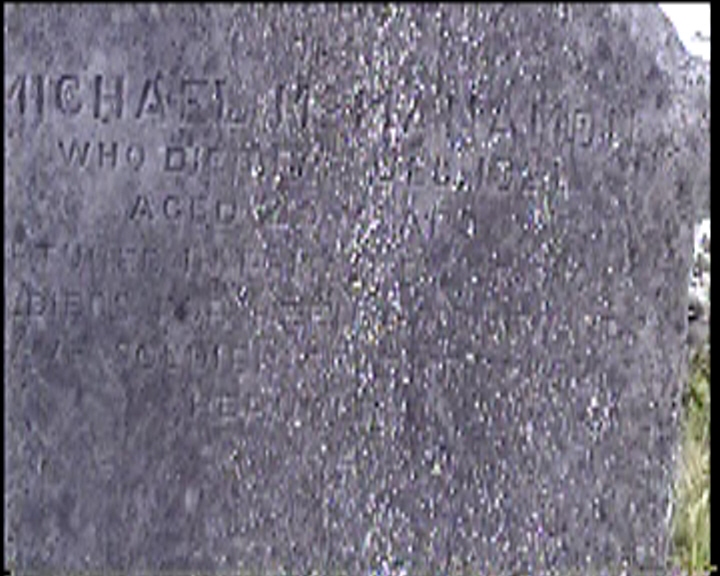 And her parents MICHAEL MCMANAMON died July 3, 1945 aged 81 years. And his wife MARY died June 10, 1955 aged 82 years. Erected by PATRICK MCMANAMON Newfield. 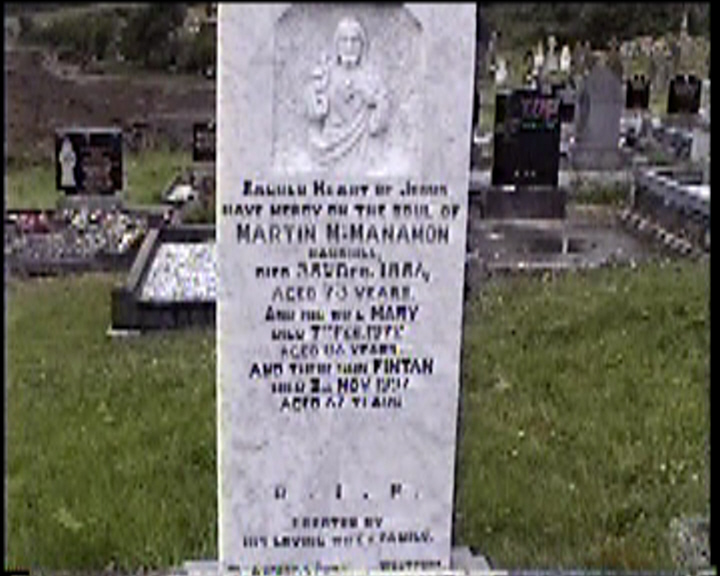 Sacred Heart of Jesus have mercy on the soul of MARTIN MCMANAMON Sandhill, died 25th Dec. 1956, aged 73 years. And his wife MARY died 7th Feb. 1972 aged 86 years. 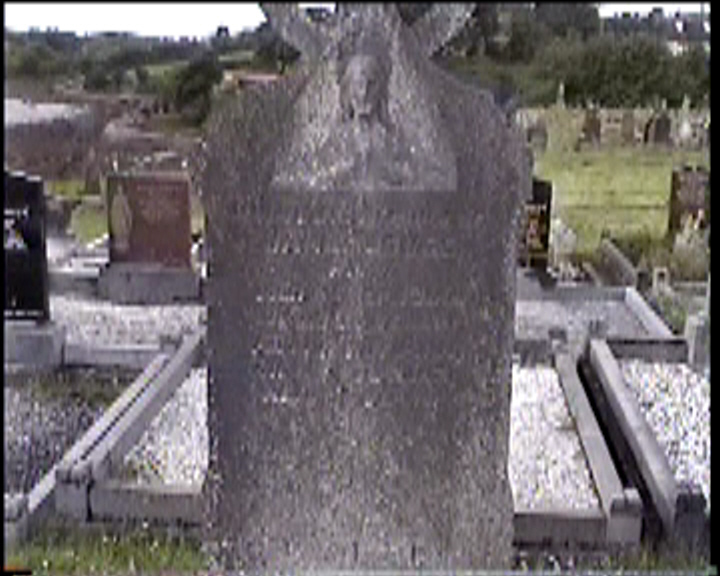 And their son FINTAN died 2nd Nov. 1997 aged 67 years. 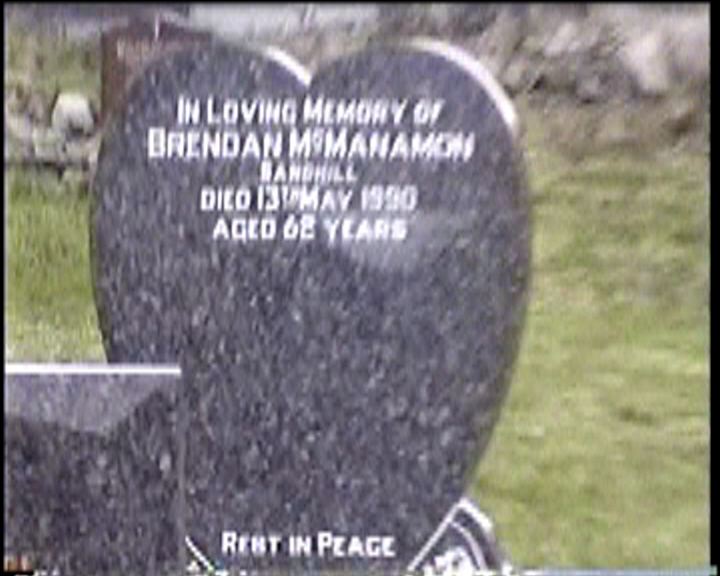 In loving memory of BRENDAN MCMANAMON Sandhill died 13th May 1990 aged 62 years. In loving memory of PATRICK MCNEA Roskeen died 10th Aug. 1986 aged 72 years. 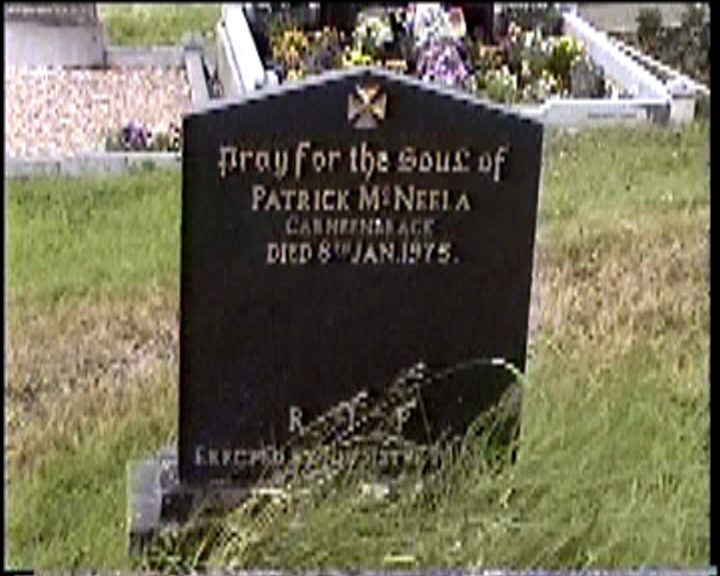 Pray for the soul of PATRICK MCNEELA Carheenbrack died 8th Jan. 1975. 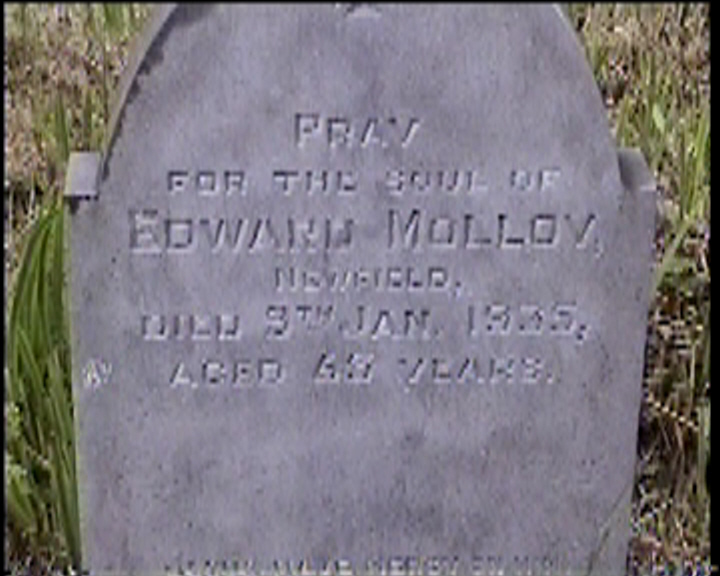 Pray for the soul of EDWARD MOLLOY Newfield died 9th Jan. 1935, aged 65 years. 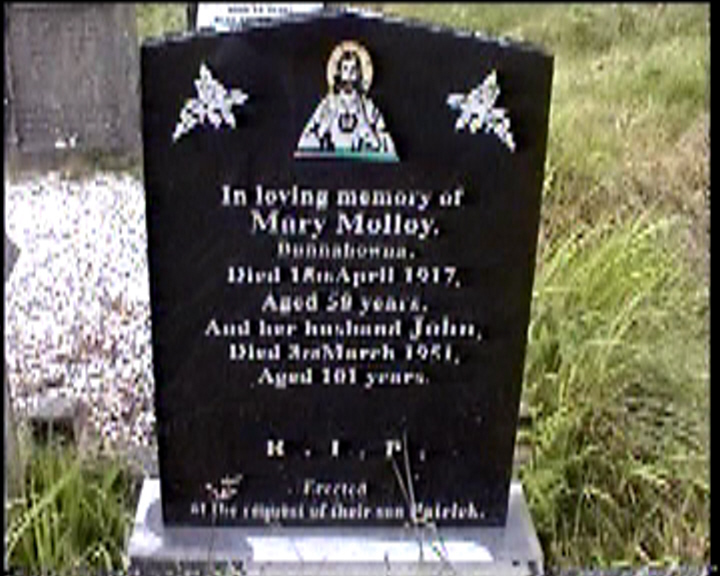 In loving memory of MARY MOLLOY Bunnahowna died 15th April 1917 aged 58 years. 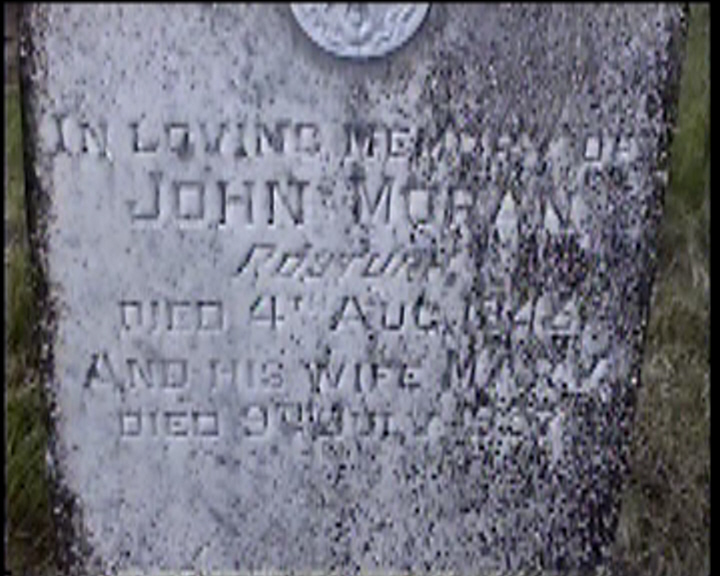 And her husband JOHN, died 3rd March 1951, aged 101 years. Erected at the request of their son PATRICK. 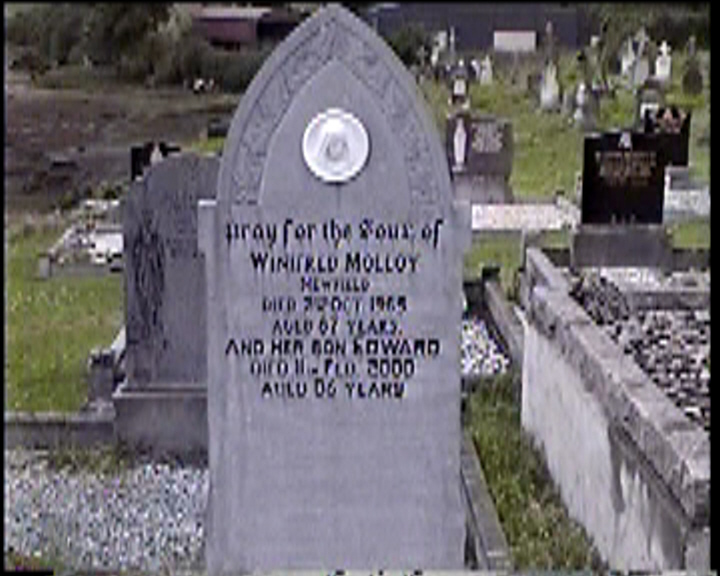 Pray for the soul of WINIFRED MOLLOY Newfield died 2nd Oct. 1965 aged 87 years. 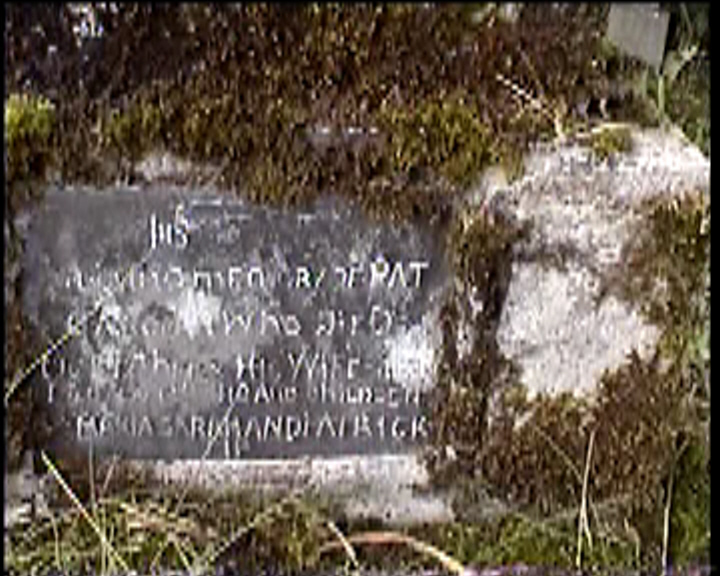 And her son EDWARD died 11th Feb. 2000 aged 86 years. 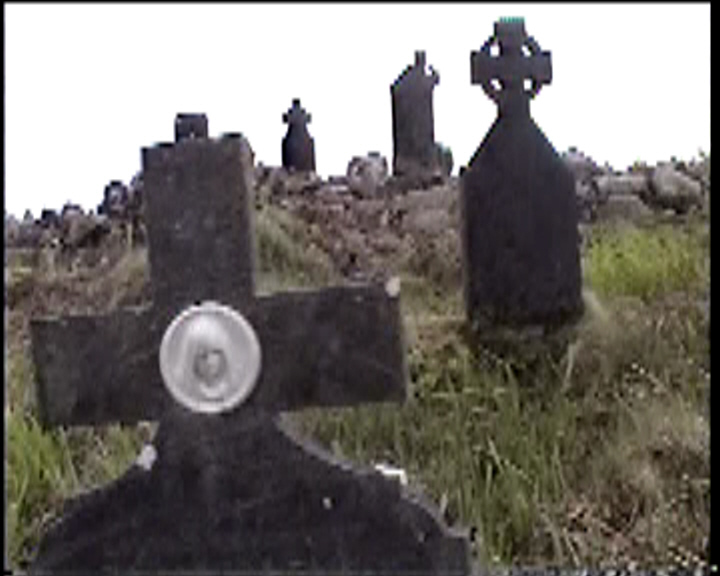 In memory of JOHN and ELLEN MORAN Knockbrega ? 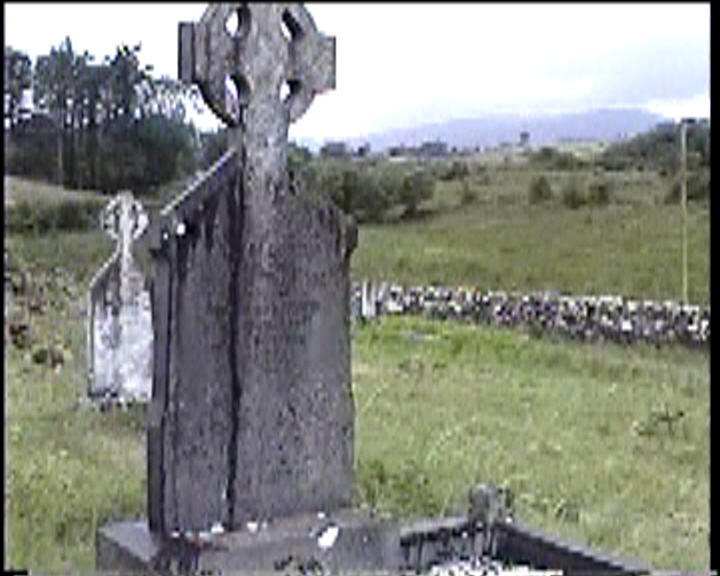 Pray for the soul of TOMMIE MORAN Roskeen died March 1920. 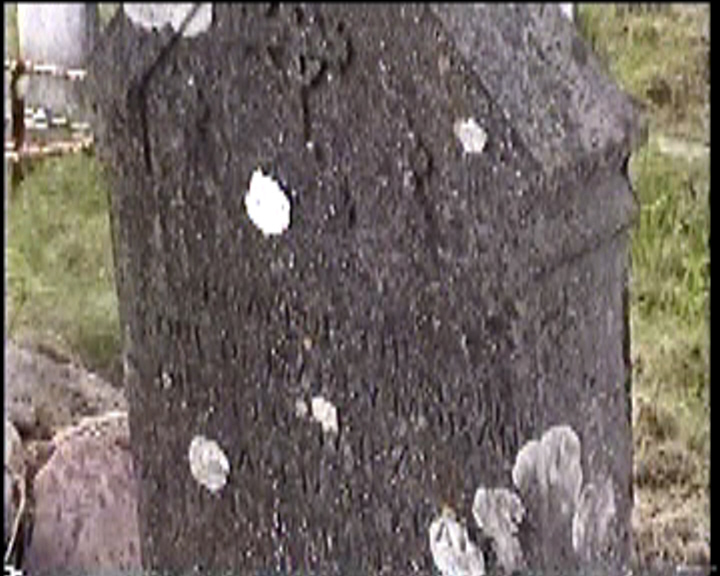 Erected by his cousin BRIDGET MORAN Roskeen. 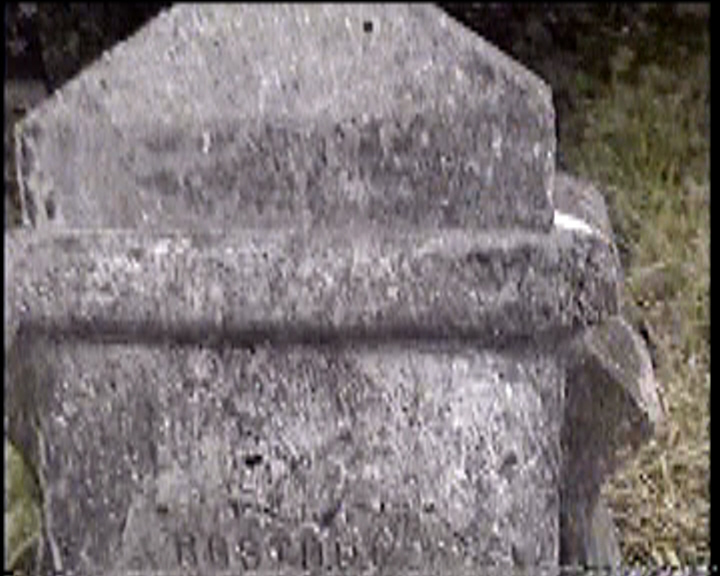 In loving memory of ANNIE MORAN Roskeen, died Oct. 21, 1959 aged 71 years. And her husband THOMAS died Jan. 11, 1955 aged 76 years. Also their children CELIA, died Oct. 6, 1945 aged 22 years. 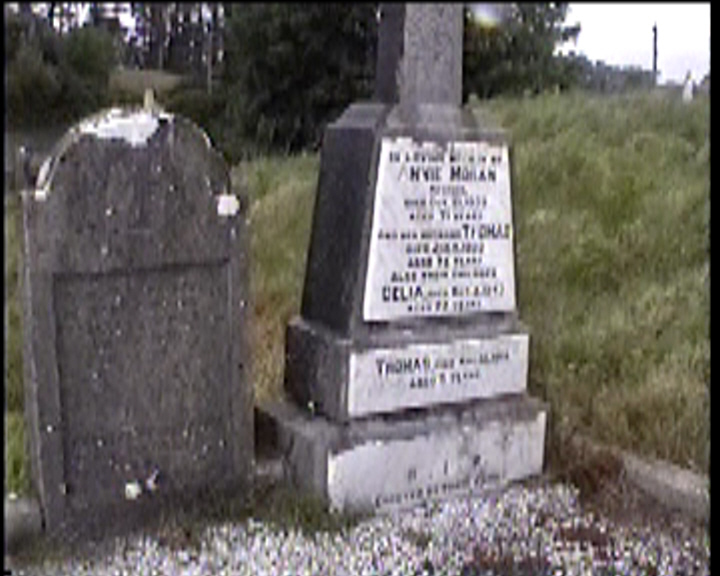 THOMAS died Aug 16, 1916 aged 5 years. 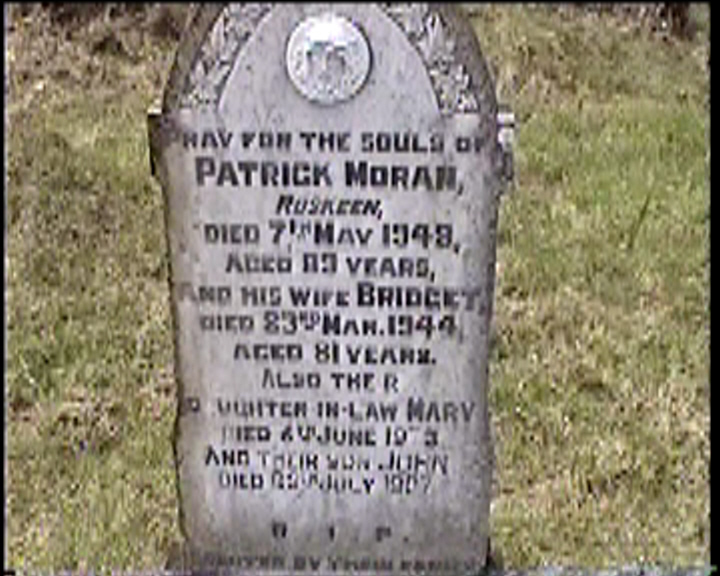 Pray for the souls of PATRICK MORAN Roskeen died 7th May 1949, aged 89 years, and his wife BRIDGET died 23rd Mar. 1944, aged 81 years. 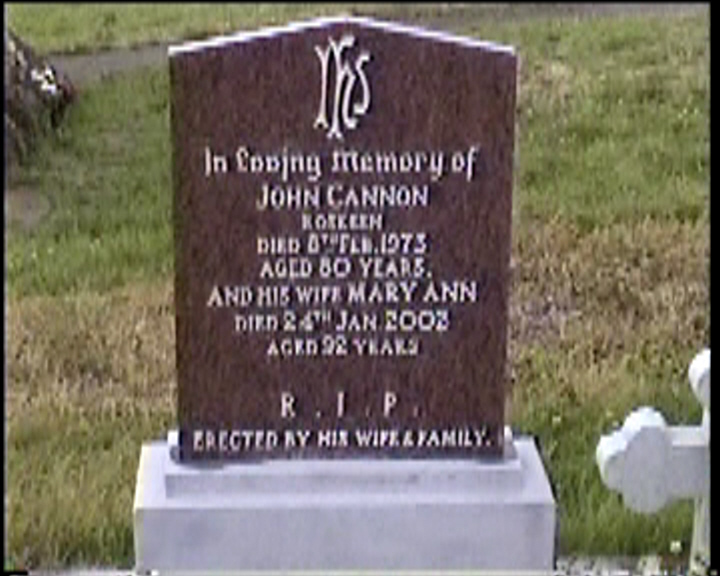 Also their daughter-in-law MARY died 6th June 1973 and their son JOHN died 25th July 1987. 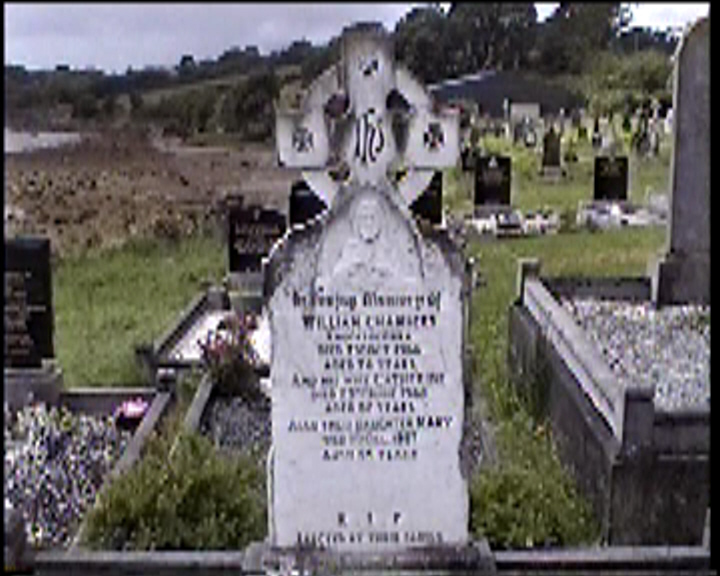 In loving memory of MARTIN MORAN Roskeen, died 29th Nov. 1942, and his daughter KATHLEEN died 1st July 1929. 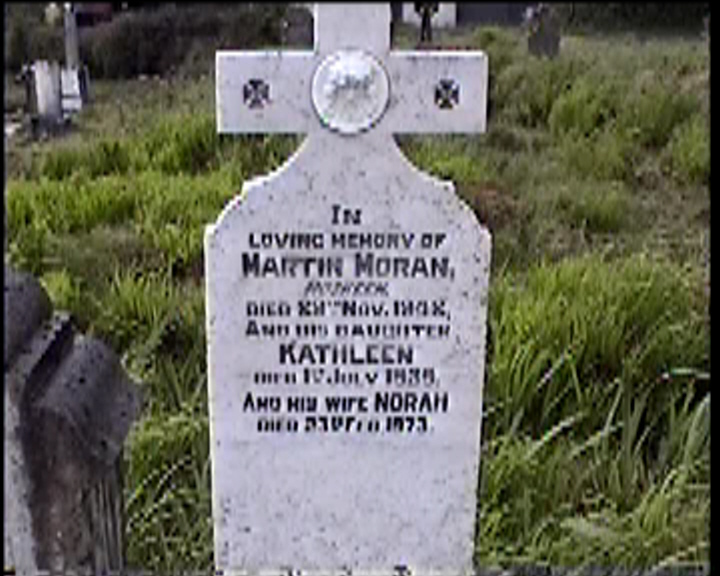 And his wife NORAH died 23rd Feb. 1973. 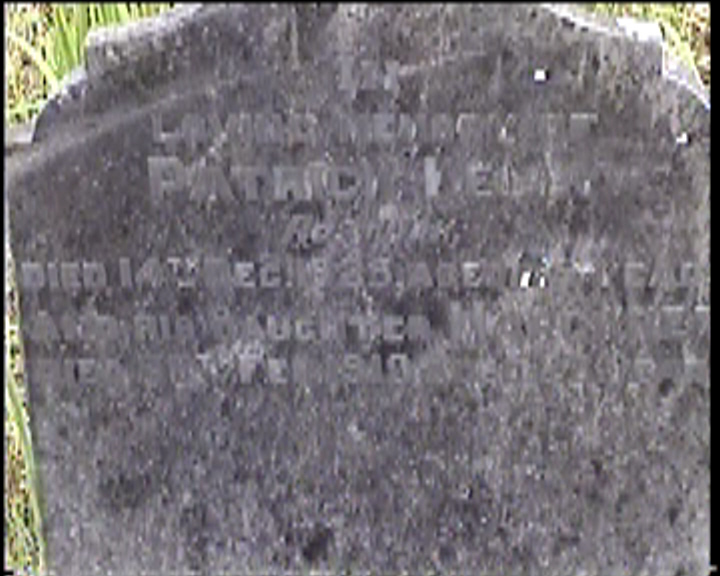 Lord have mercy on the soul of PATRICK MORAN died Jan 7th 1901 aged 22 years also his sister MARGARET died Dec. 20th 1900 aged 25 years also MRS. HENAGHAN died 15 Jan 1901 aged 31. 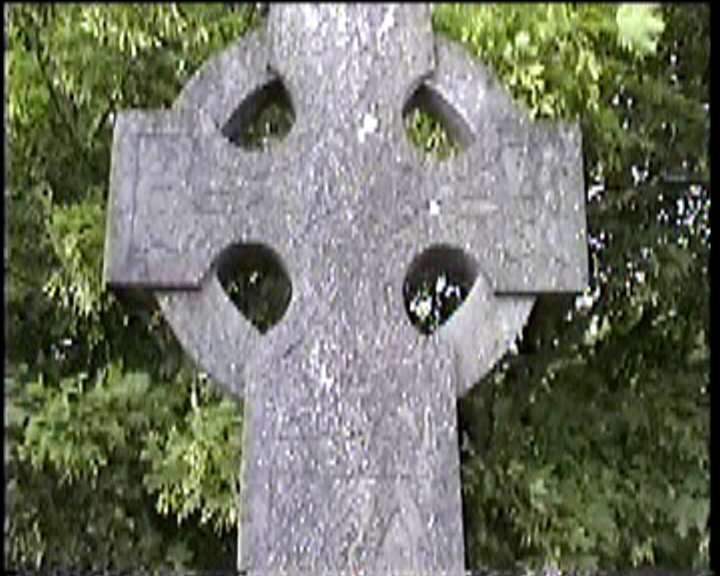 Erected by their father JOHN MORAN. 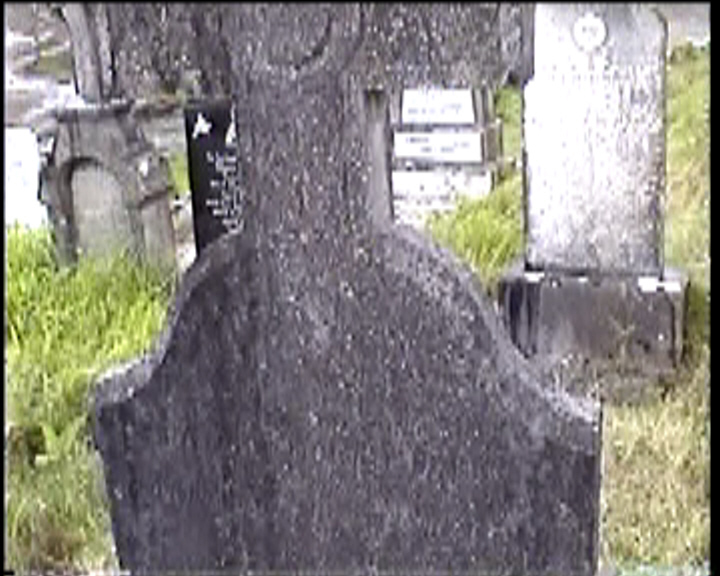 O Lord have mercy on the soul of ANNE MORAN died 18th Apr 1898 aged 52 years. Erected by her husband DOMINICK MORAN Doughill. 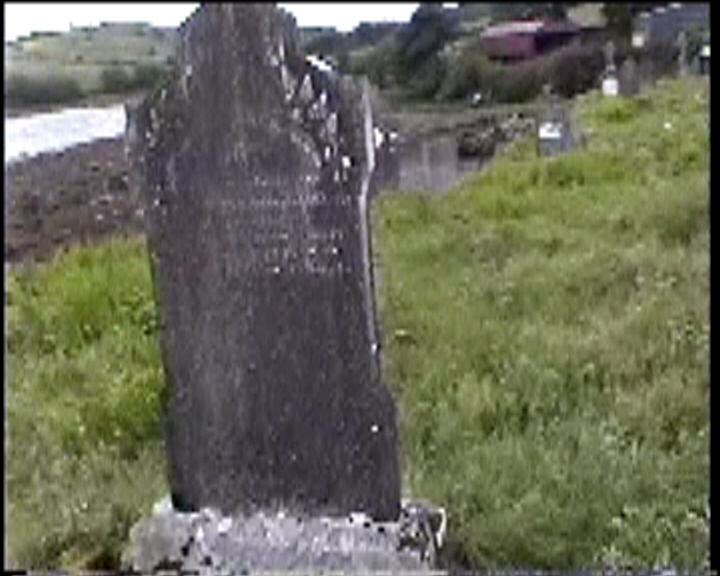 In loving memory of HUGH MORAN Roigh died 1882 and his wife NANNIE died 1895. Eected by their grandson THOMAS C. MORAN USA. 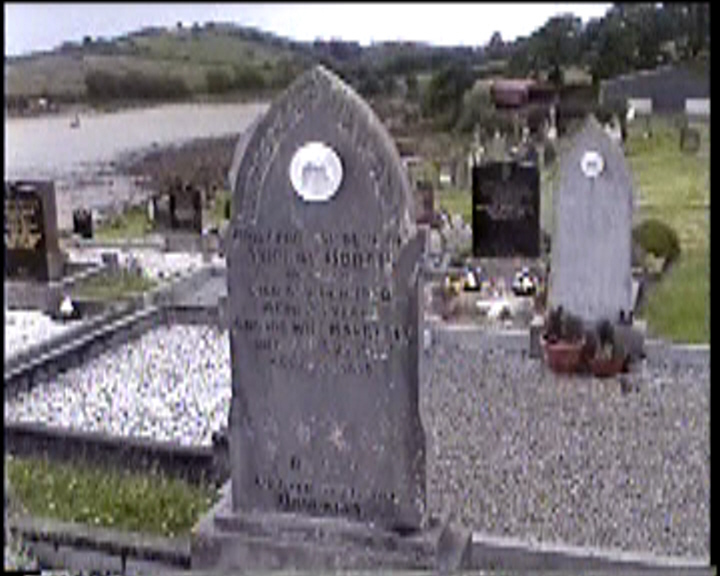 Pray for the souls of HUGH MORAN Roigh ?? BRIDGET died ? 1942 aged ? 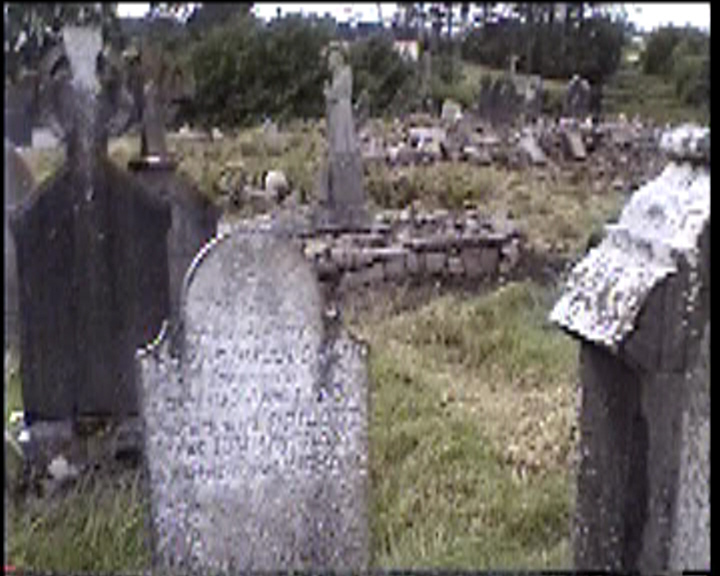 Lord have mercy on the souls of PATRICK MORAN Sandhill died 3rd December 1930 aged 88 years and his wife BRIDGET died 7th March 1938 aged 77 years and their infant son THOMAS died ? Pray for the souls of ? TIM MORAN (could be MARY THO.) 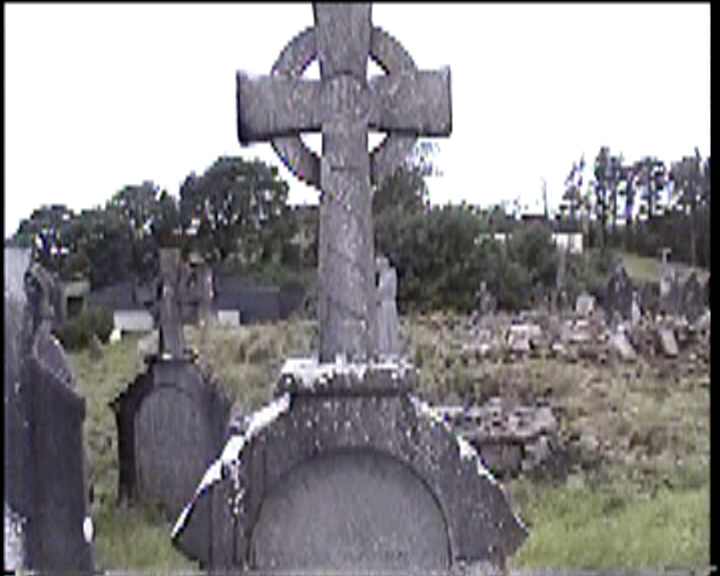 Mulrany died MARCH the 2nd 1920 aged 20 years and his wife MARY who died Sept. the 26th 1927 aged 32 and their infant son THOMAS died 19? 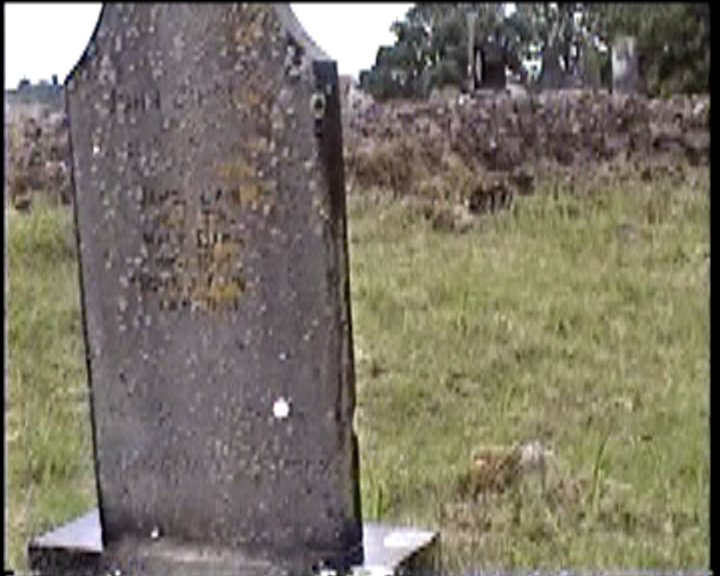 In loving memory of THOMAS MORAN Mulrany died 25th March 1903 age 55 years also his wife ELLEN died 17 June 1898 age 49 years & their sons JOE died 24 April 1898 age 27 years, PATRICK died 28 Feb 1908 age 27 years, MICHAEL died 31 Dec. 1910 age 36 years, JIM died 13 Feb 1925 age 34 years. Lord have mercy on their souls. 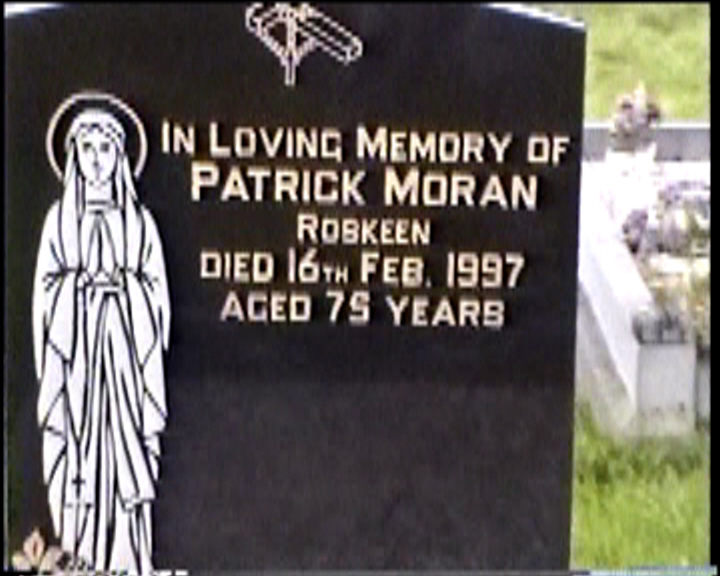 In loving memory of PATRICK MORAN Roskeen died 16th Feb 1997 aged 75 years. 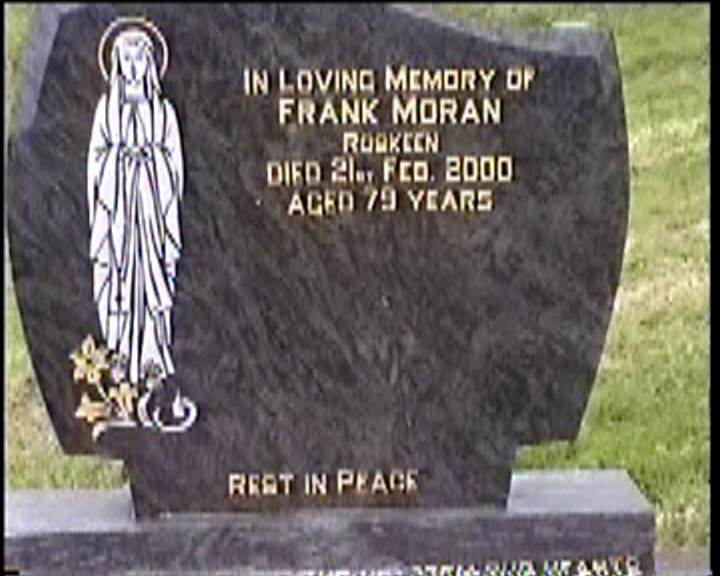 In loving memory of FRANK MORAN Roskeen died 21st Feb. 2000 aged 79 years. 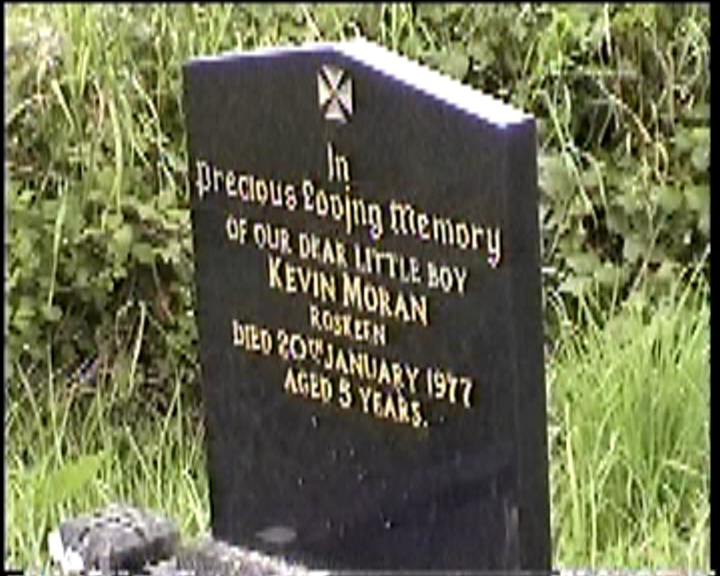 In precious loving memory of our dear little boy KEVIN MORAN Roskeen died 20th January 1977 aged 5 years. 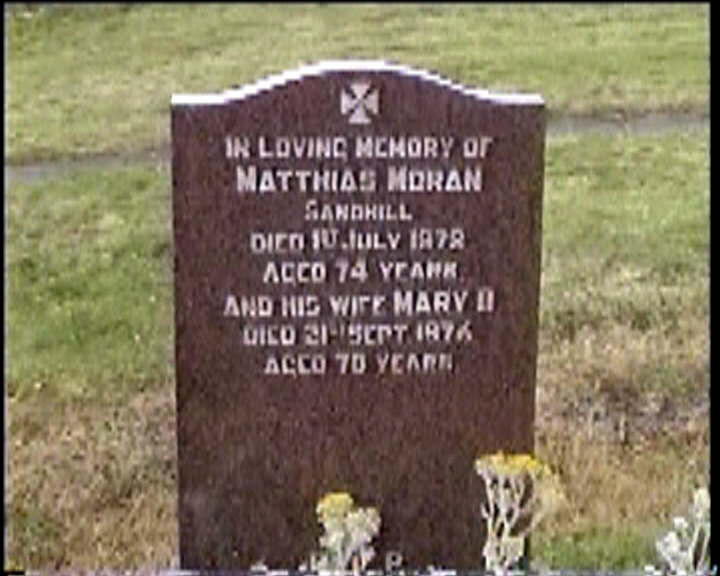 In loving memory of MATTHIAS MORAN Sandhill died 1st July 1972 aged 74 years. 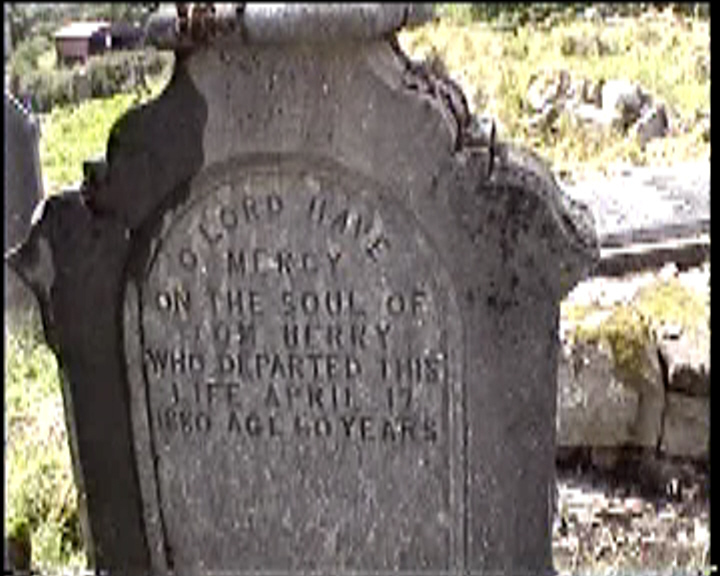 And his wife MARY B. died 21st Sept. 1976 aged 70 years. 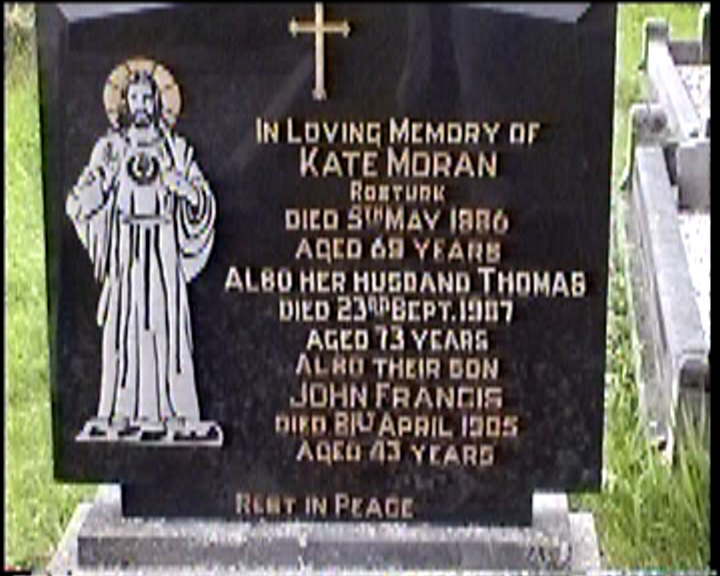 In loving memory of KATE MORAN Rosturk died 5th May 1986 aged 69 years. 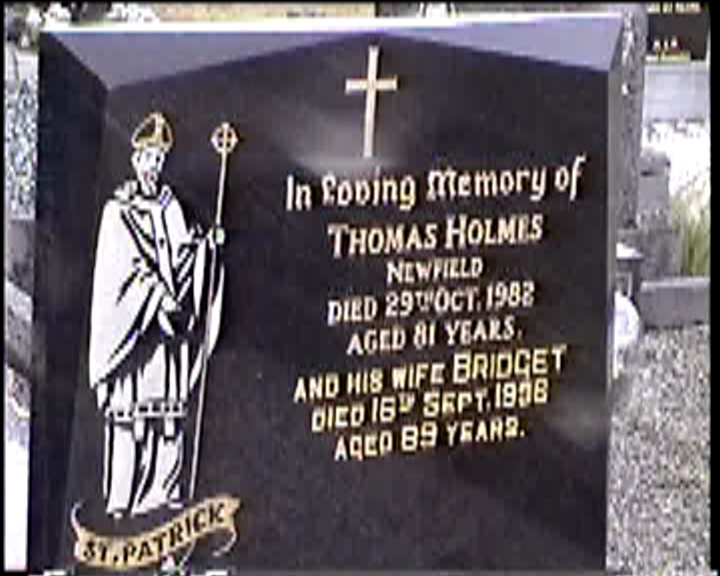 Also her husband THOMAS died 23rd Sept. 1987 also their son JOHN FRANCIS died 21st April 1985 aged 43 years. 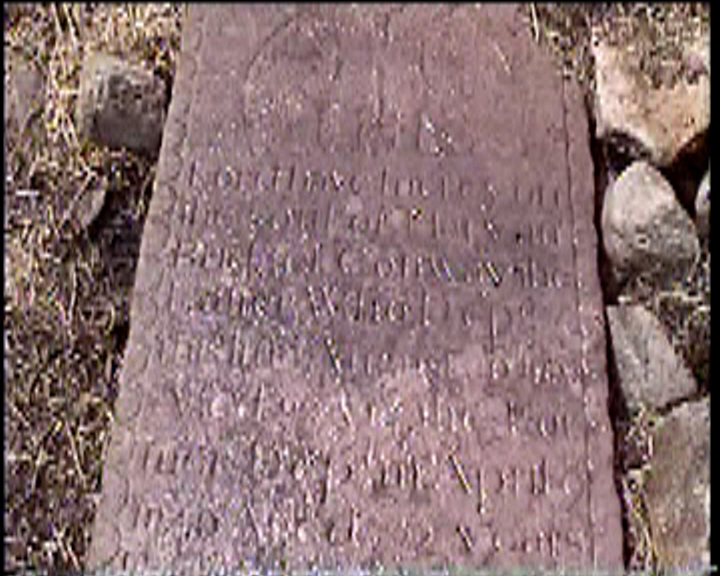 In loving memory of MICHAEL MORAN Sandhill 1875-1944, and his wife BRIDGET 1890-1964. 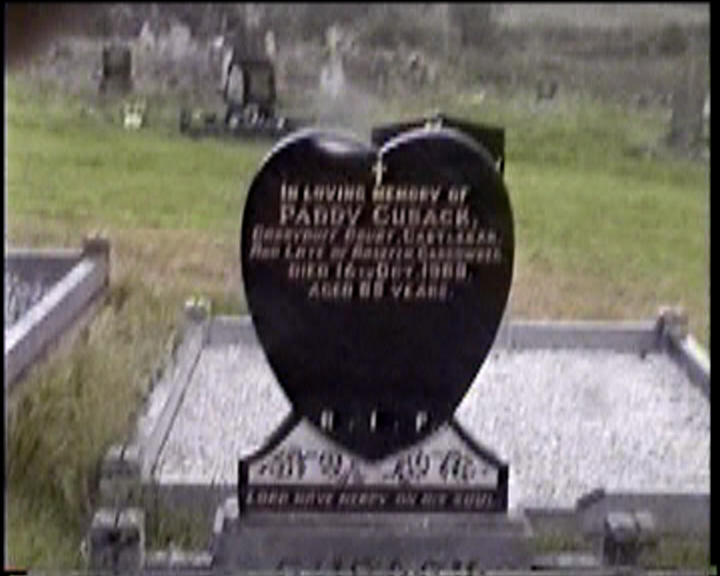 And their son PACKIE died 9th Dec. 1998 aged 77 years. 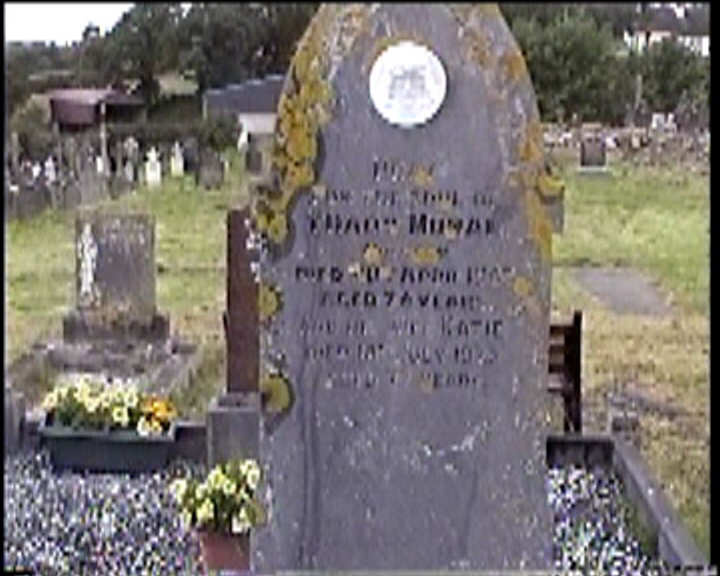 Pray for the soul of THADY MORAN Roskeen died 20th April 1963 aged 76 years. 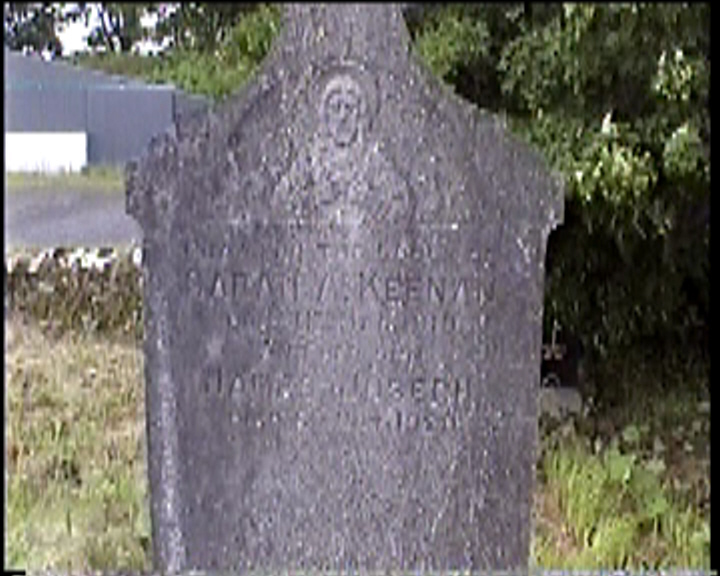 And his wife KATIE died 18th July 1973 aged 77 years. 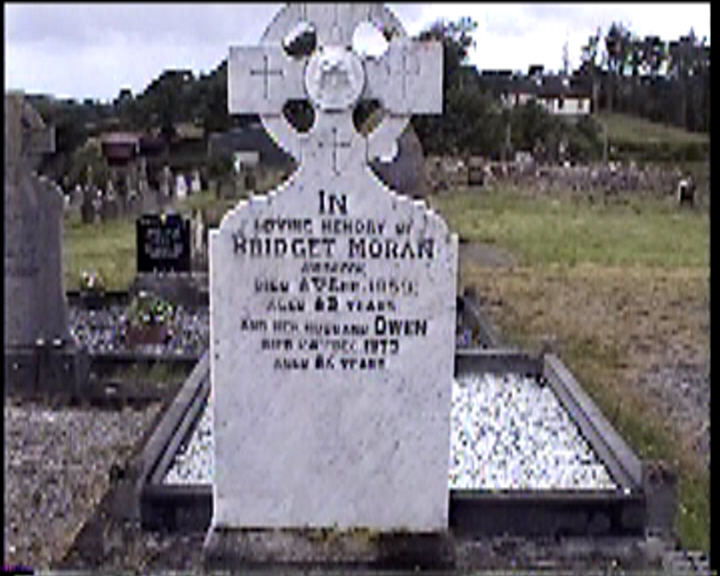 In loving memory of BRIDGET MORAN Roskeen died 6th Sep. 1959, aged 69 years. And her husband OWEN died 24th Dec. 1973 aged 86 years. 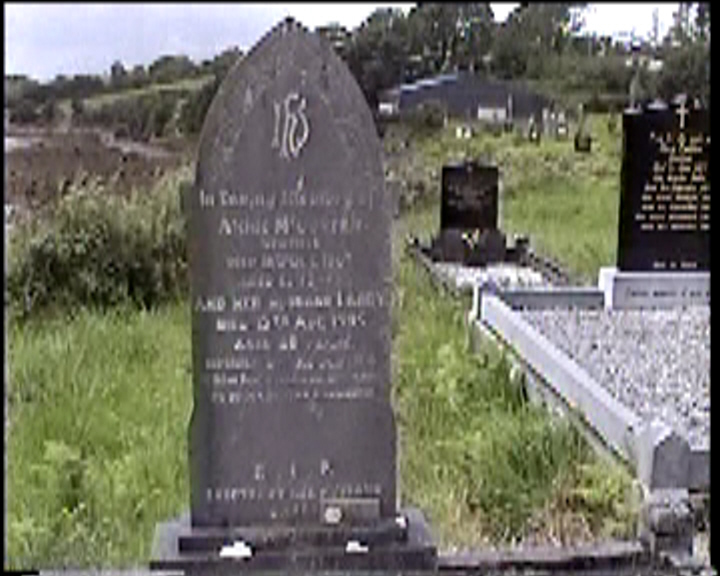 Pray for the soul of THOMAS MORAN Newport died 6th April 1960 aged 63 years. 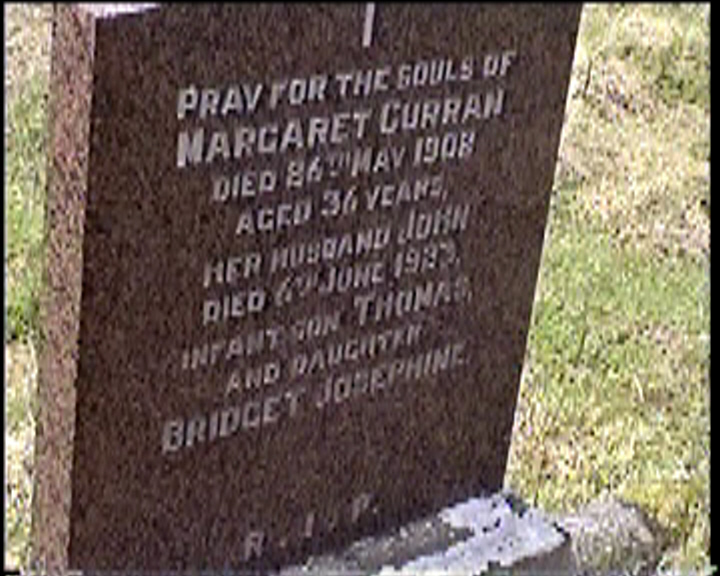 And his wife MARGARET died 6th Aug. 1978 aged 84 years. 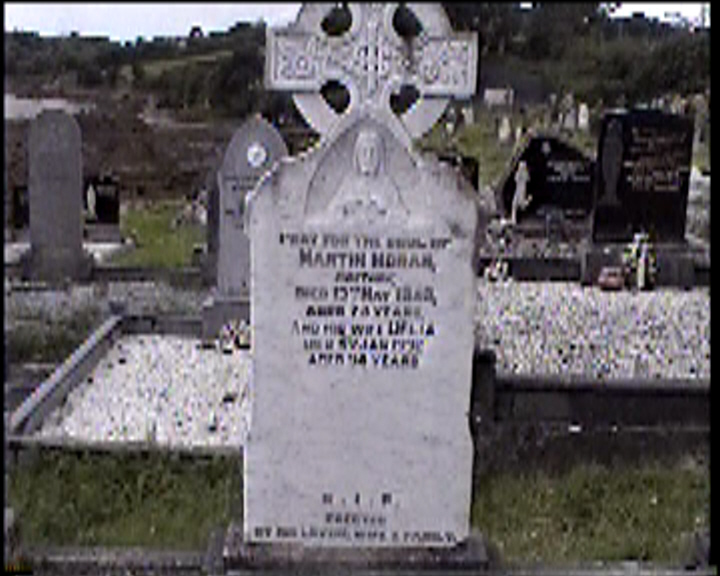 Pray for the soul of MARTIN MORAN, Rosturk, died 13th May 1962, aged 73 years, and his wife DELIA died 5th Jan. 1992 aged 94 years. 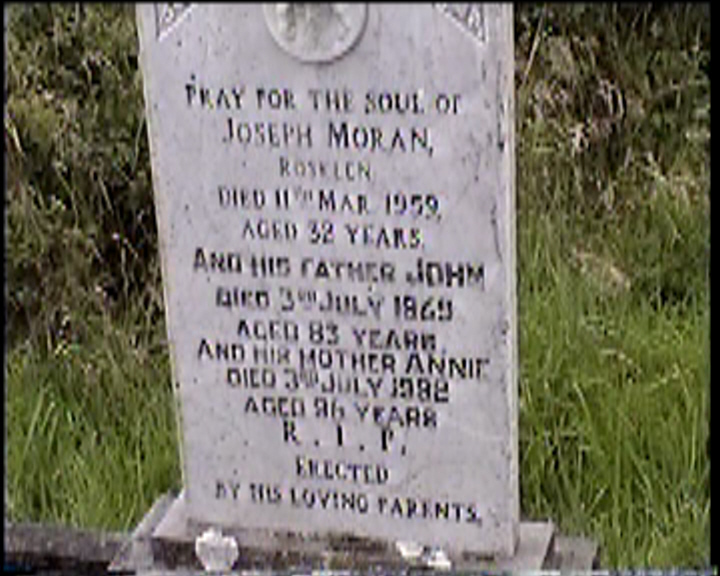 Pray for the soul of JOSEPH MORAN Roskeen died 11th Mar. 1959 aged 32 years. 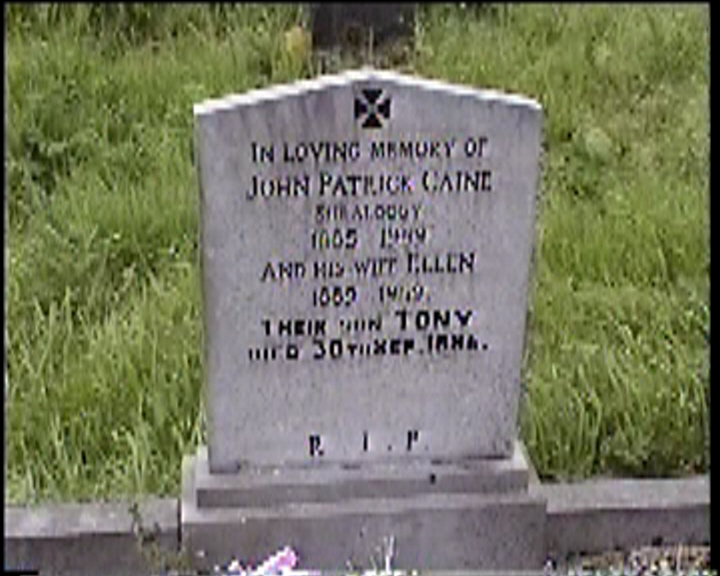 And his father JOHN died 3rd July 1969 aged 83 years. 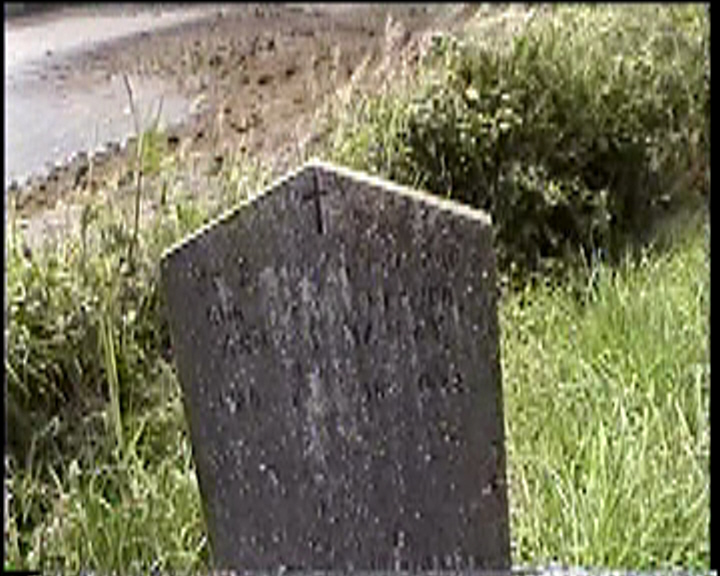 And his mother ANNIE died 3rd July 1992 aged 96 years. 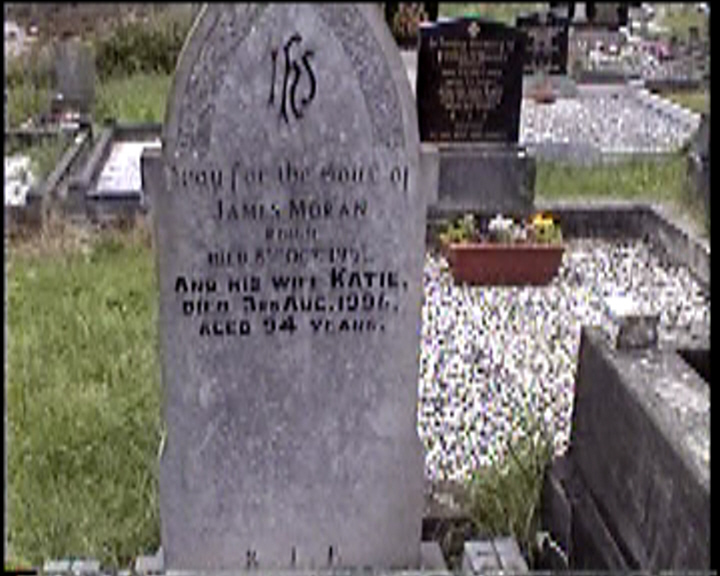 Pray for the soul of JAMES MORAN Roigh died 8th Oct. 1957. And his wife KATIE, died 3rd Aug. 1996, aged 94 years. 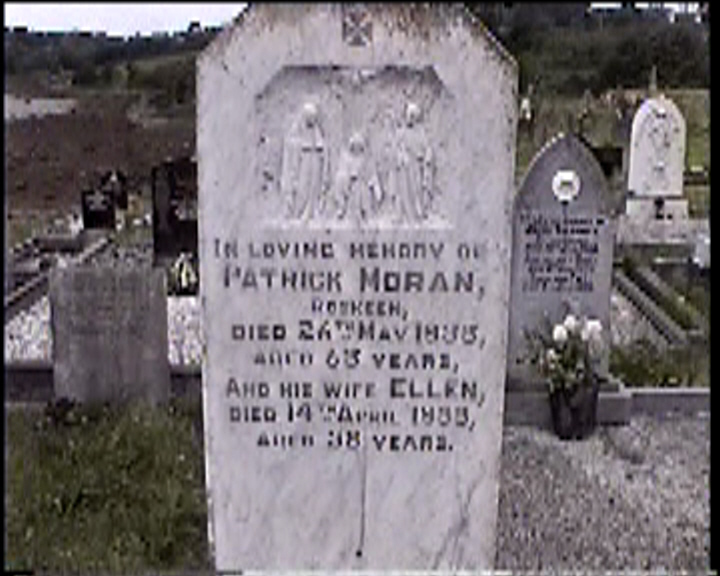 In loving memory of PATRICK MORAN Roskeen, died 26th May 1955, aged 65 years, and his wife ELLEN, died 14th April 1955, aged 58 years. 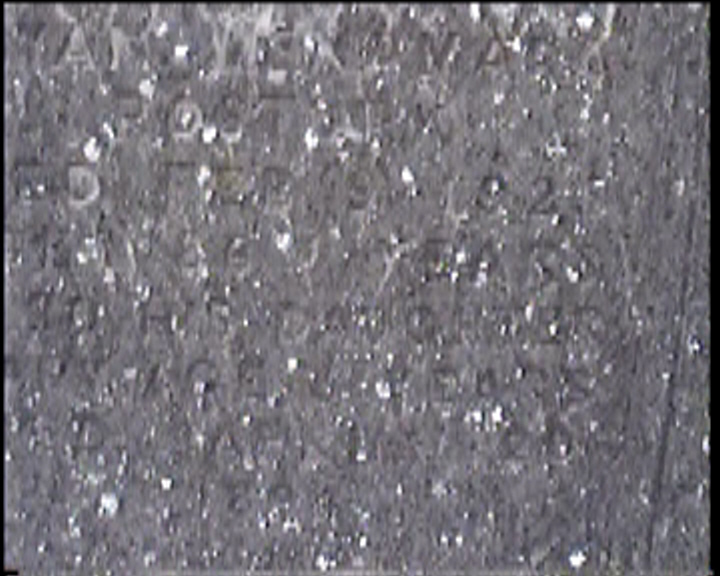 In loving memory of of Mrs. ANNIE MORAN Roskeen who died Dec. 8th 1952 aged 35 years. 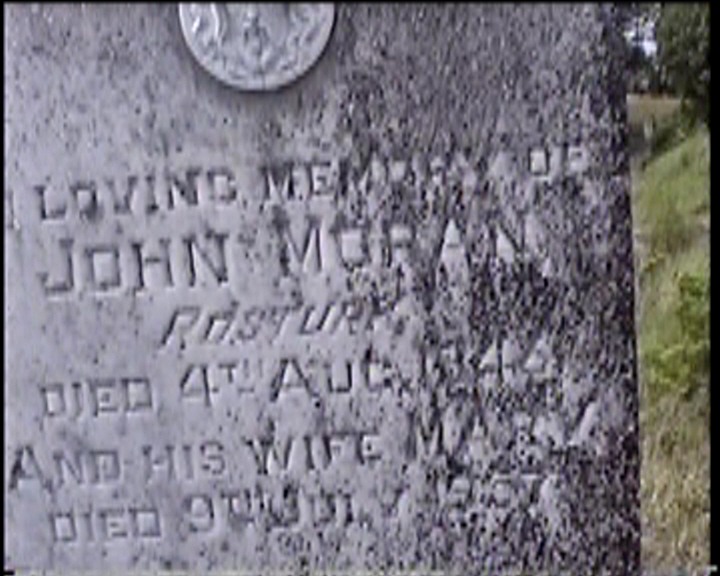 Also her husband JOHN MORAN who died Jan. 22nd 1956 aged 75 years. 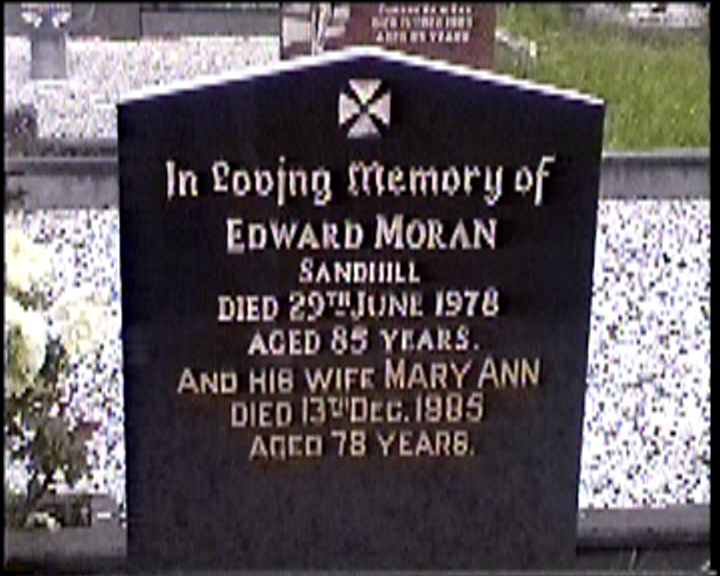 In loving memory of EDWARD MORAN Sandhill died 29th June 1978 aged 85 years. 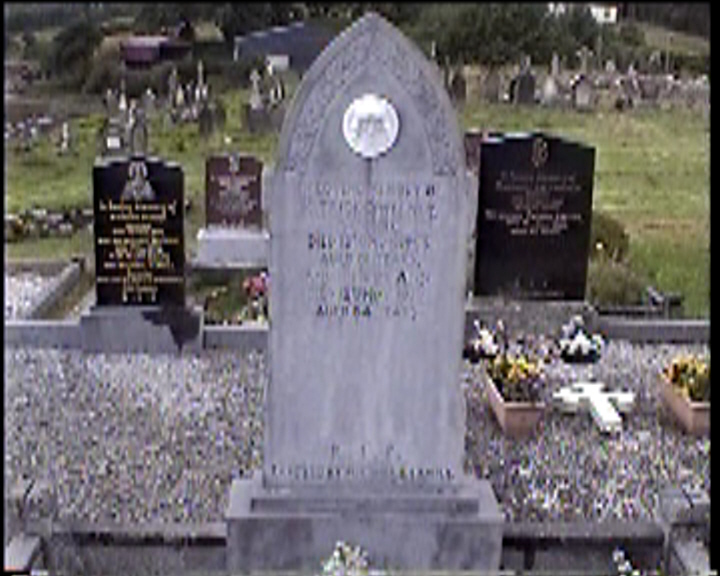 And his wife MARY ANN died 13th Dec. 1985 aged 78 years. 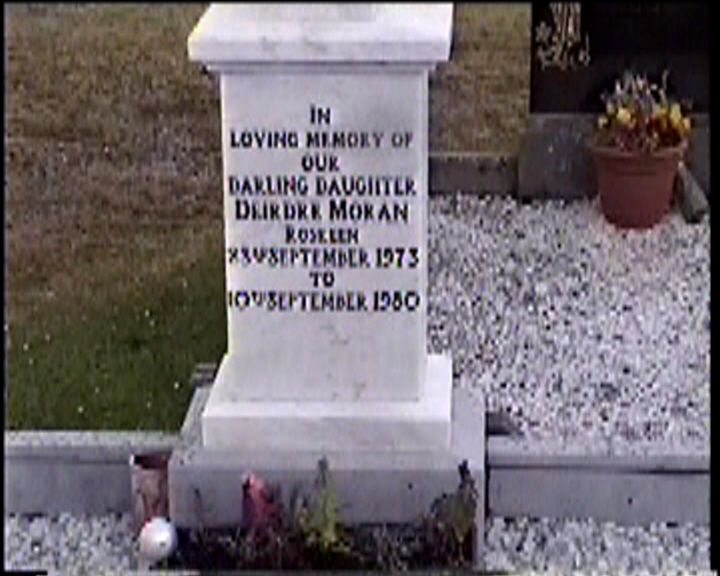 In loving memory of our darling daughter DEIRDRE MORAN Roskeen 23rd September 1973 to 10th September 1980. 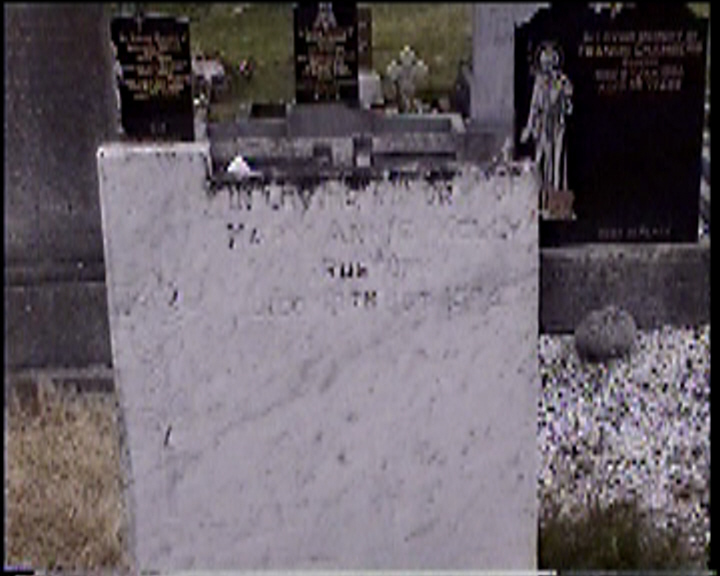 In loving memory of JOHN MORAN (SONNIE) Roskeen died 28th April 1987 aged 64 years. In memory of JAMES & ANN MULGREW, son THOMAS, and daughter ROSE MASTERSON. 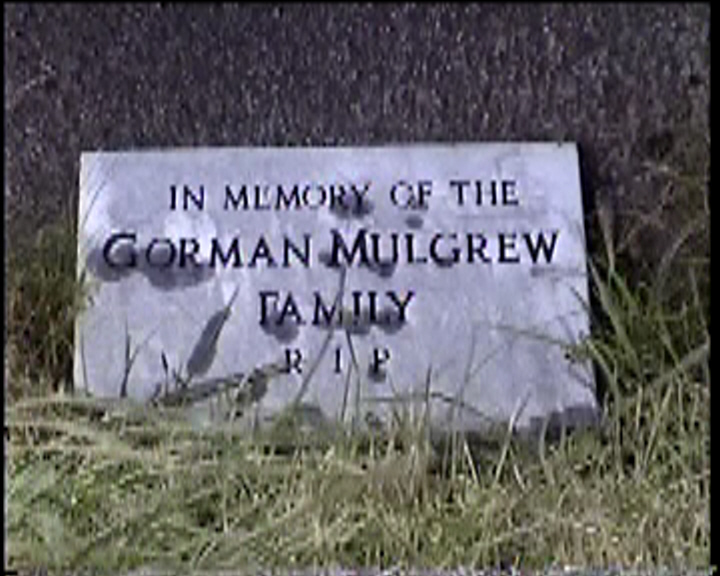 In memory of the GORMAN MULGREW family. 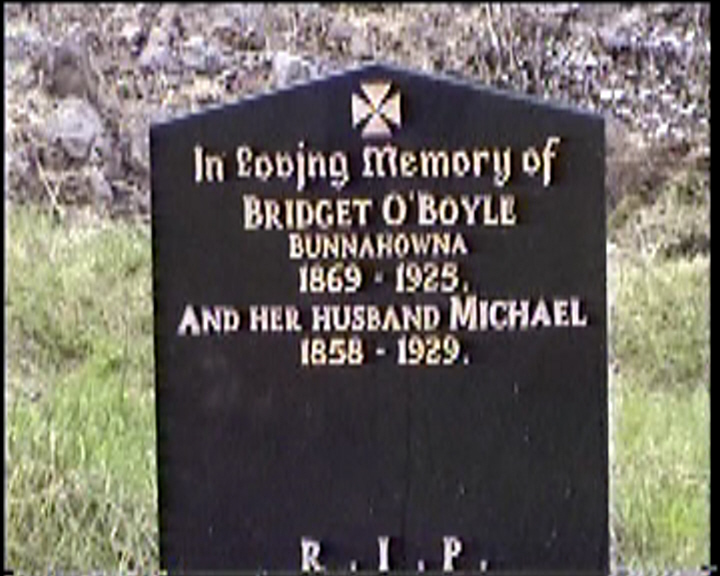 In loving memory of BRIDGET O’BOYLE Bunnahowna 1869-1925 and her husband MICHAEL 1858-1929. 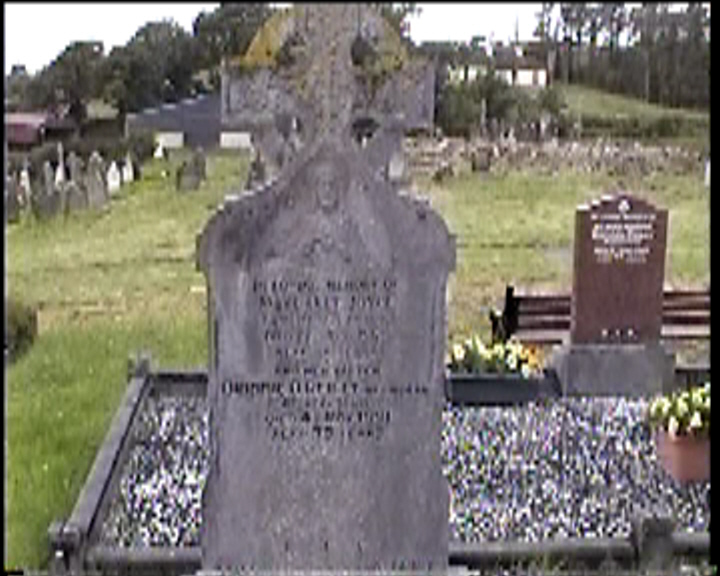 Pray for the soul of PATRICK O’DONNELL Sandhill who died March 1933 aged 88 years also his daughter ANNIE who died March 1914 aged 27 years and his wife BRIDGET died 23rd May 1941 aged 95 years. Erected by his son FRANCIS. 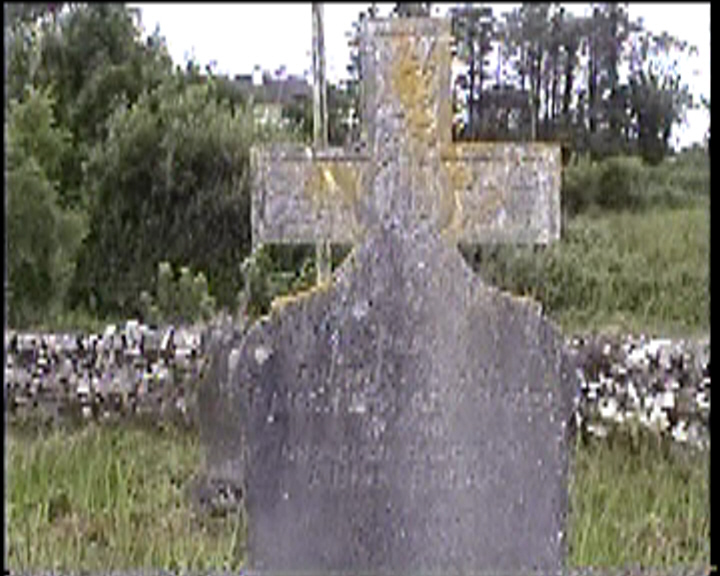 Pray for the souls of FRANCIS O’DONNELL who died 7th Dec. 1902 and his wife BRIDGET died 1890 and their son JAMES died 1880, JOHN died 1880, MARTIN died 20th July 1888 aged 30 years and his wife MARY who died 20th March 1909 aged 48 years, NEIL died 14th June 1912. Erected by ANNIE MORAN. 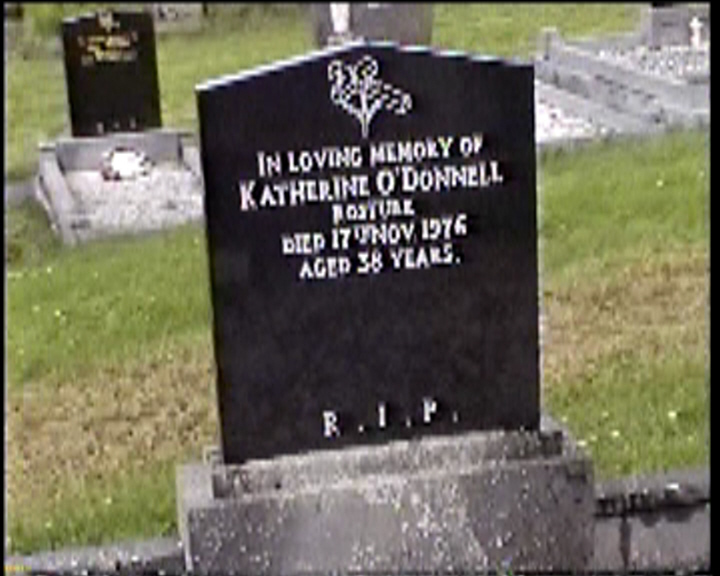 In loving memory of KATHERINE O’DONNELL Rosturk died 17th Nov. 1976 aged 38 years. 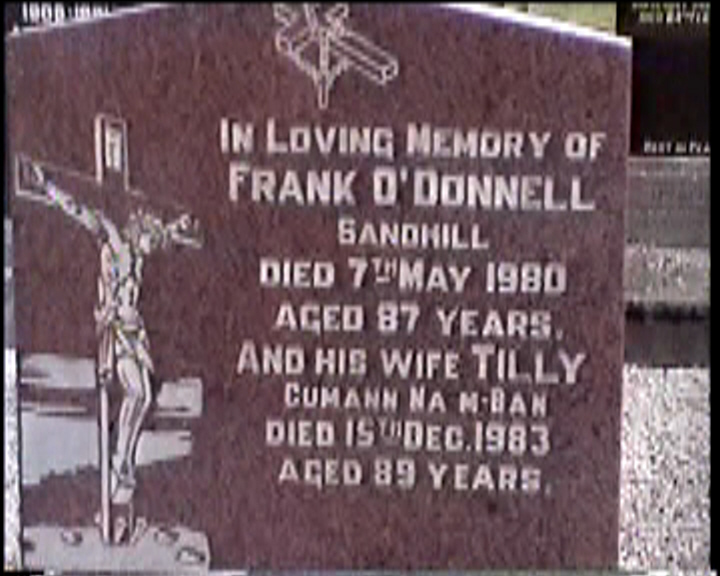 In loving memory of FRANK O’DONNELL Sandhill died 7th May 1980 aged 87 years. 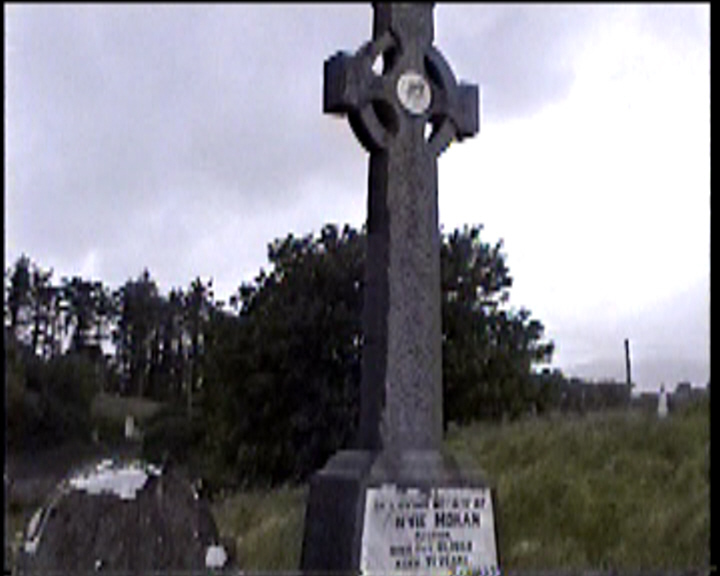 And his wife TILLY Cumann Na m-Ban died 15th Dec. 1983 aged 89 years. 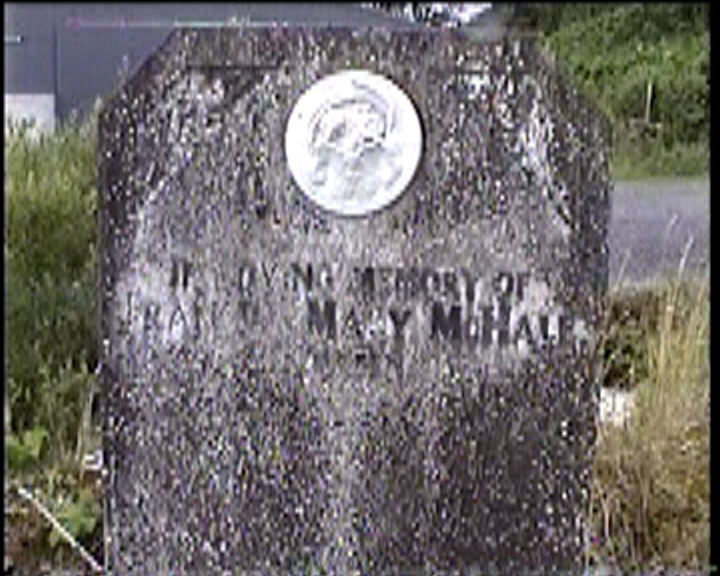 Pray for the souls of Mrs. MARTIN O’MALLEY Rosturk died the 8th August 1927 Aged 55 years and their daughters SARAH J. O’MALLEY died February 21st 1920 Aged 12 years, NORAH O’MALLEY died July 1898 aged 4 years. Erected by MARTIN O’MALLEY Rosturk. 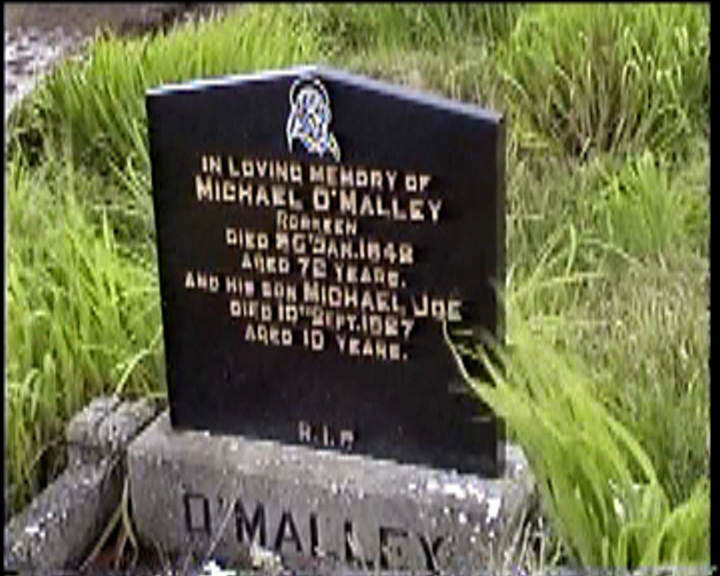 In loving memory of MICAHEL O’MALLEY Roskeen died 26th Jan. 1948 aged 72 years and his son MICHAEL JOE died 1oth Sept. 1927 aged 10 years. 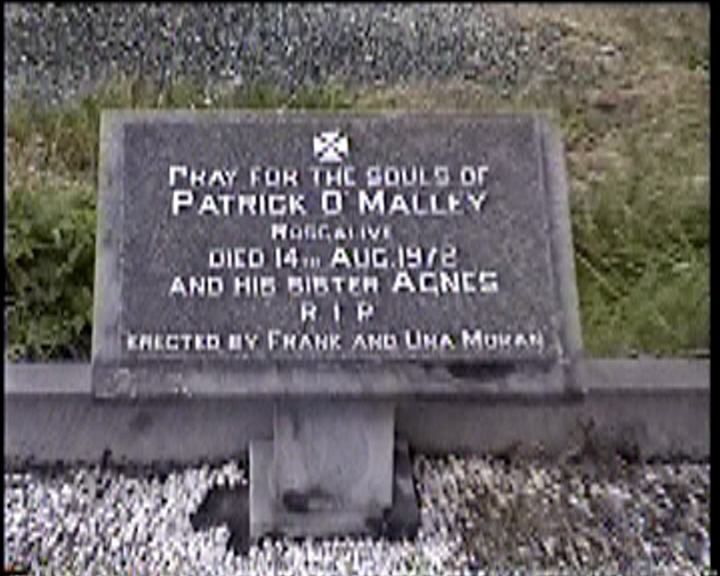 Pray for the souls of PATRICK O’MALLEY Rosgalive died 14th Aug. 1972 and his sister AGNES. Erected by FRANK and UNA MORAN. 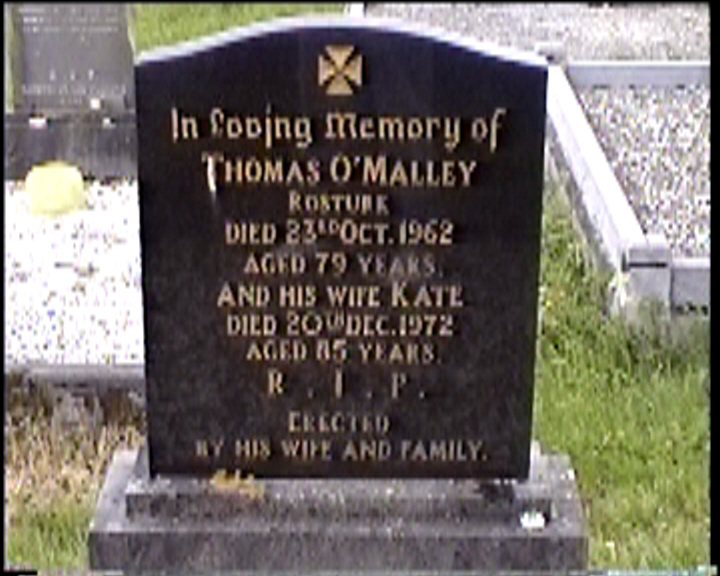 In loving memory of THOMAS O’MALLEY Rosturk died 23rd Oct. 1962 aged 79 years. 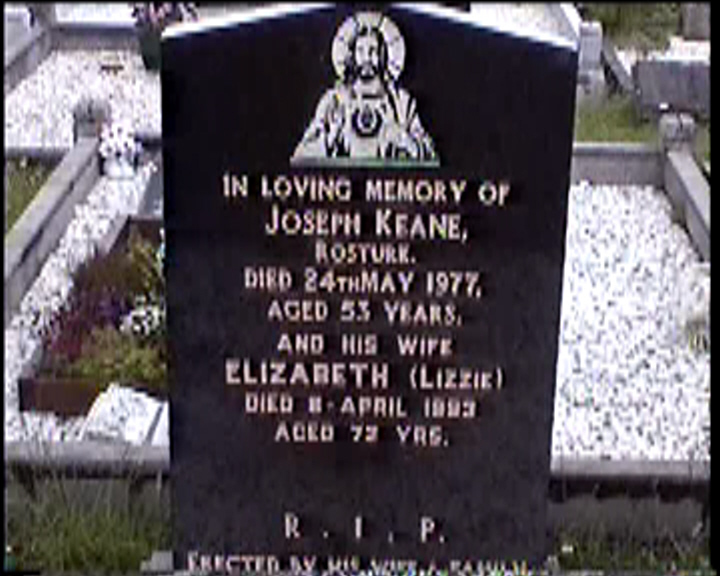 And his wife KATE died 20th Dec. 1972 aged 85 years. In loving memory of JOHN O’MALLEY Roskeen died 20th Mar. 1956 aged 76 years and his wife KATE died 11th Nov. 1960 aged 87 years. 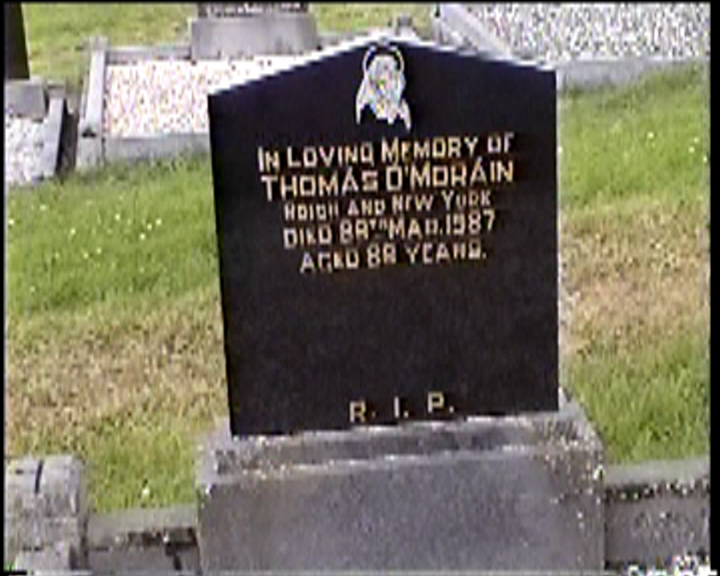 In loving memory of THOMAS O’MORAIN Roigh and New York died 29th Mar. 1987 aged 89 years. 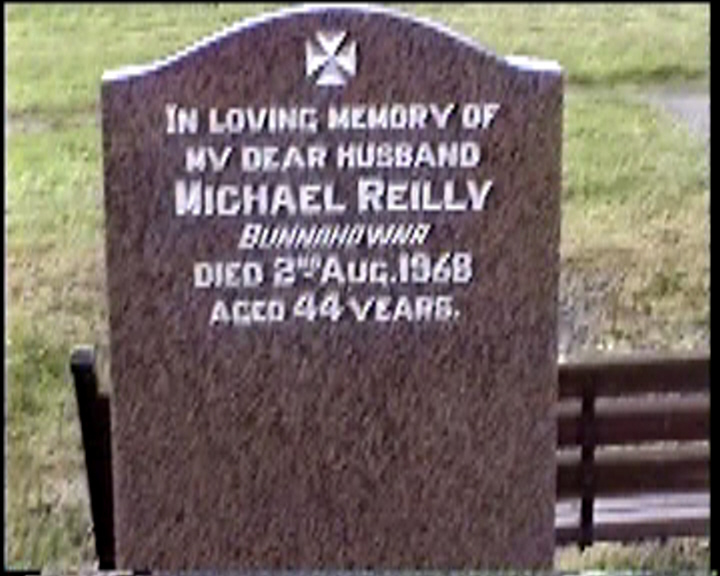 In loving memory of my dear husband MICHAEL REILLY Bunnahowna died 2nd Aug. 1968 aged 44 years. 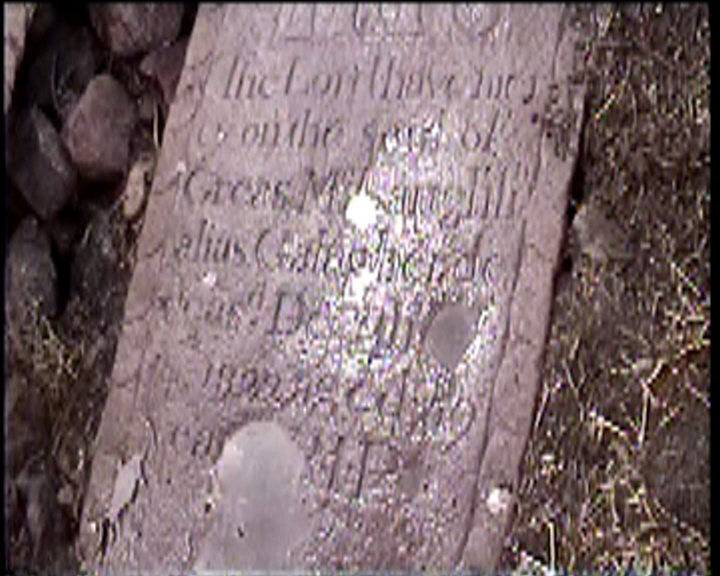 Erected by his wife DELIA and LOFTUS family. Pray for the souls of PATRICK & MARY RYDER Rosturk and their daughters ANNIE & SARAH. 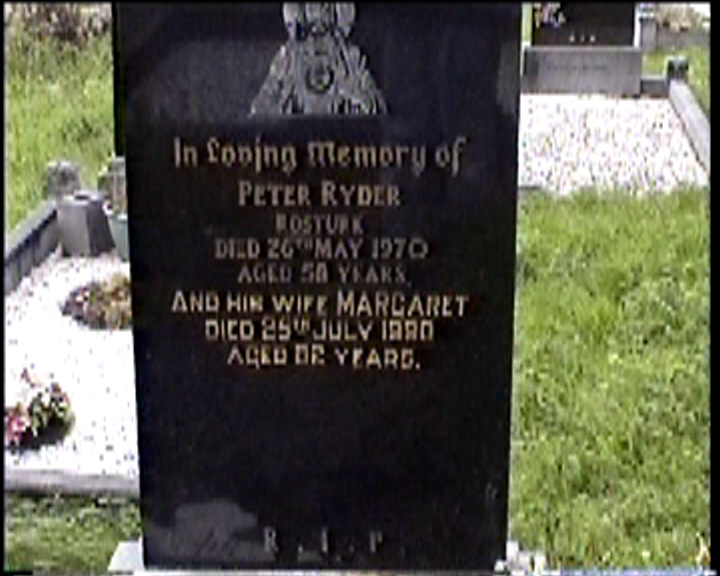 In loving memory of PETER RYDER Rosturk died 26th May 1970 aged 58 years. 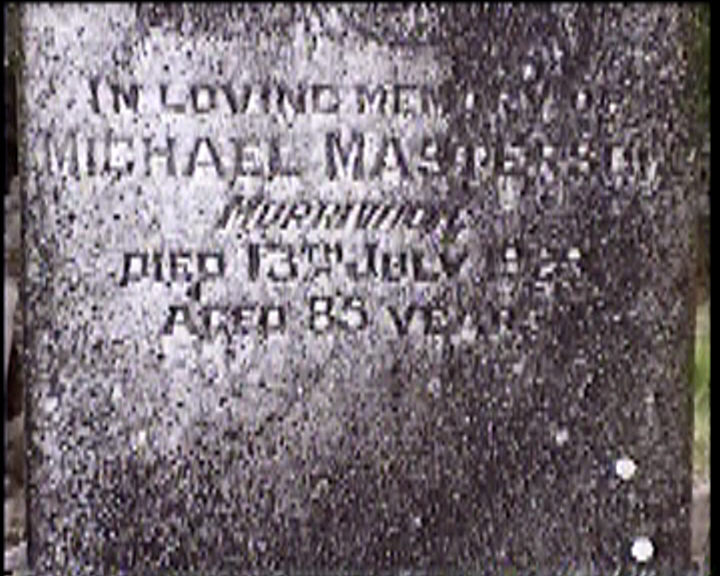 And his wife MARGARET died 25th July 1990 aged 82 years. In loving memory of PATRICK SHERIDAN Roskeen died 27th April 1936 and his wife BRIDGET died 15th Oct. 1944 also their son MICHAEL died 3rd Dec. 1946. Erected by their son THOMAS U.S.A. 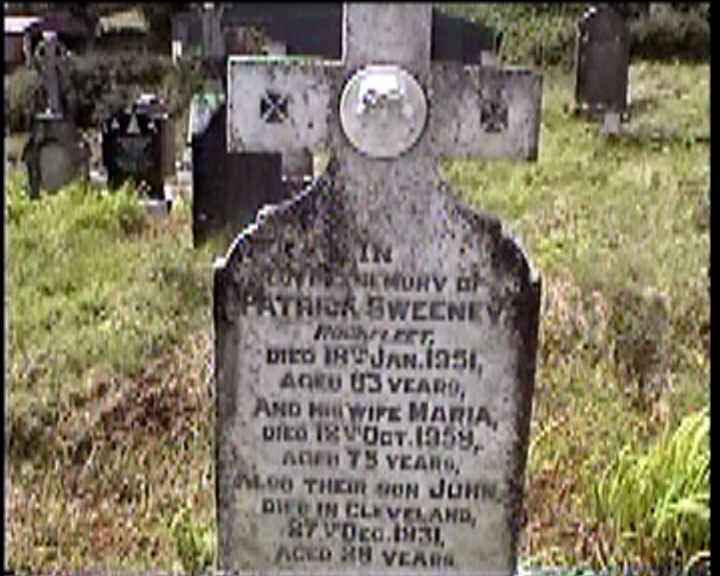 In loving memory of PATRICK SWEENEY Rockfleet, died 18th Jan. 1951, aged 83 years, and his wife MARIA, died 12th Oct. 1959, aged 75 years, also their son JOHN, died in Cleveland, 27th Dec. 1931 aged 29 years. 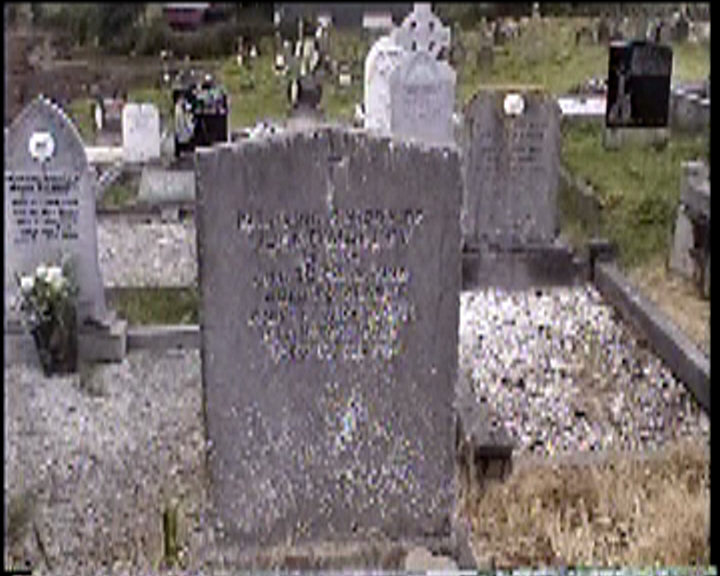 In loving memory of PATRICK SWEENEY, Sandhill, died 18th Nov. 1963 aged 81 years. And his wife ANN died 12th Nov. 1977 aged 84 years. 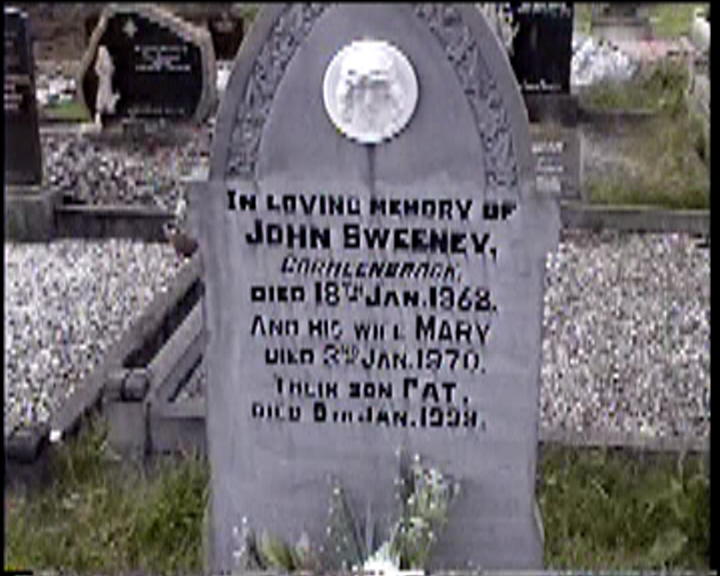 In loving memory of JOHN SWEENEY Carheenbrack, died 18th Jan. 1962. And his wife MARY died 2nd Jan. 1970. 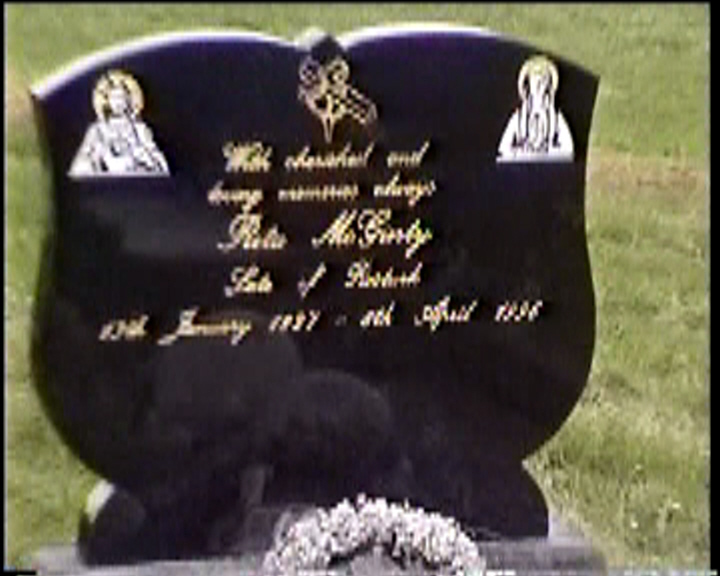 Their son PAT, died 9th Jan. 1999. 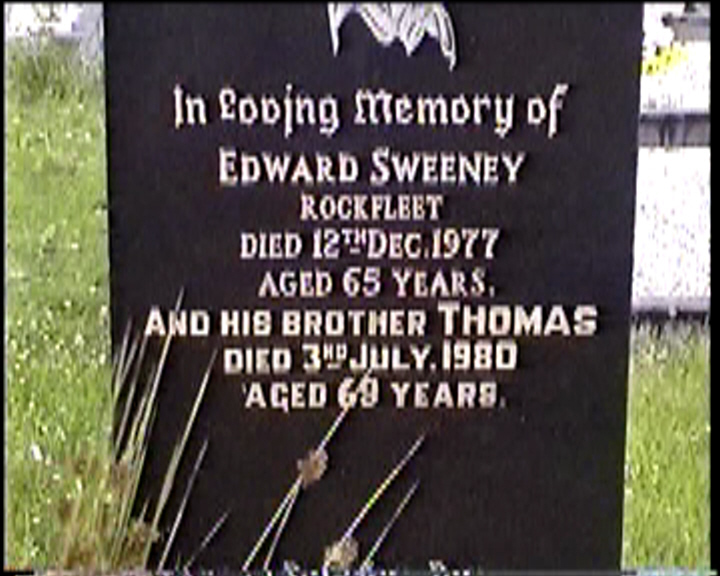 In loving memory of EDWARD SWEENEY Rockfleet died 12th Dec. 1977 aged 65 years. 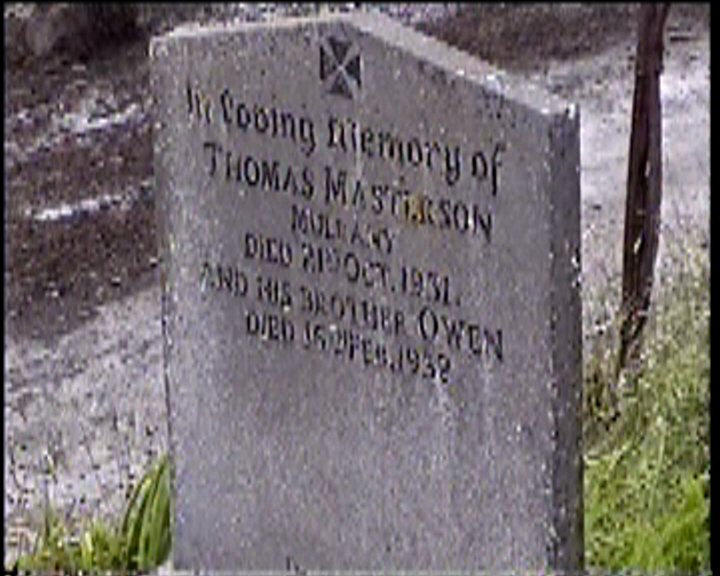 And his brother THOMAS died 3rd July 1980 aged 69 years. 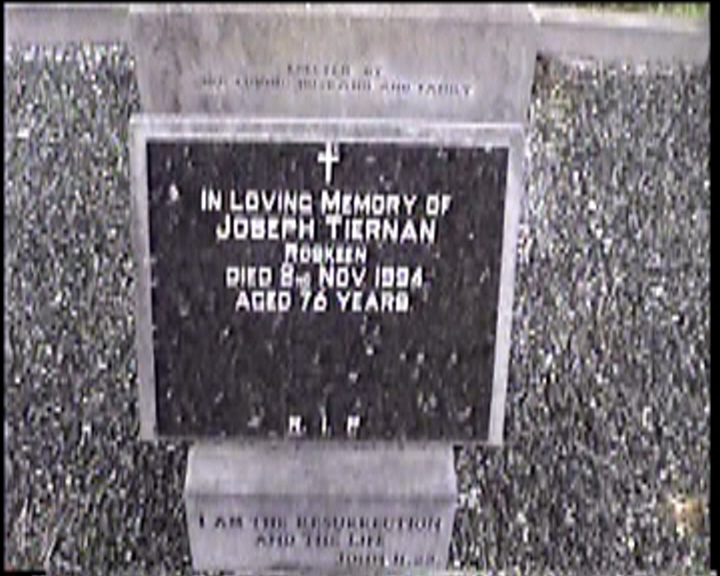 In loving memory of JOSEPH TIERNAN Roskeen died 2nd Nov. 1994 aged 76 years.